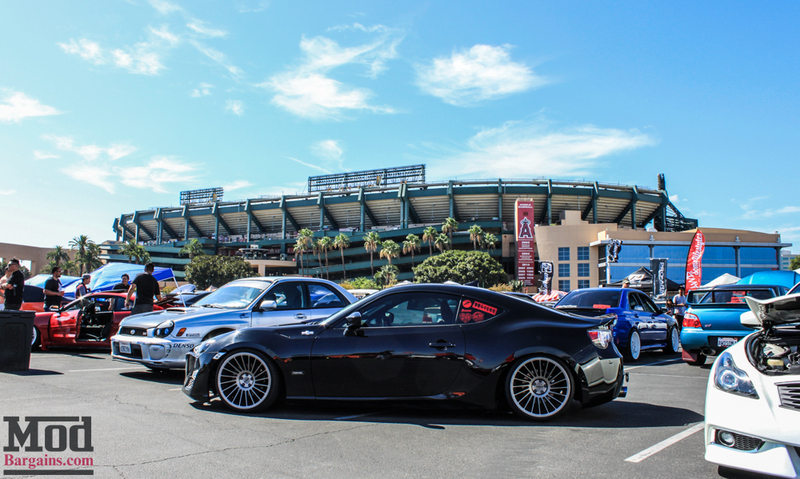 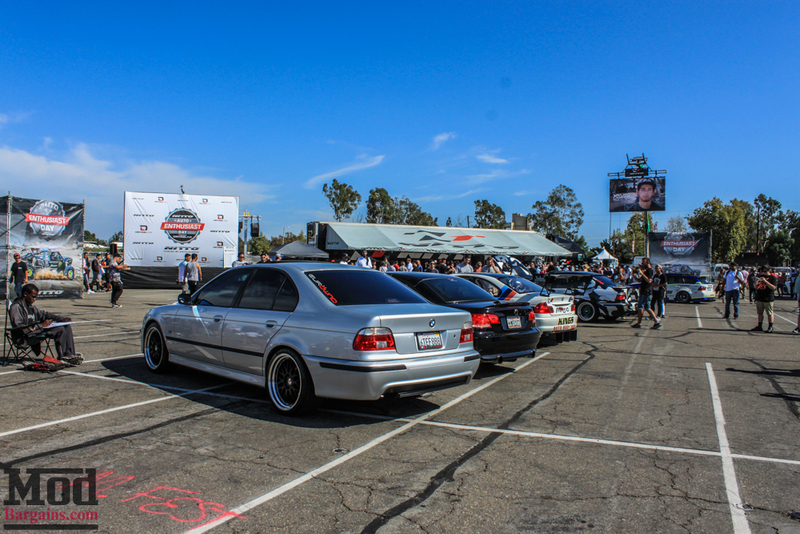 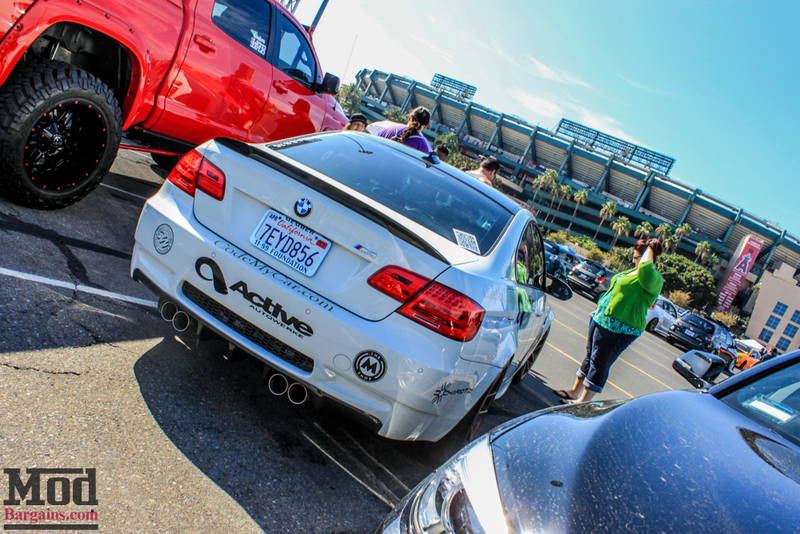 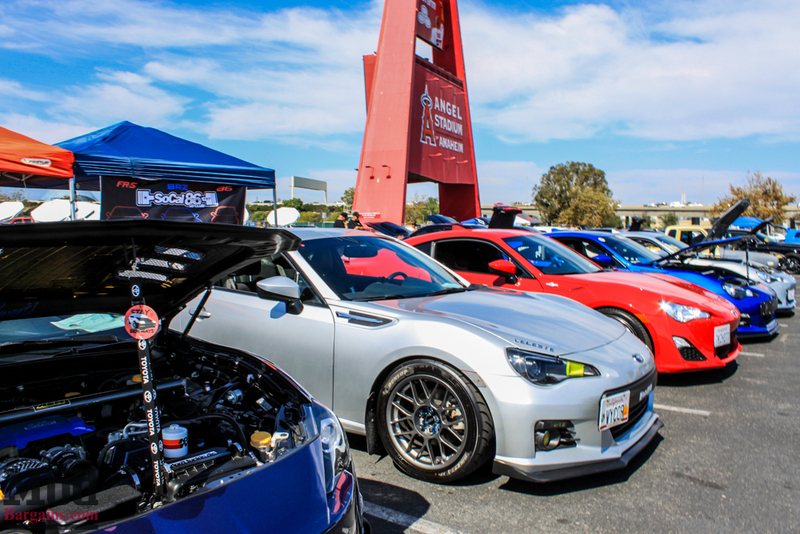 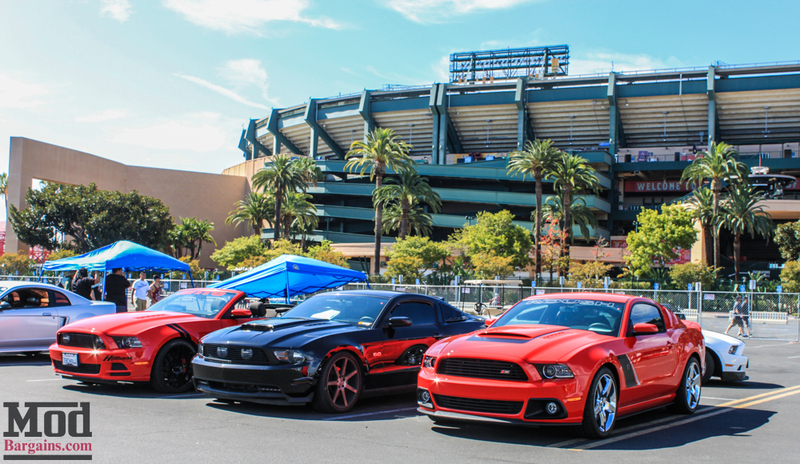 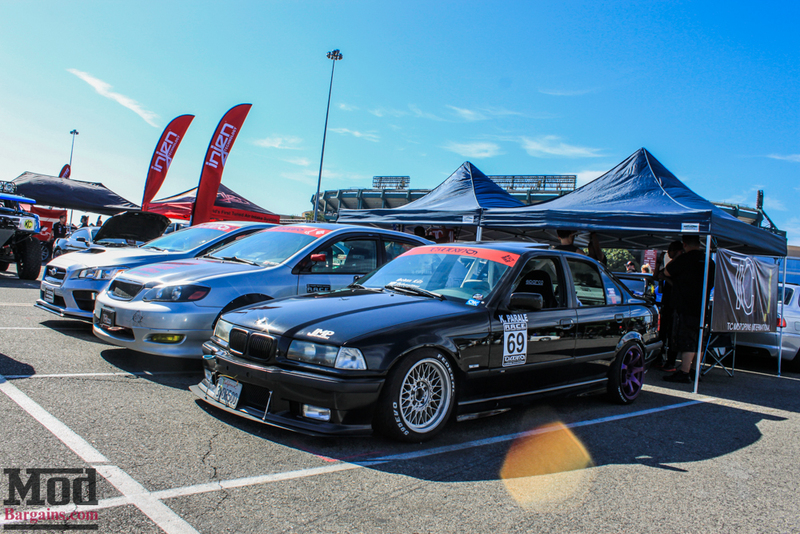 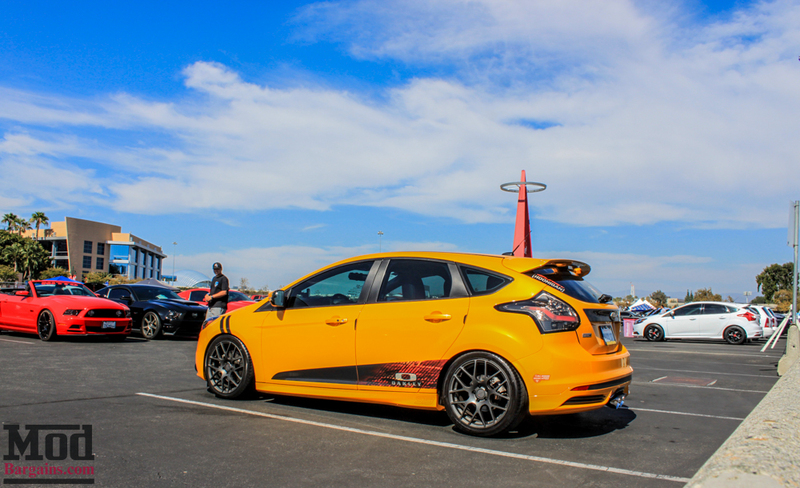 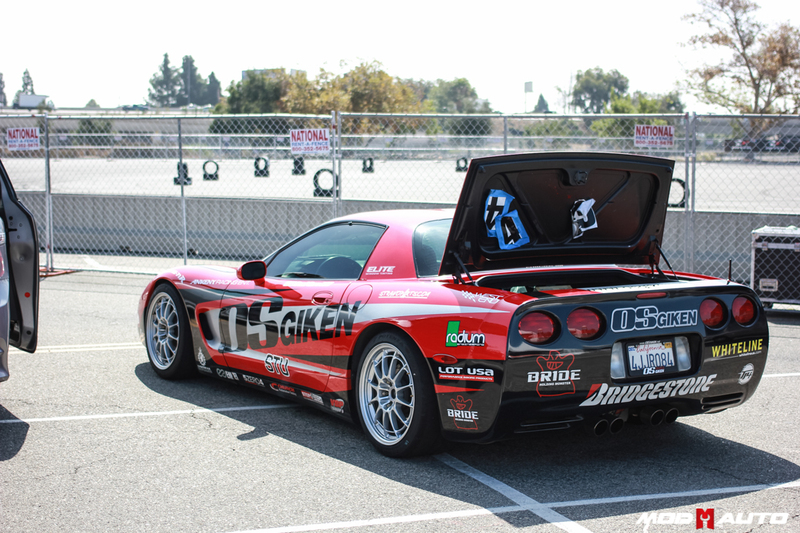 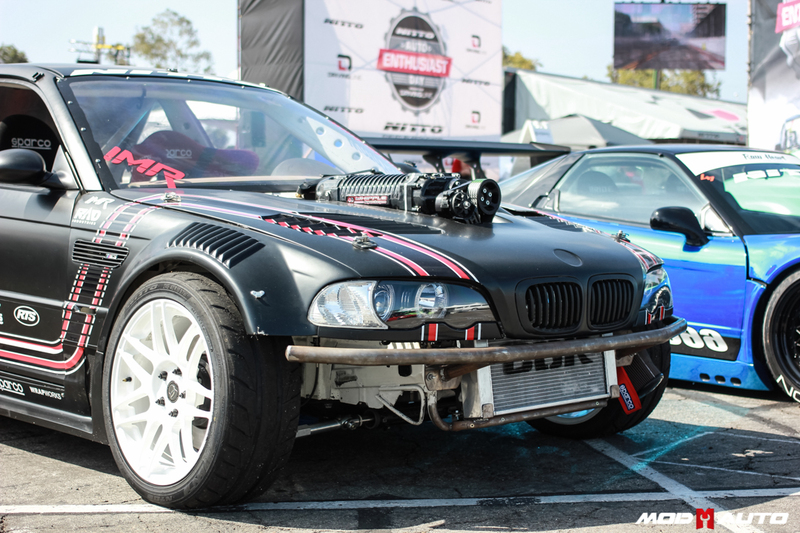 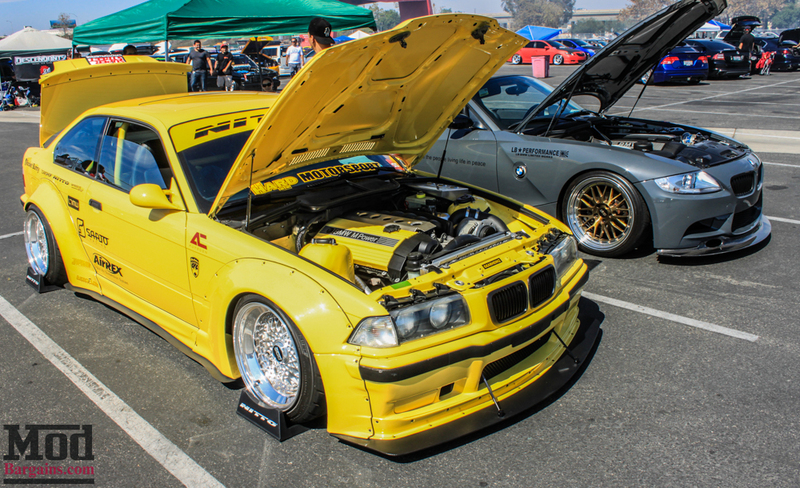 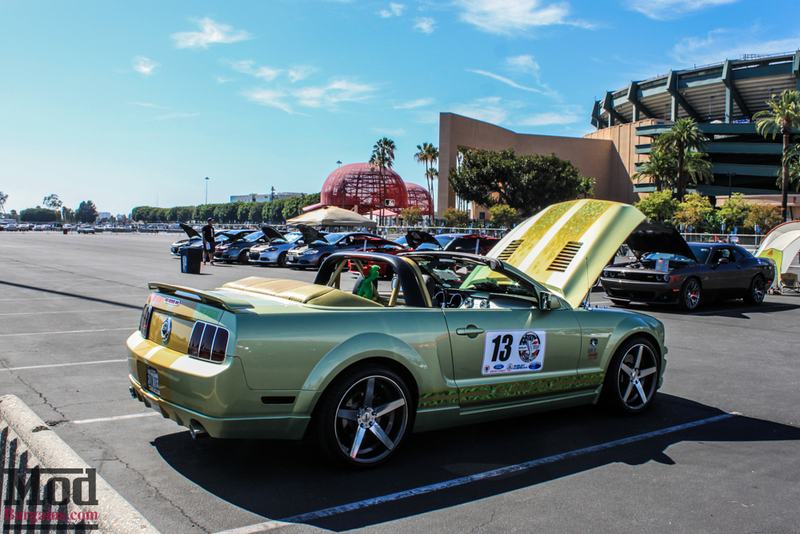 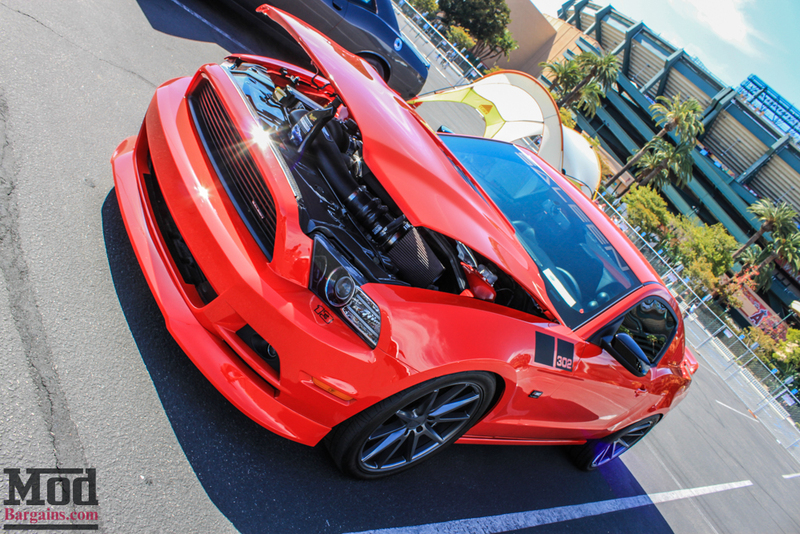 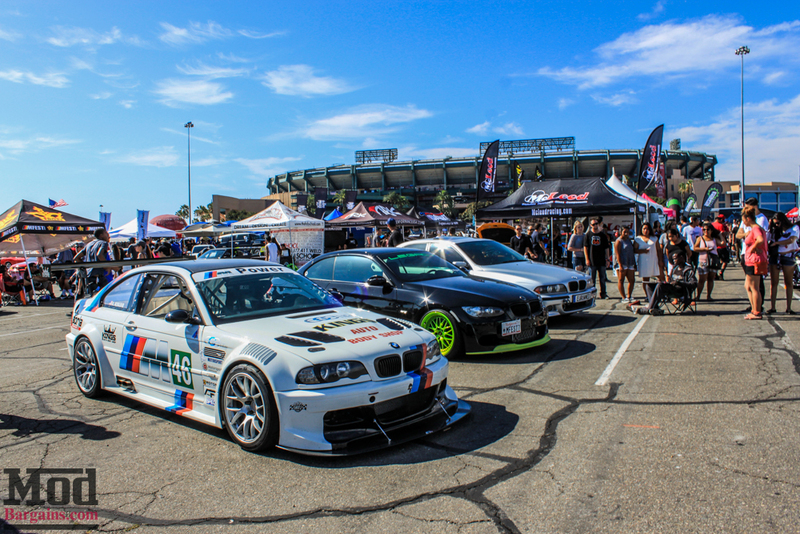 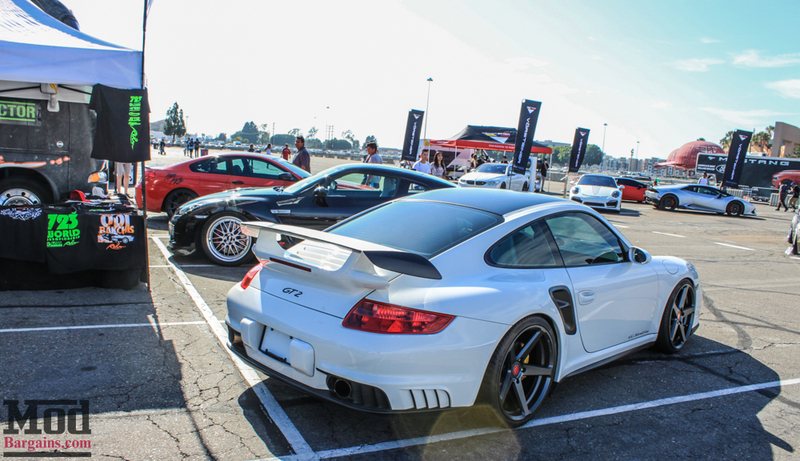 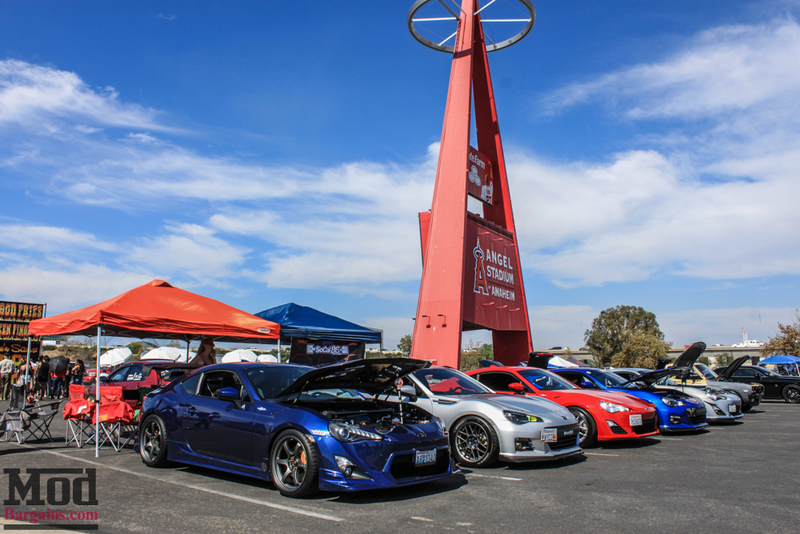 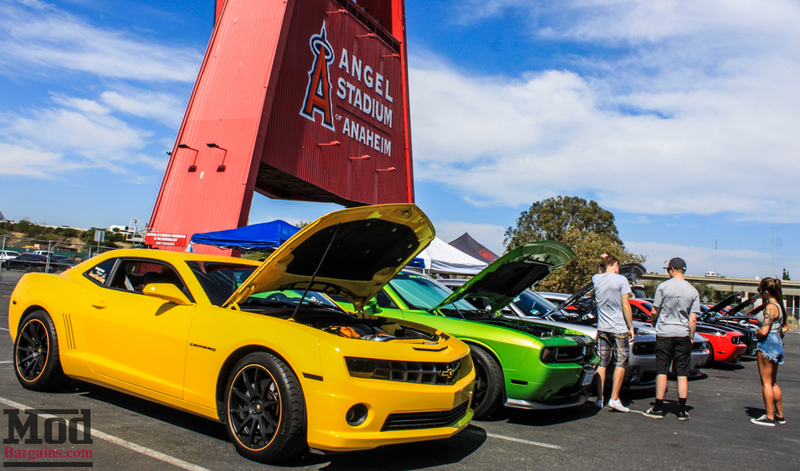 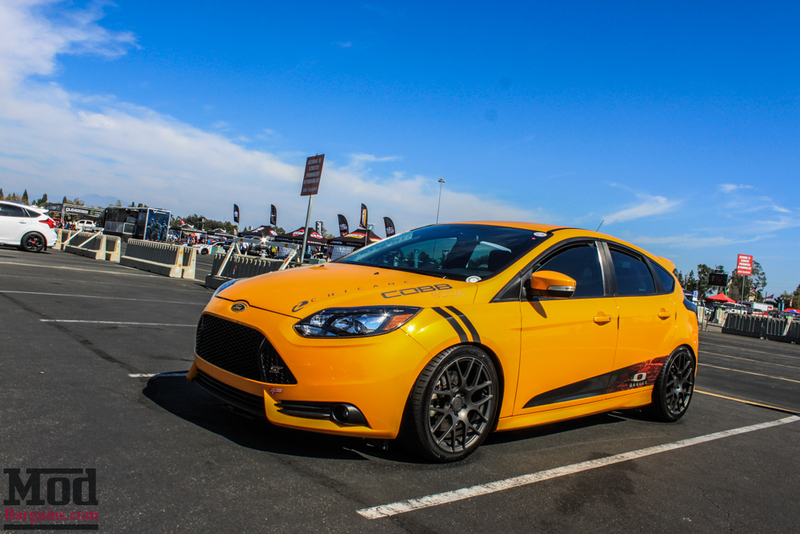 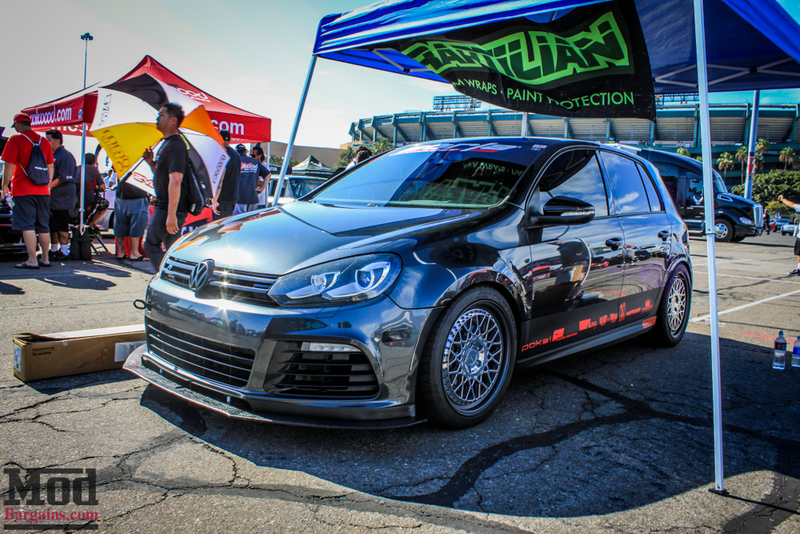 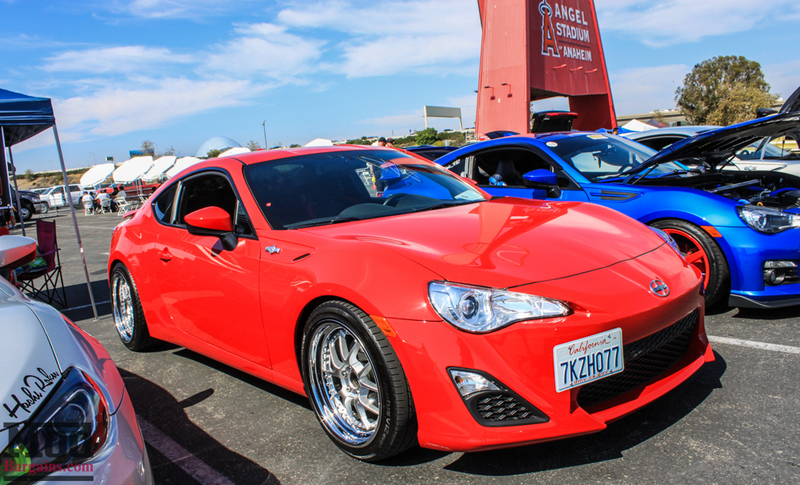 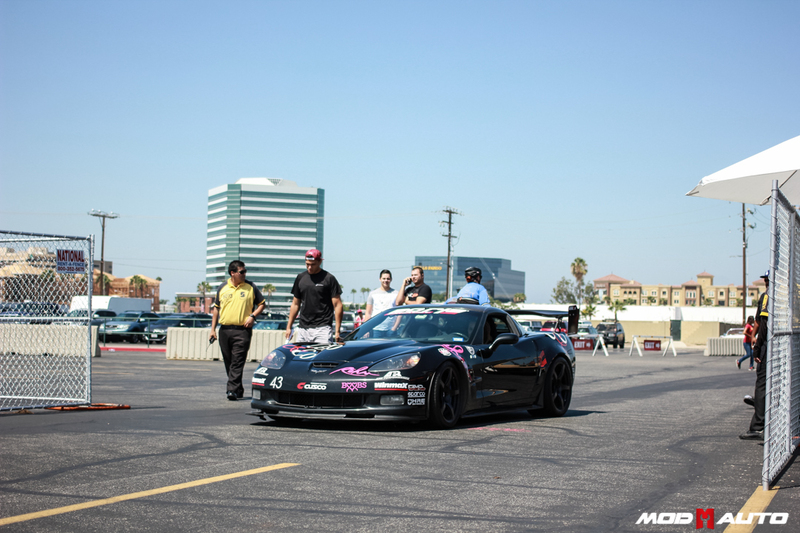 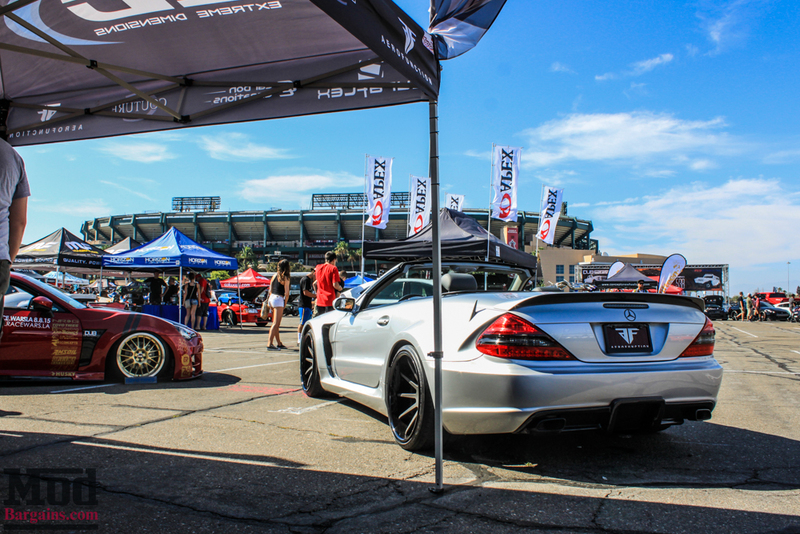 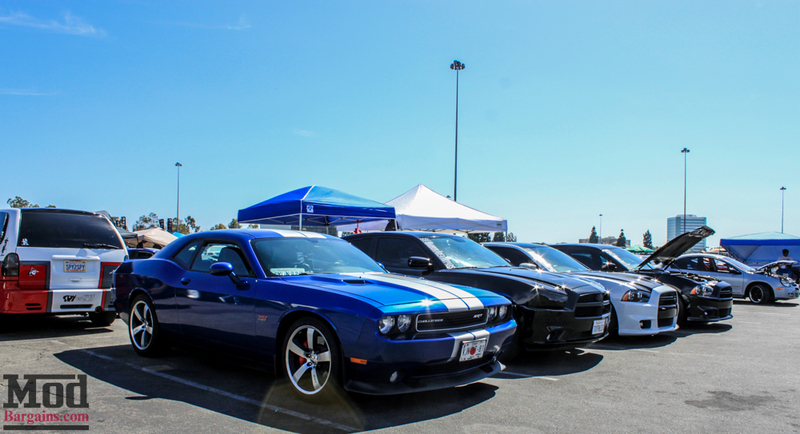 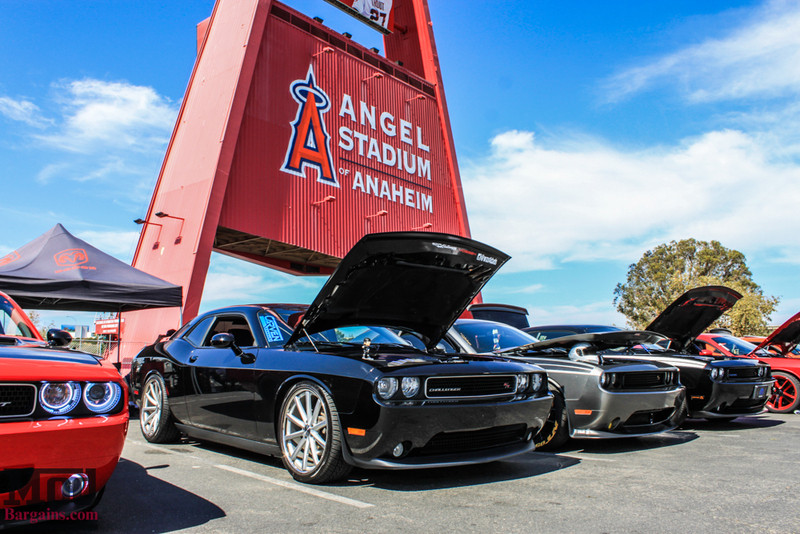 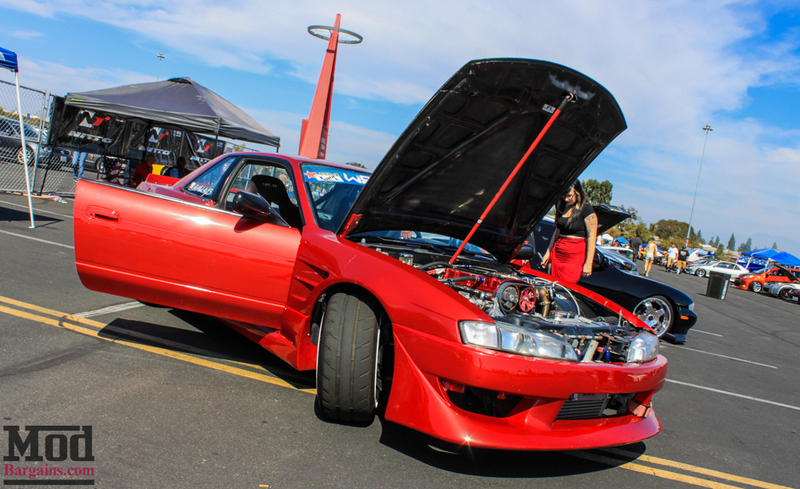 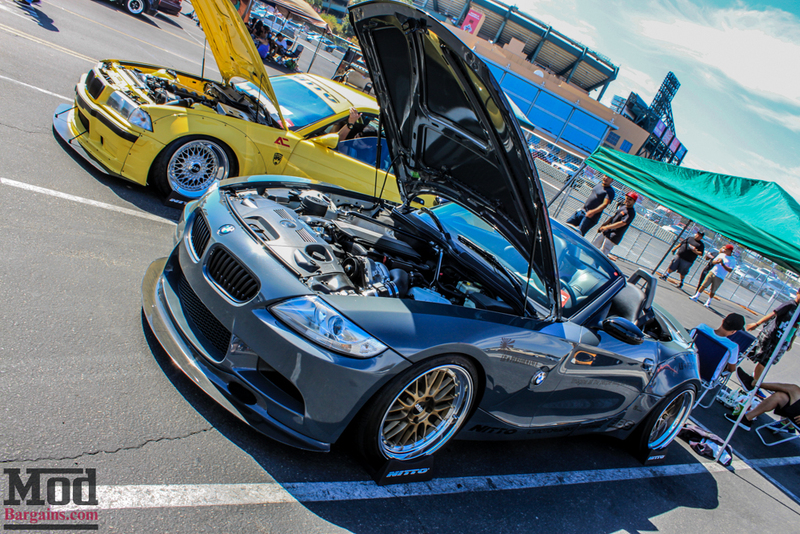 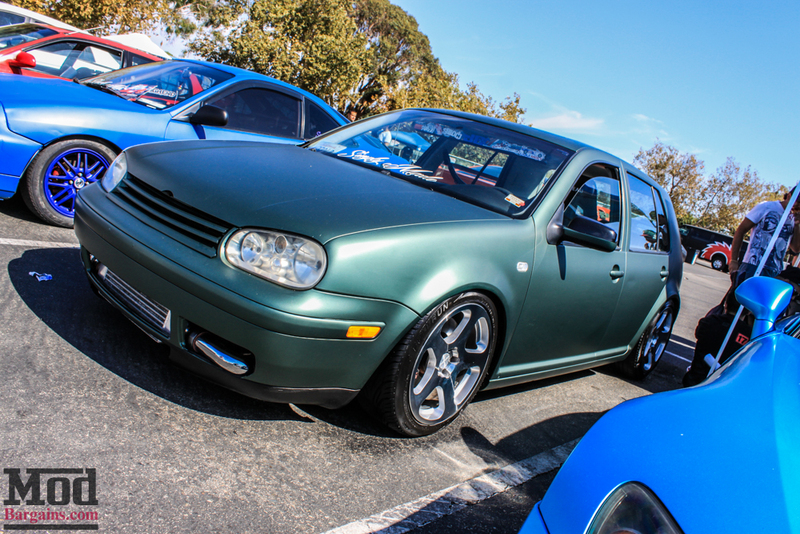 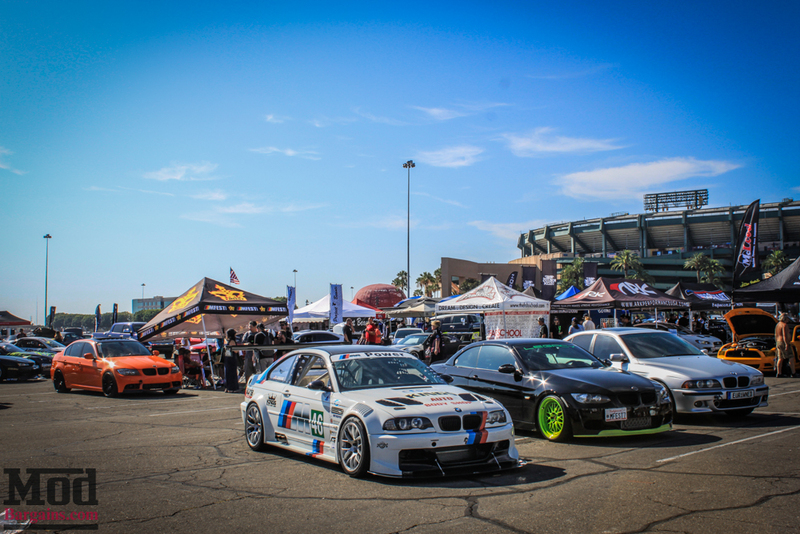 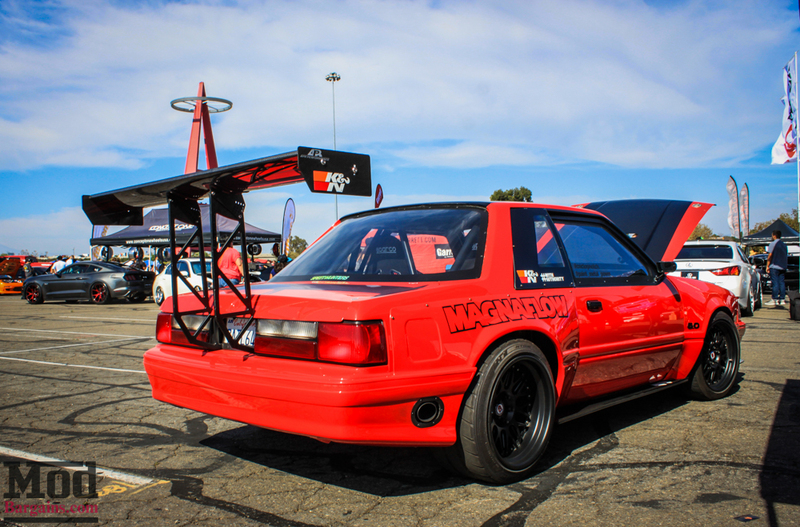 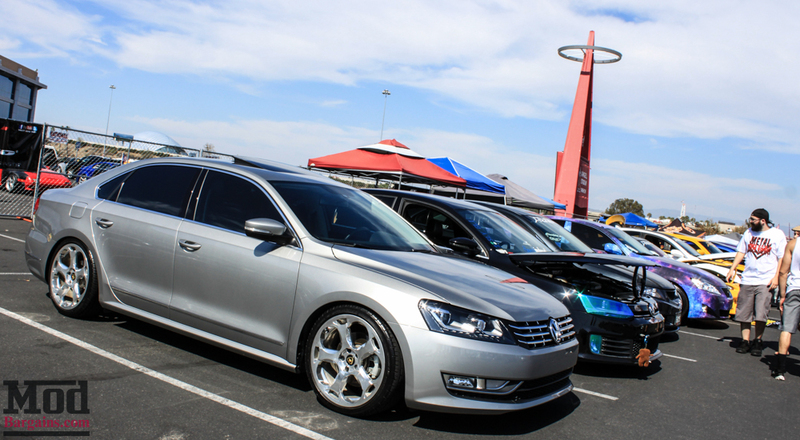 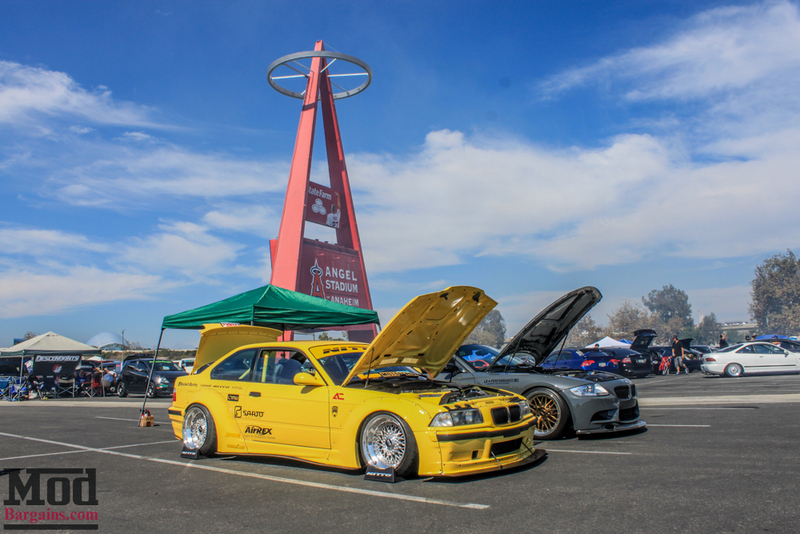 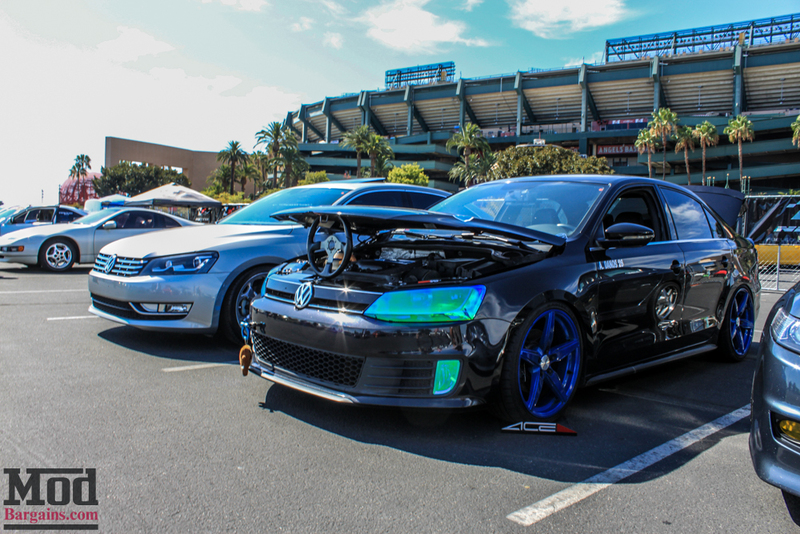 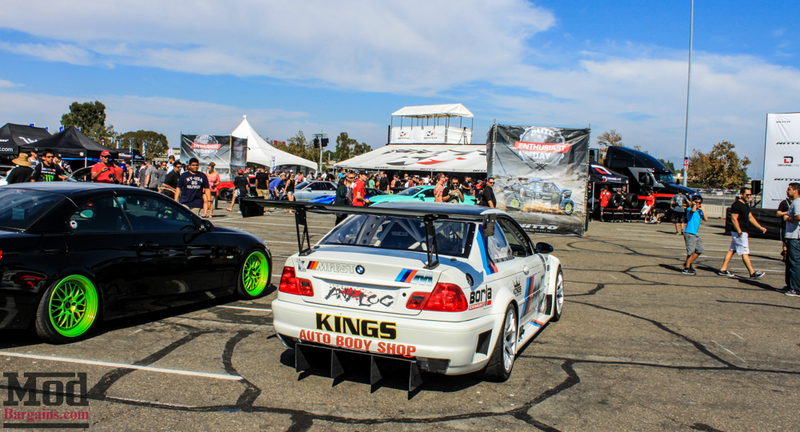 This past Saturday we were invited out to Nitto Auto Enthusiast Day at Angel Stadium in a celebration of all the different flavors automotive enthusiasm comes in, autocross, motocross, drifting, off-roading, stance, street – domestic, import and Euro all mashed up in a single event. 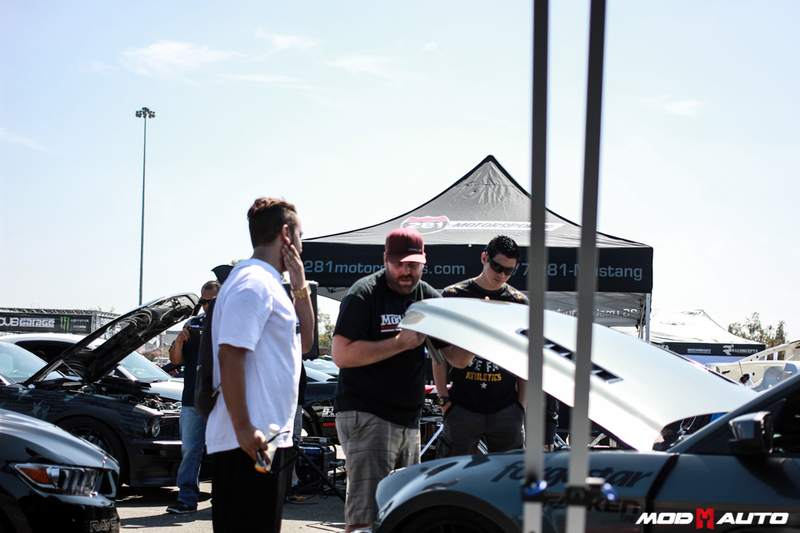 We brought out Mike’s Dad’s Scion FR-S, Co-Founder Mike‘s CTS-V, Mod Expert Jurrian‘s Widebody Ford Mustang GT and a 2015 Ford Mustang GT. 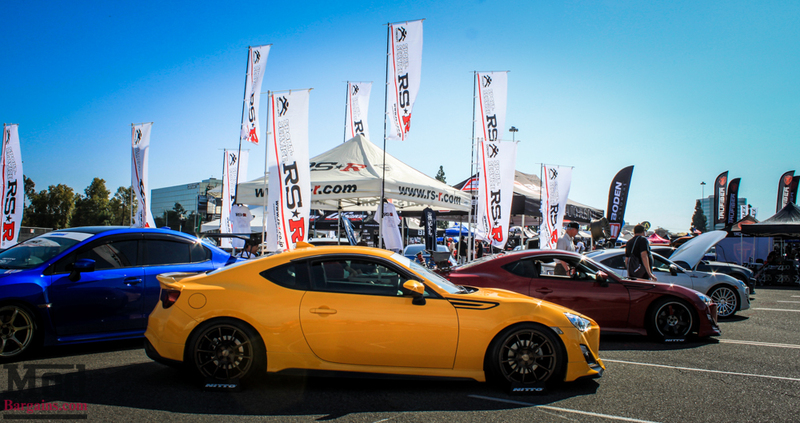 We’ll start with the FR-S and BRZs at the show. 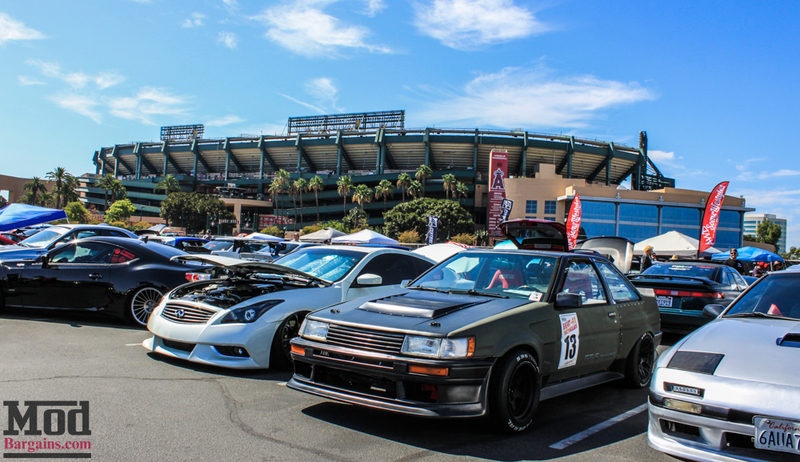 This gathering of 86s from “SoCal 86” looked fantastic together and made for a great photo with the Angel Stadium “A”. 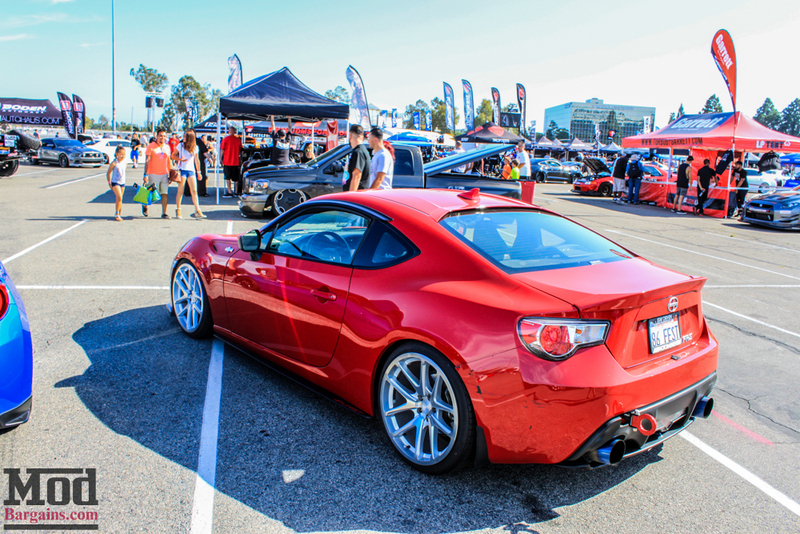 Toyota invites us all to “Mas Que Un Auto” or Name Your Car, as this SoCal 86 member has – his Subaru BRZ is dubbed “Celeste”. 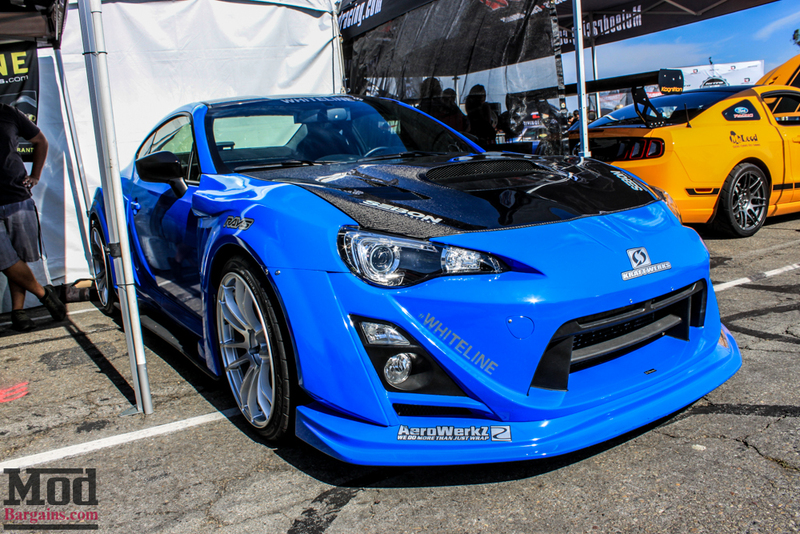 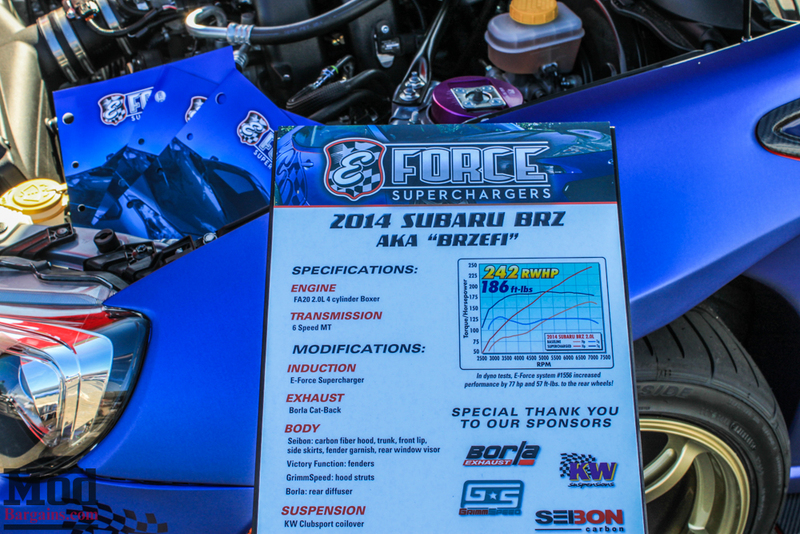 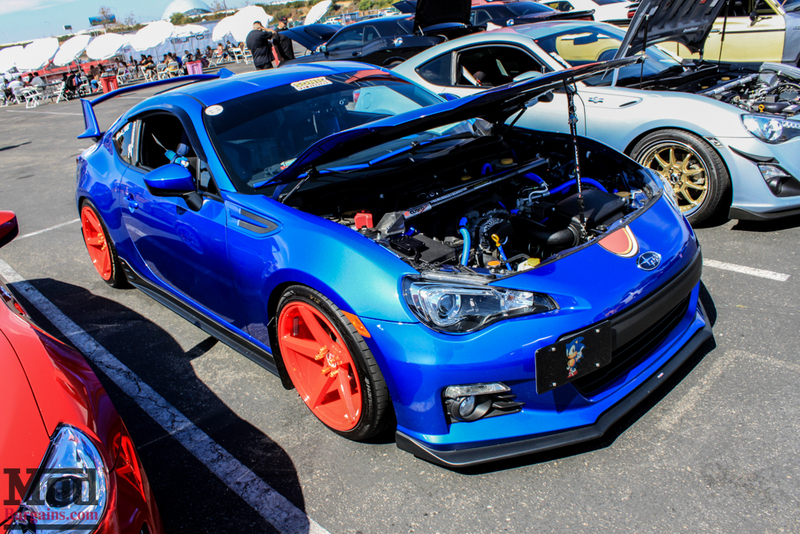 This Sonic Blue Subaru BRZ reminded us of the oldschool Transformers Autobot SKIDS and Smokescreen. 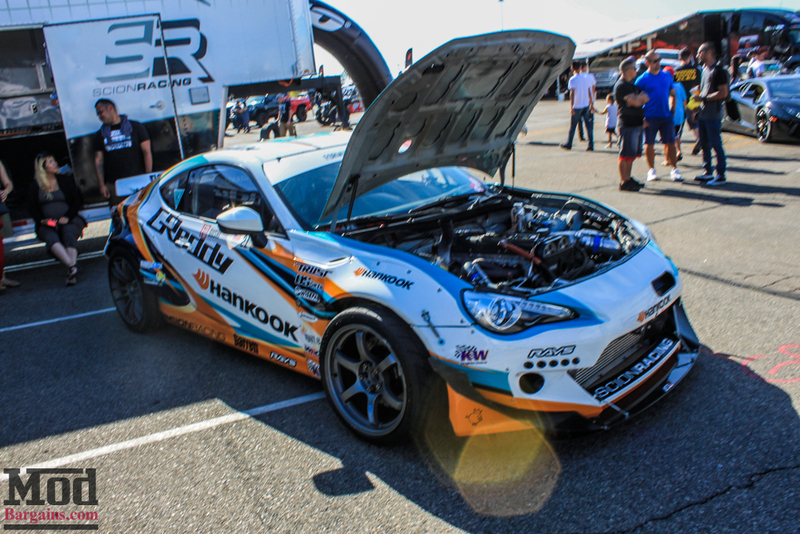 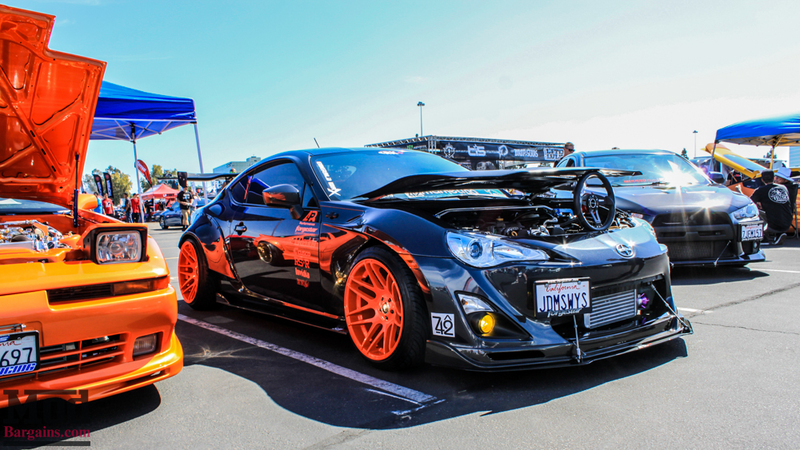 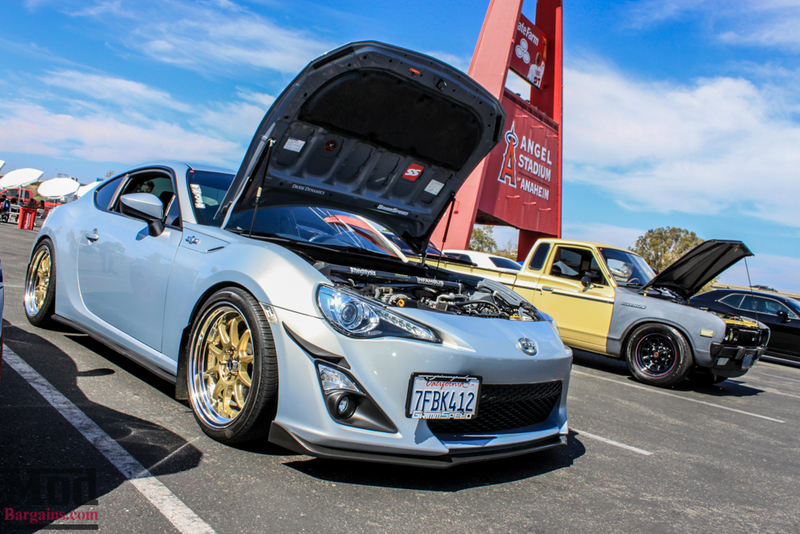 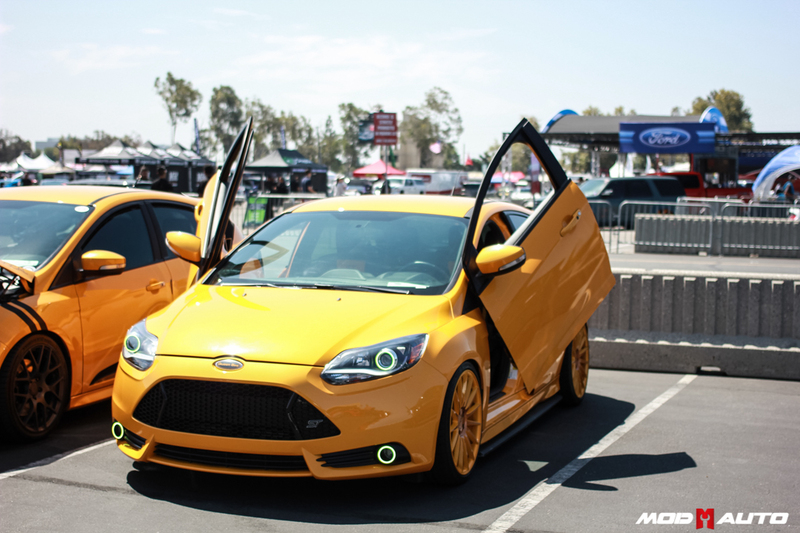 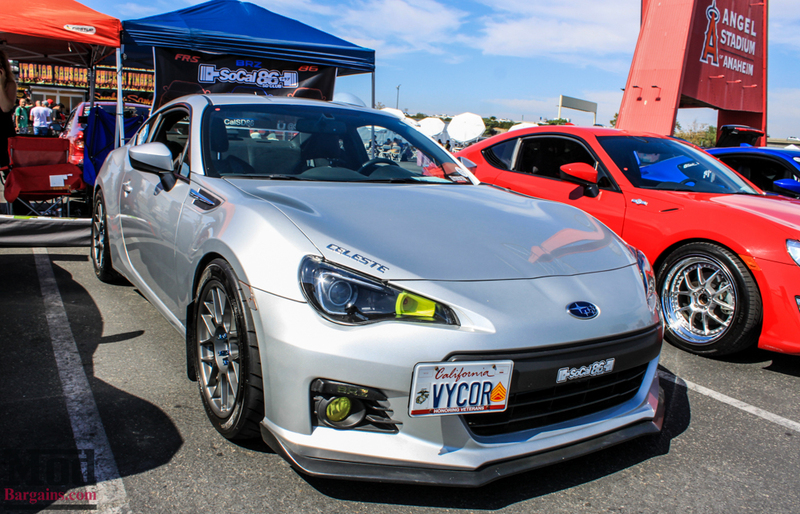 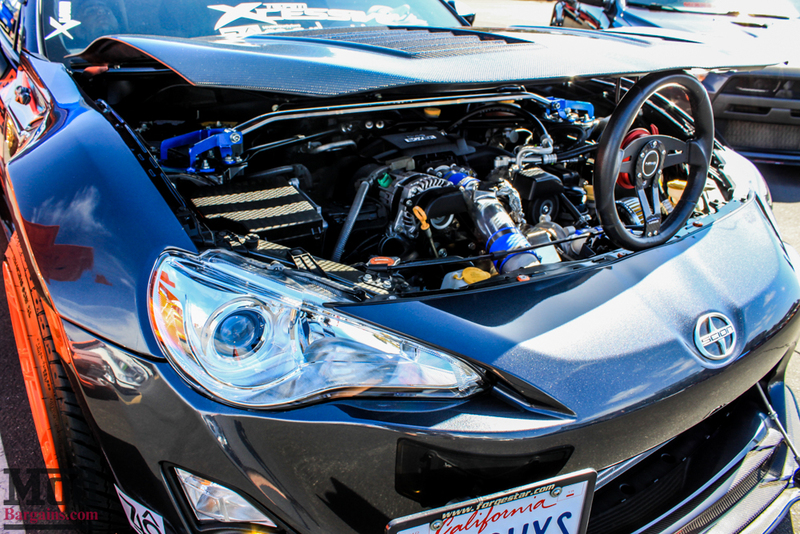 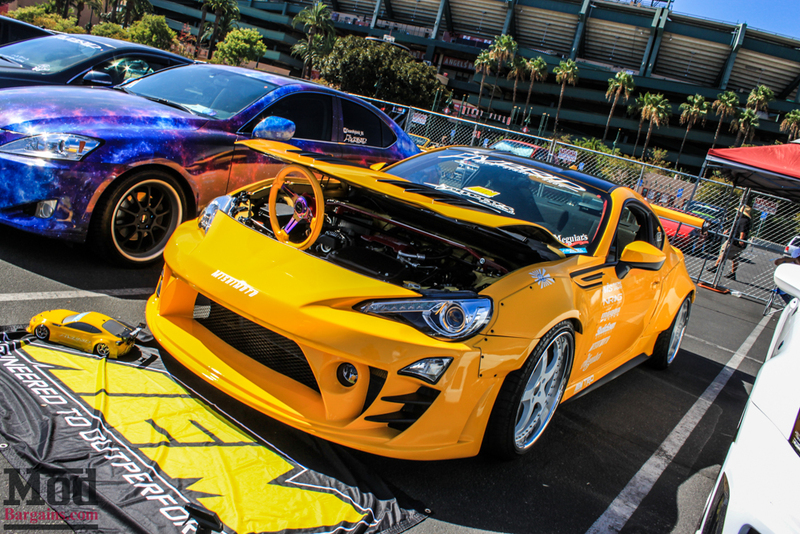 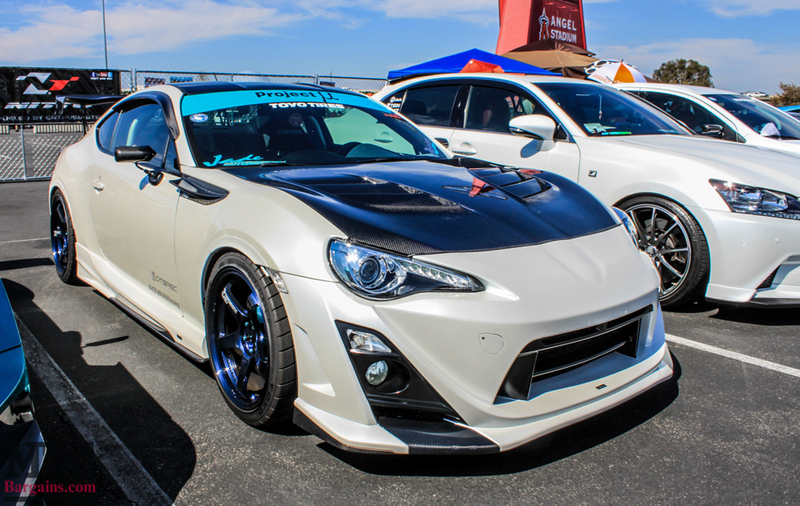 This Scion FR-S was rocking a few upgrade by Grimmspeed. 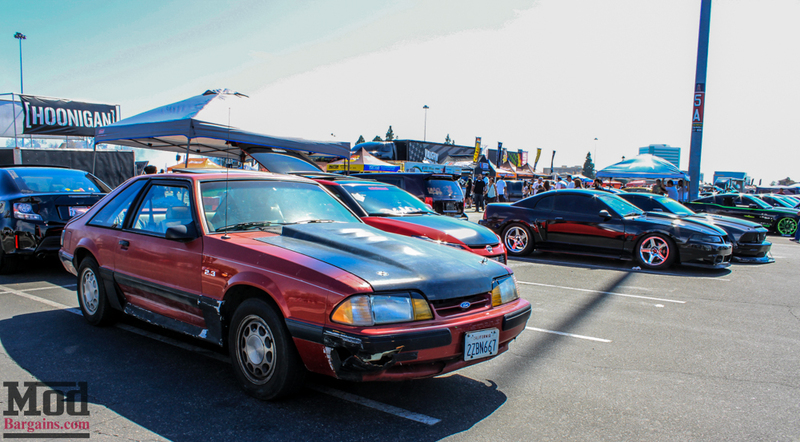 This Toyota Corolla AE86 notch boasted a JDM Toyota Levin fixed-headlight front end conversion. 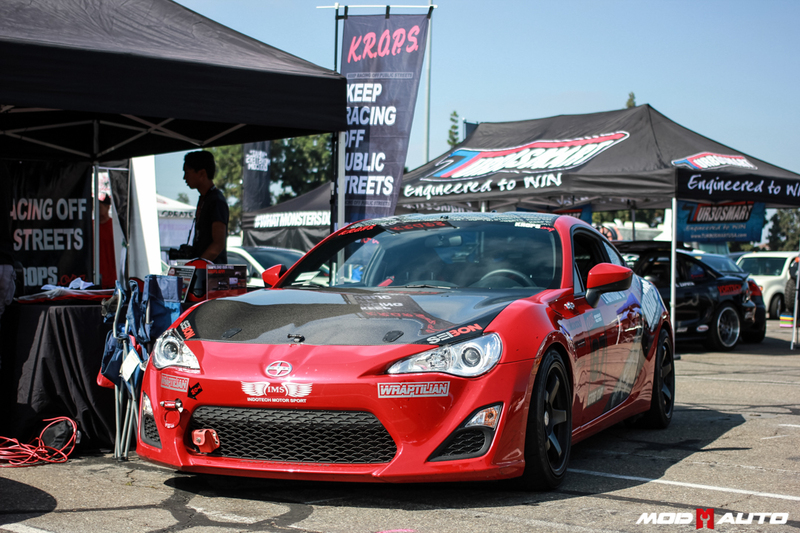 This Scion FR-S was rocking a set of 18in Forgestar F14 Super Deep Concave wheels to match its widebody fender flares. 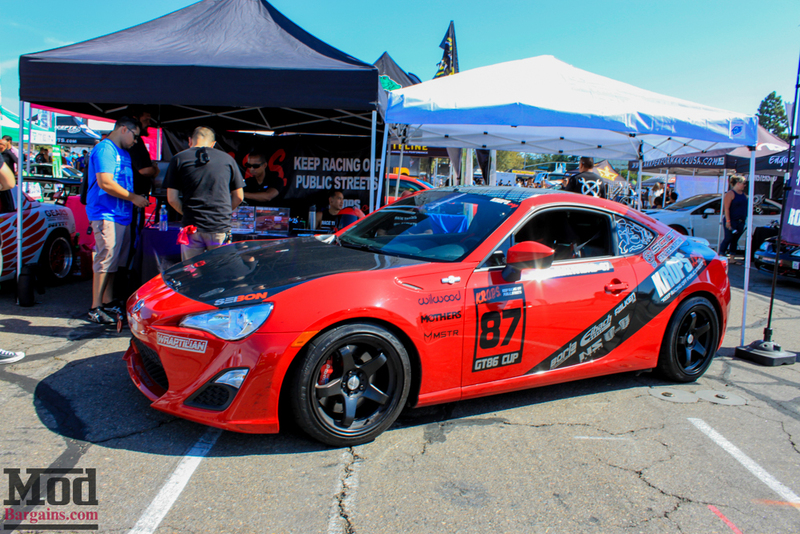 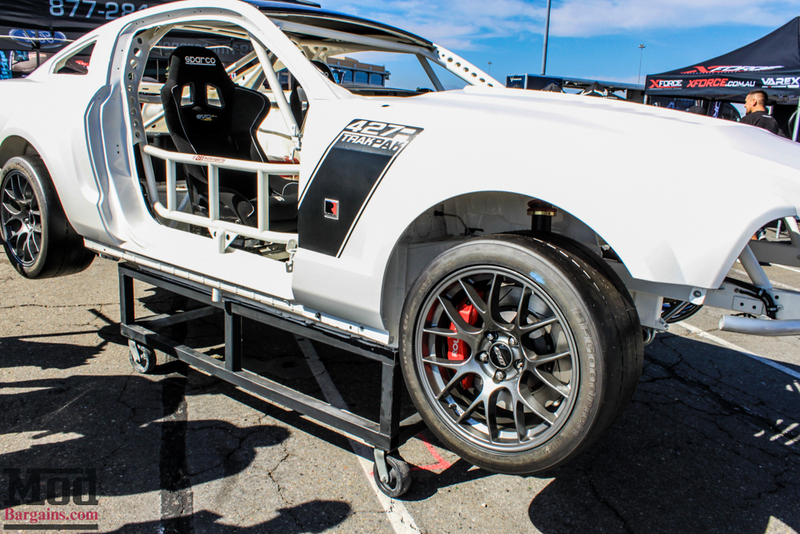 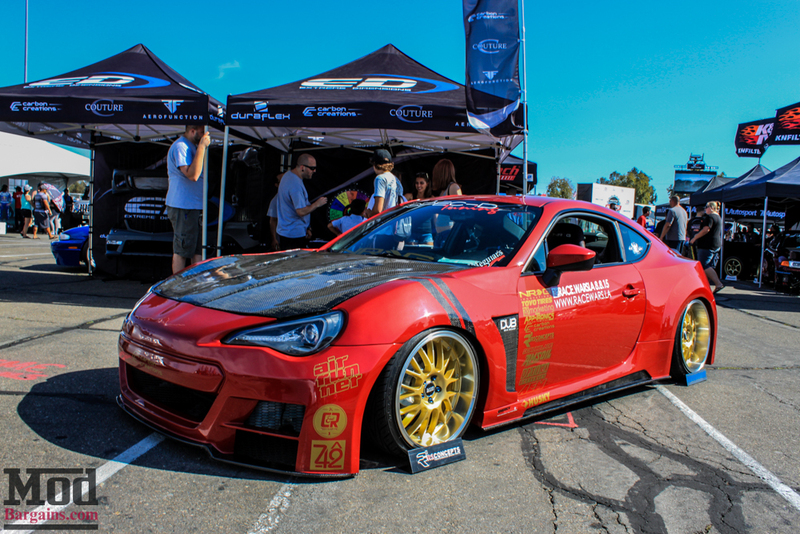 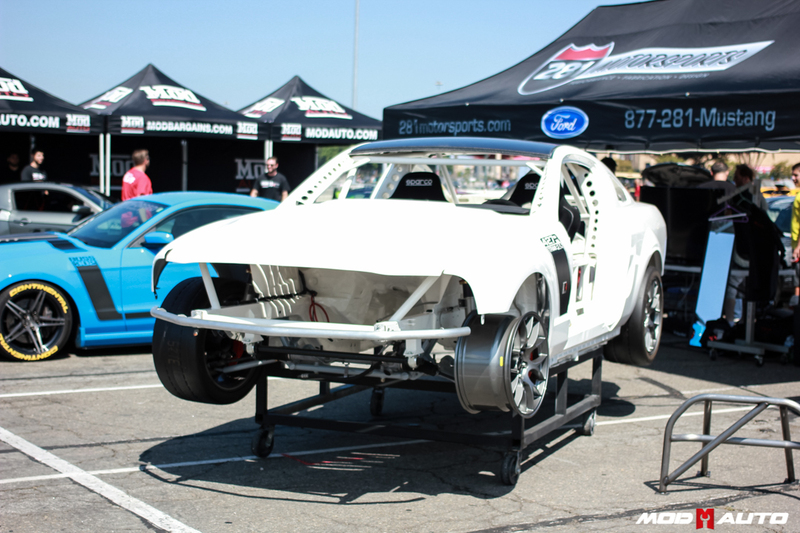 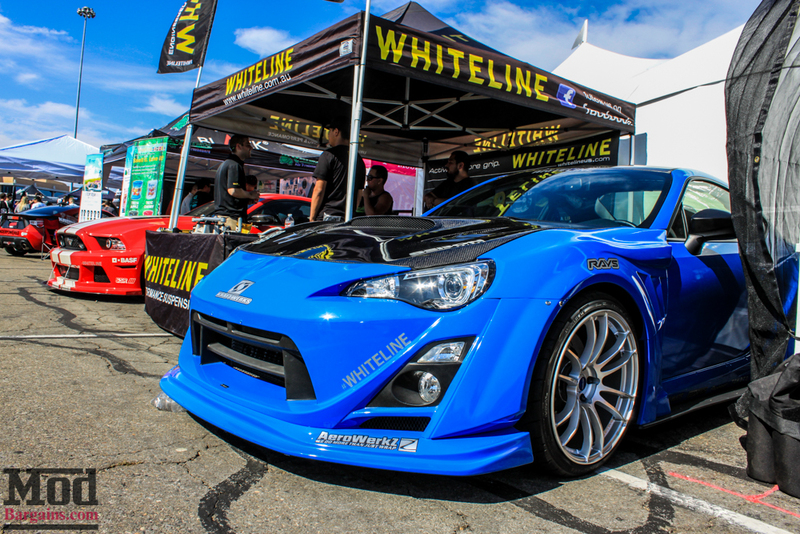 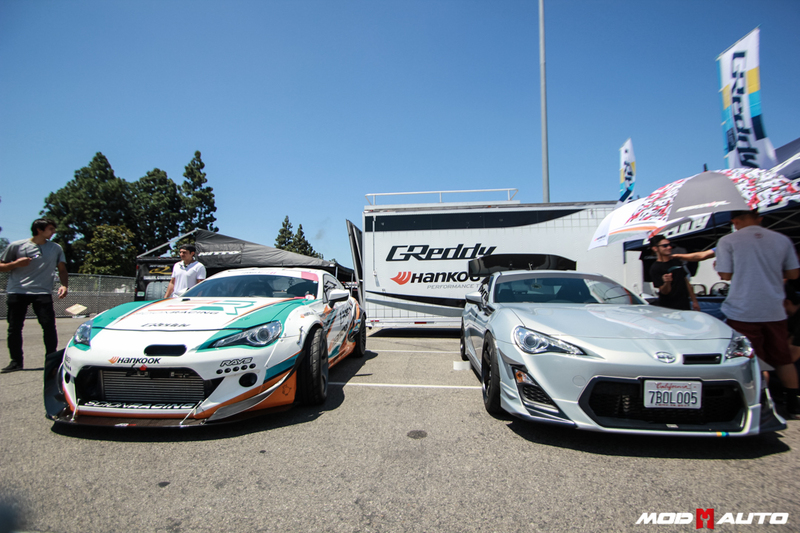 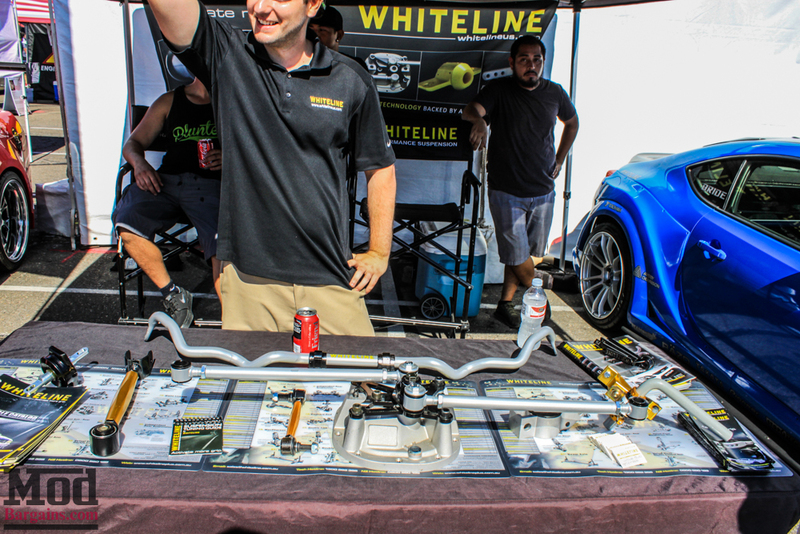 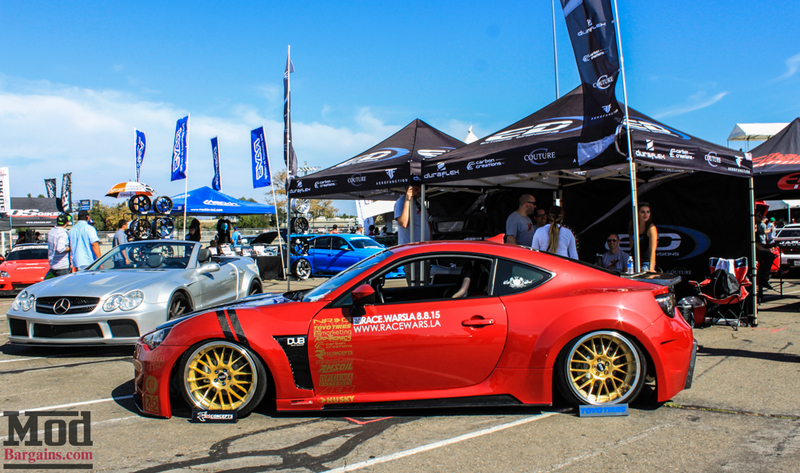 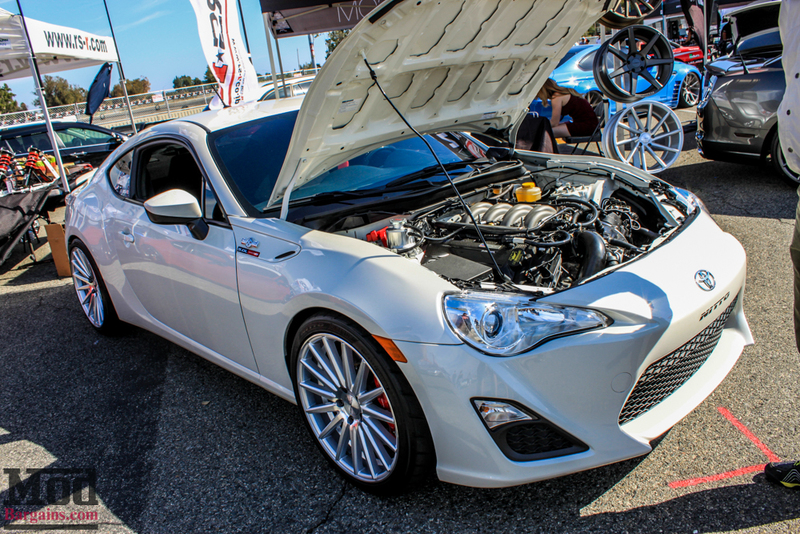 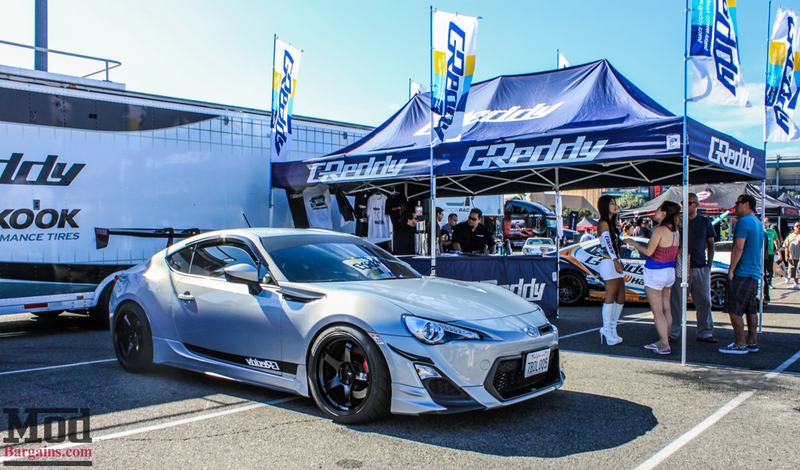 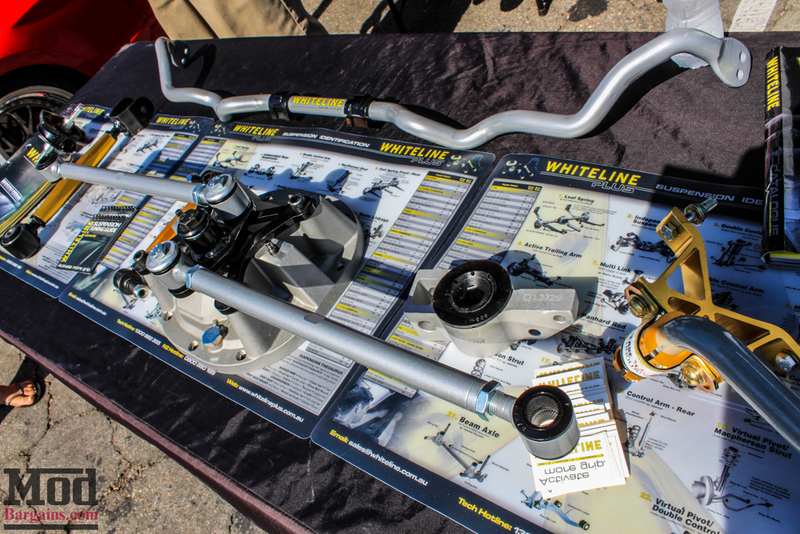 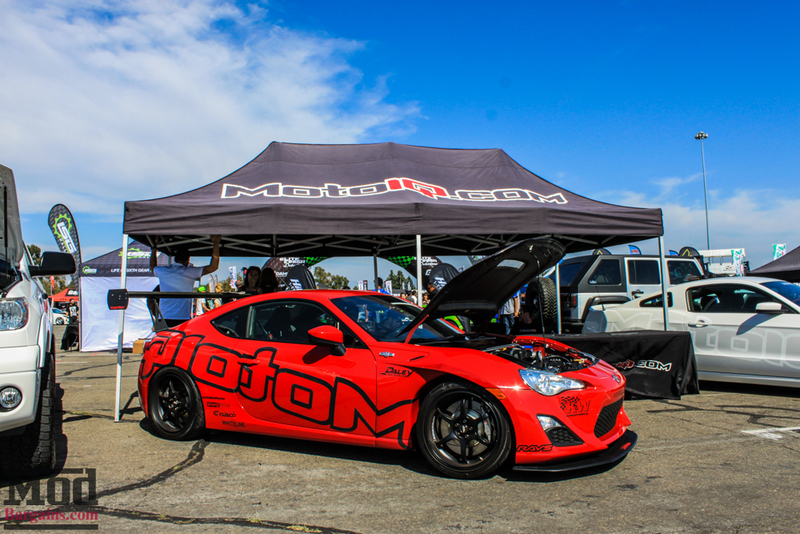 Our friends at Whiteline Suspension were out, showcasing their goodies for the FR-S and BRZ. 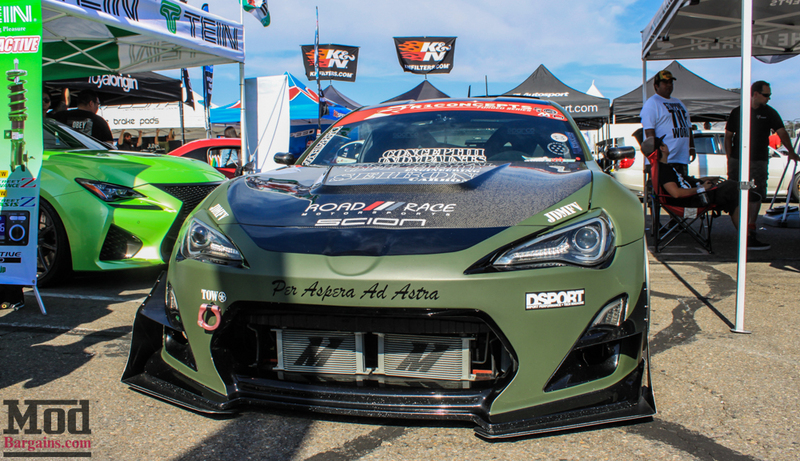 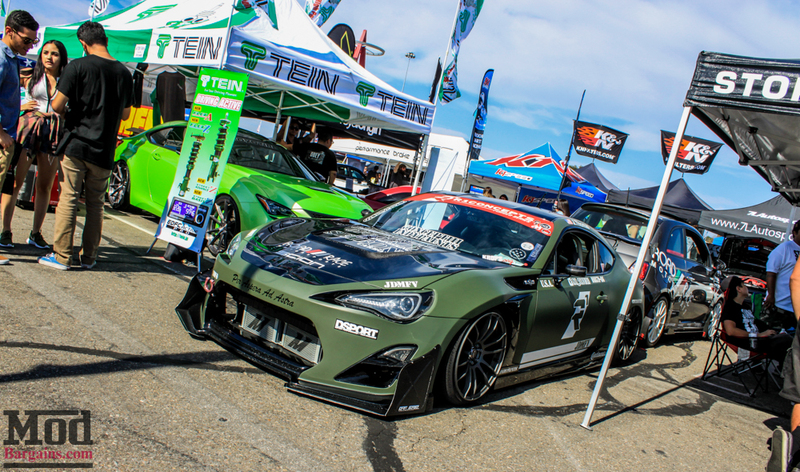 R1 Concepts brought out their Army Green Scion Subaru BRZ (we think it’s a BRZ? 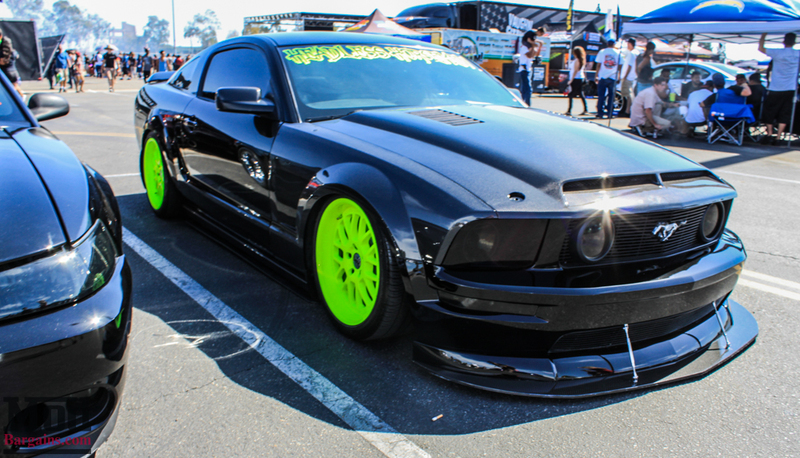 who knows.) 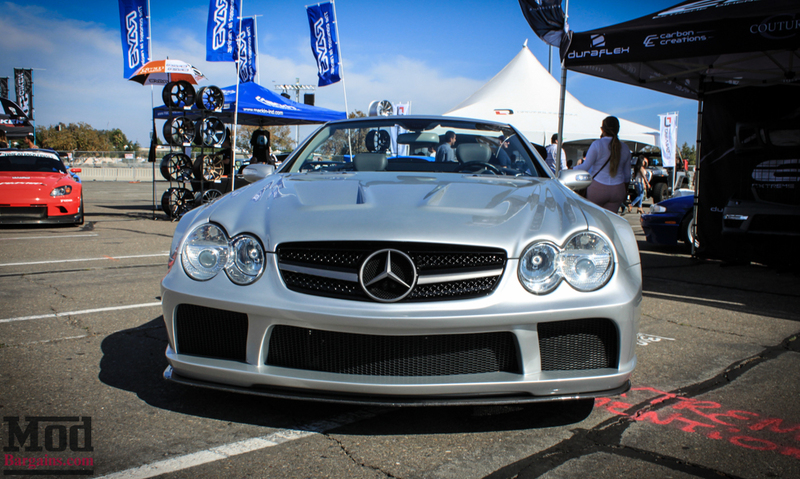 with its super-aggressive front endplates. 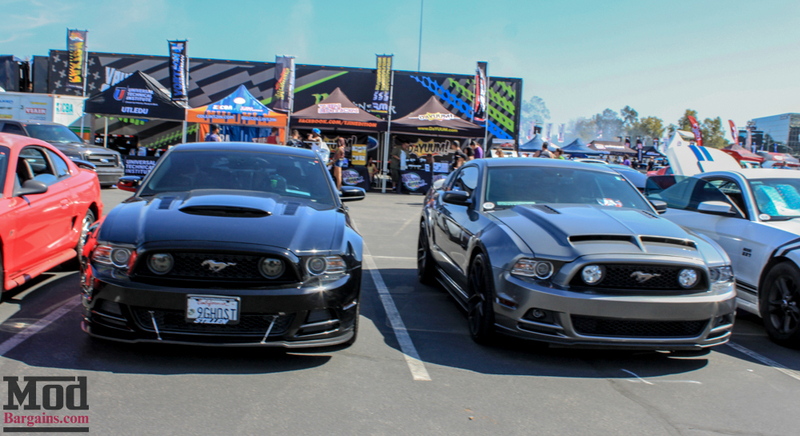 They’d also make some sweet bookends. 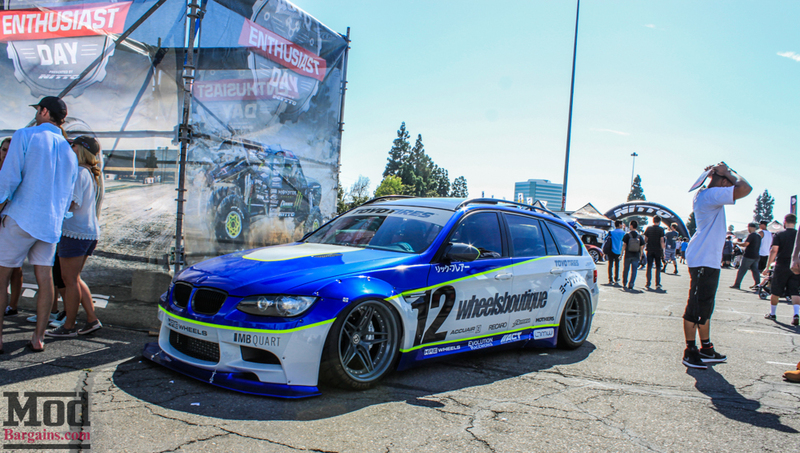 Extreme Dimensions brought out their best carbon to show off. 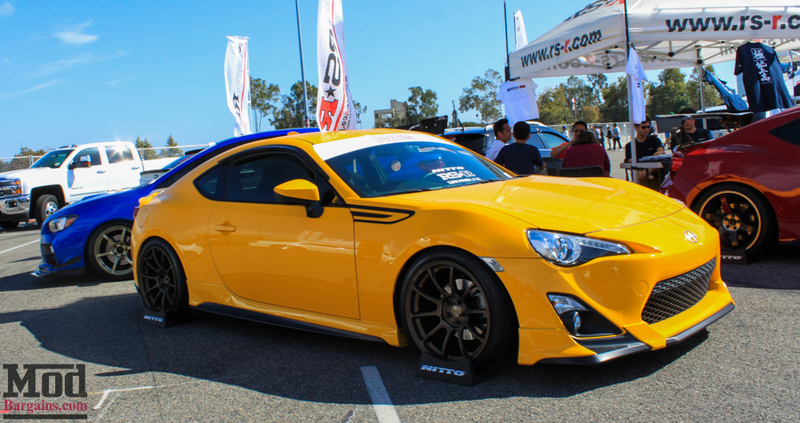 Over at the RS-R Suspension booth, our friends at Rally Innovations were also there – a trio of different FR-Ses were on display- the silver car boasted a Coyote 5.0L V8 under the hood, whereas the yellow Scion FR-S RS 1.0 is one of the few we’ve seen NOT on stock wheels. 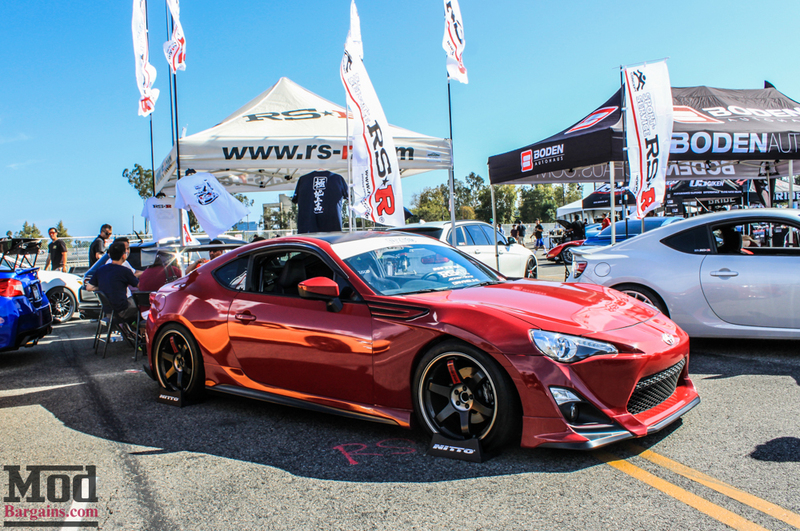 RS in RED? 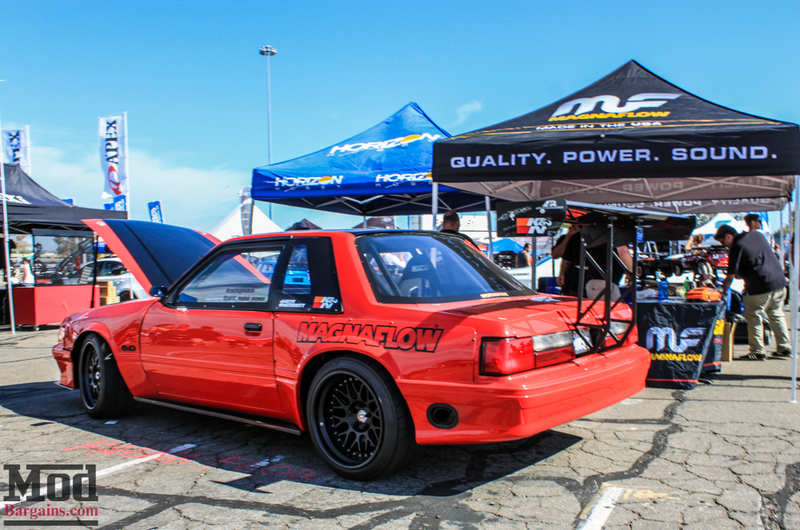 “FIXED THE TORQUE DIP!” 86 Fest Crew in red. 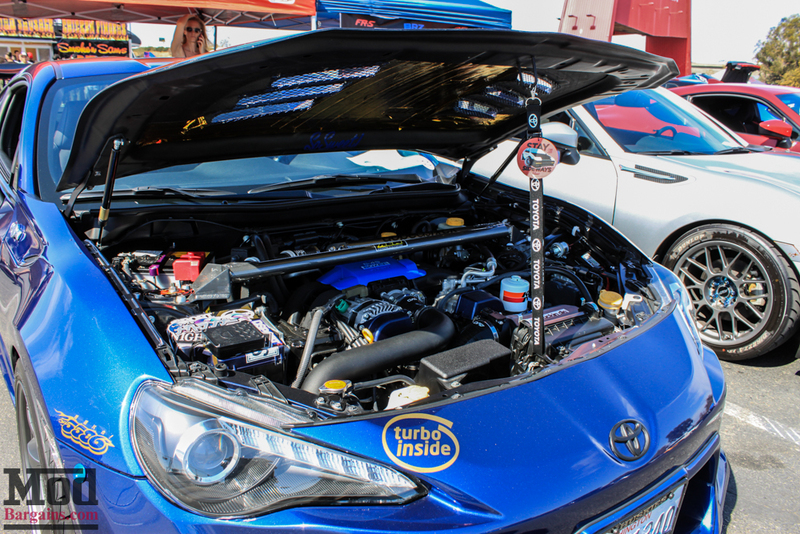 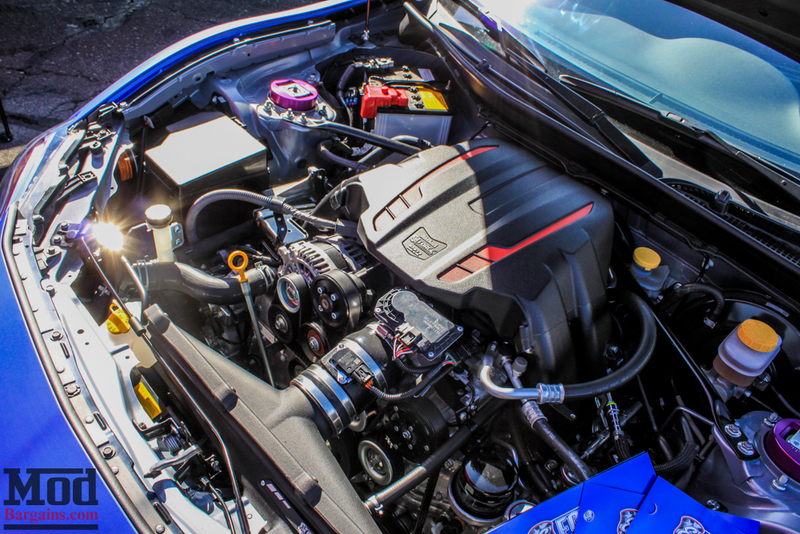 Even old-school muscle modded Edelbrock is in the FR-S game now, their “BRZEFI” boasts a E-Force Supercharger kit to resolve the Toyobaru’s power defecit. 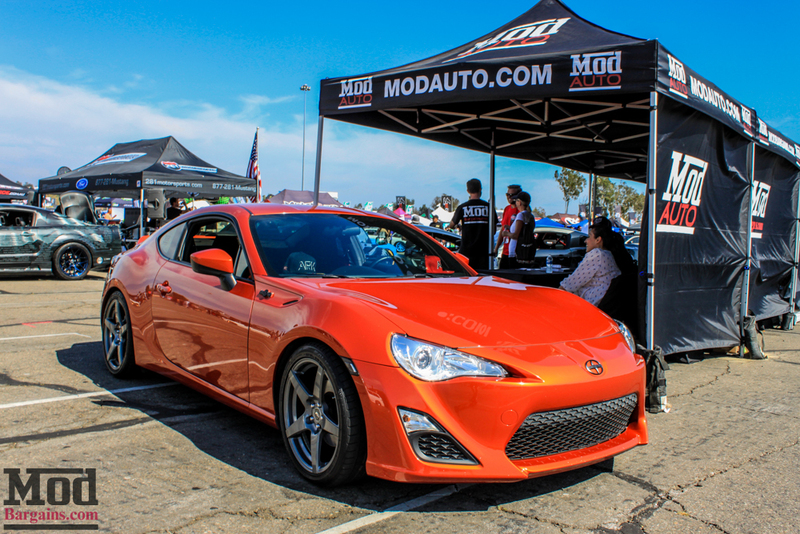 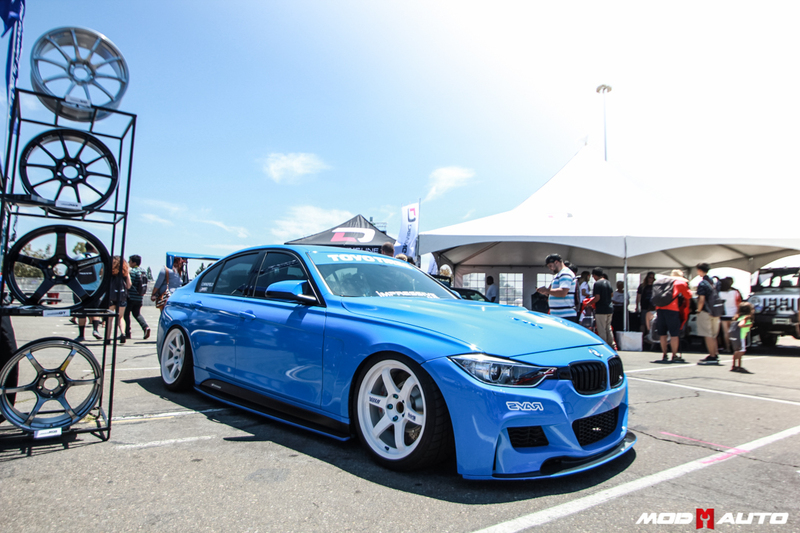 That wraps it up for the Scion FR-S and Subaru BRZ portion, now let’s move on to our personal favorite -modded BMWs. 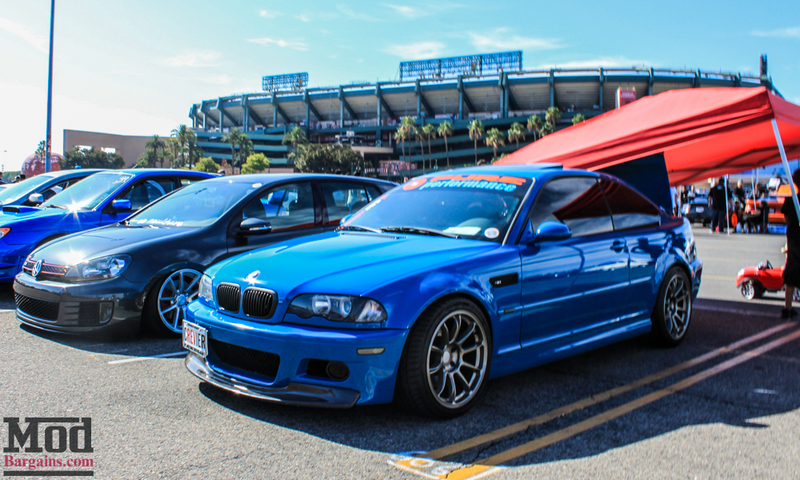 No matter how many we see, we never seem to get tired of the classic lines of the BMW E46. 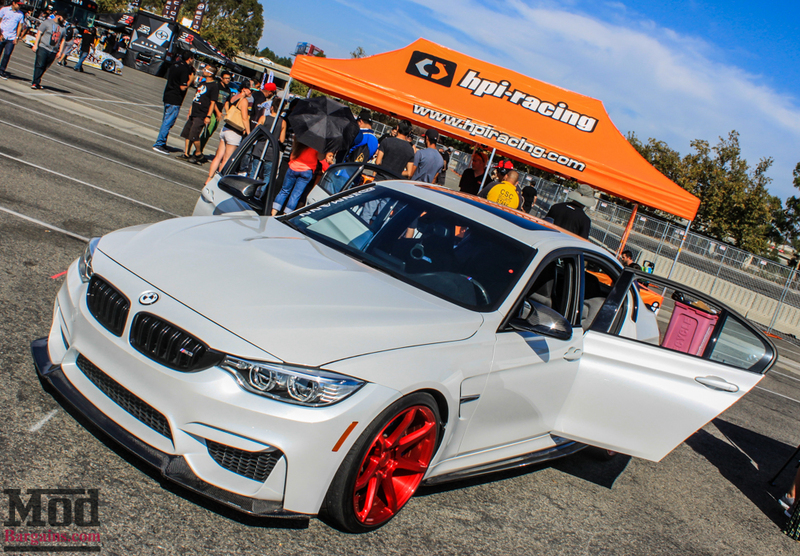 This BMW M3 sports bright red wheels and carbon fiber front lip and side skirt diffuser extensions. 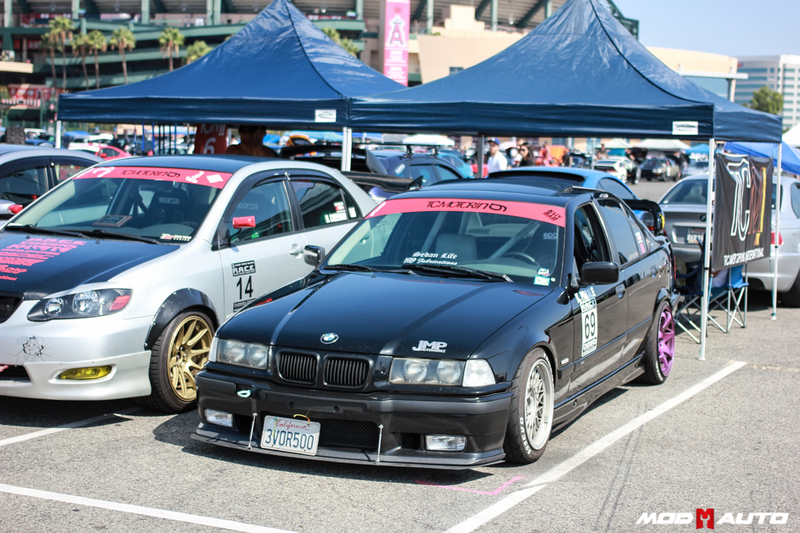 M Fest Crew reppin the doublekidneys hard. 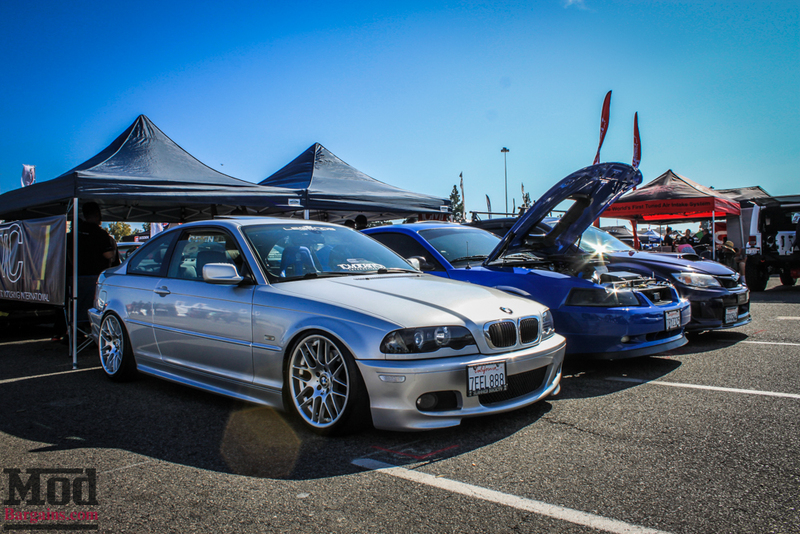 N This driftastic BMW E46 wearing a set of white F14 Forgestar Wheels was a really unique sight to see. 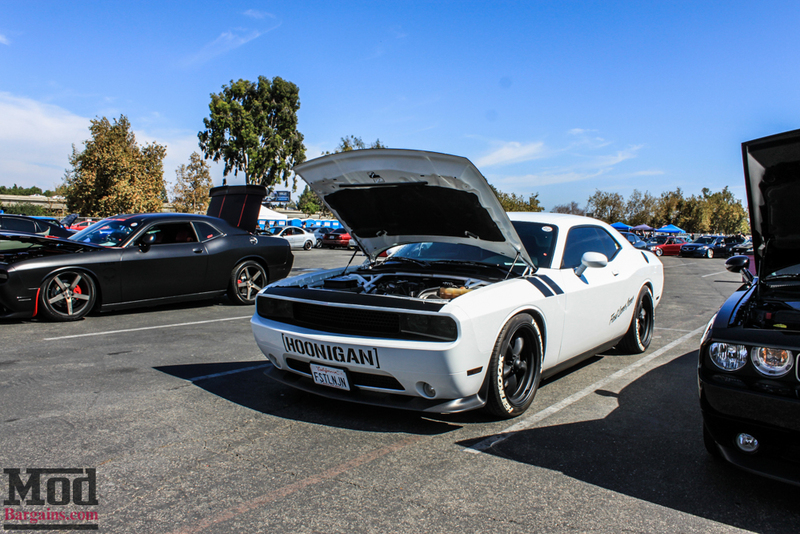 Look at that pissed-off whipplecharger bursting through the hood. 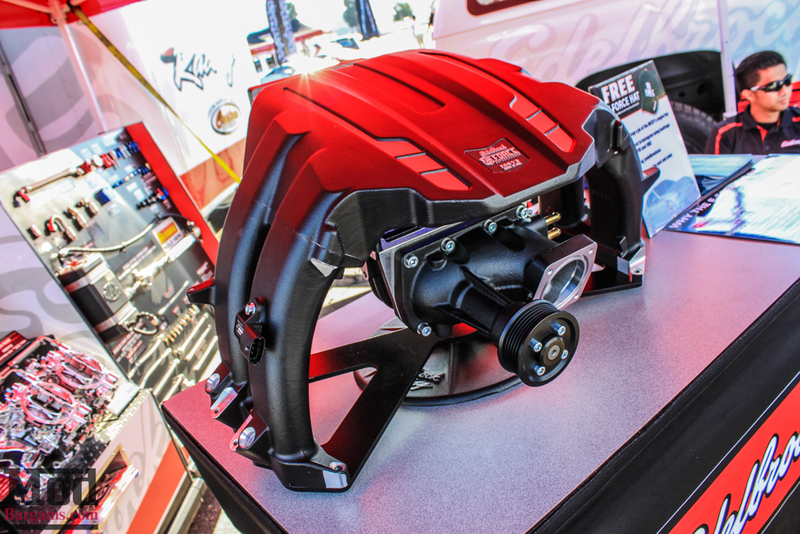 While some people may swear by centrifugals, there’s nothing like a roots positive displacement supercharger. 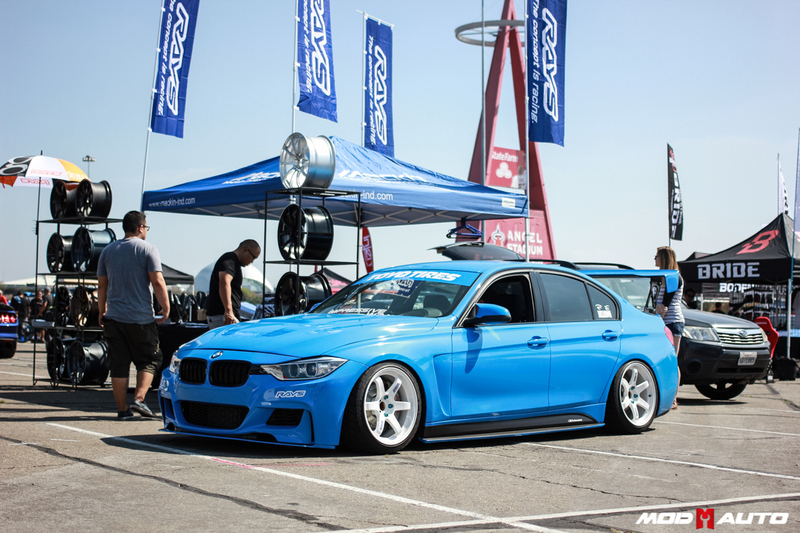 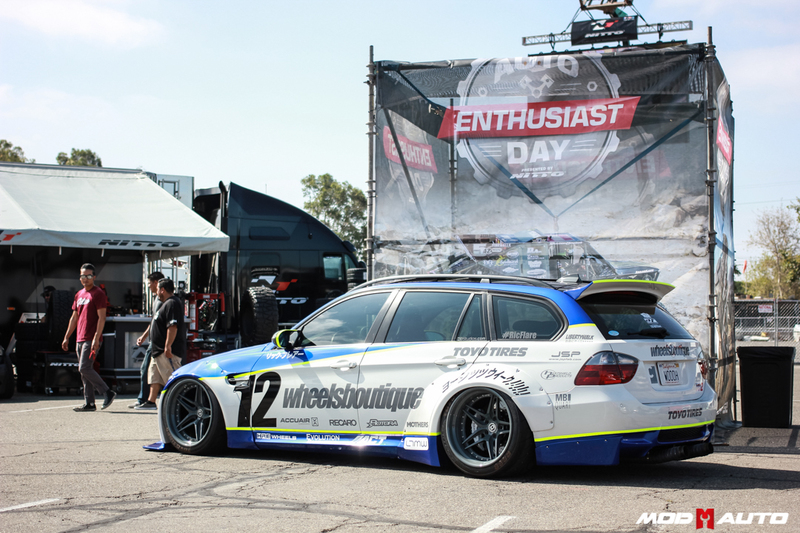 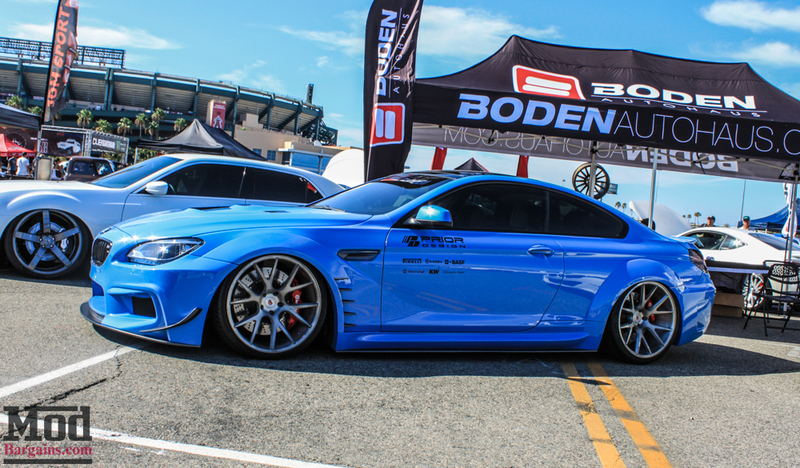 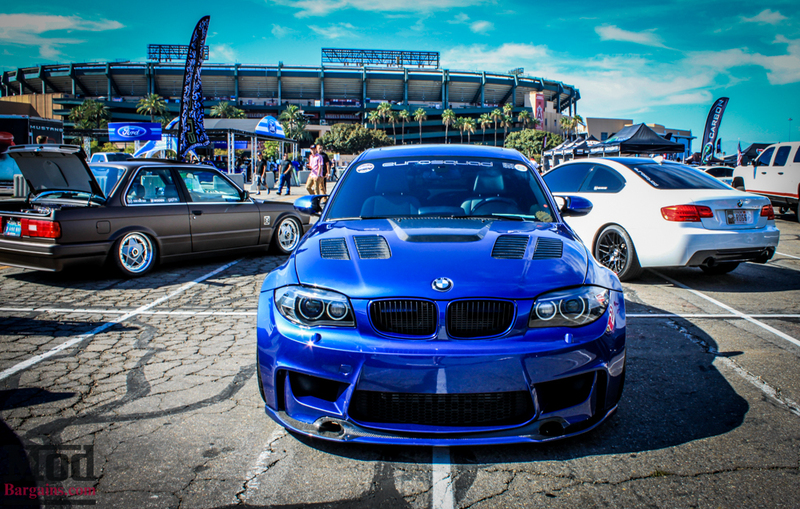 Our friend the widebody BMW E91 has gotten a new look and we rather like the new look. 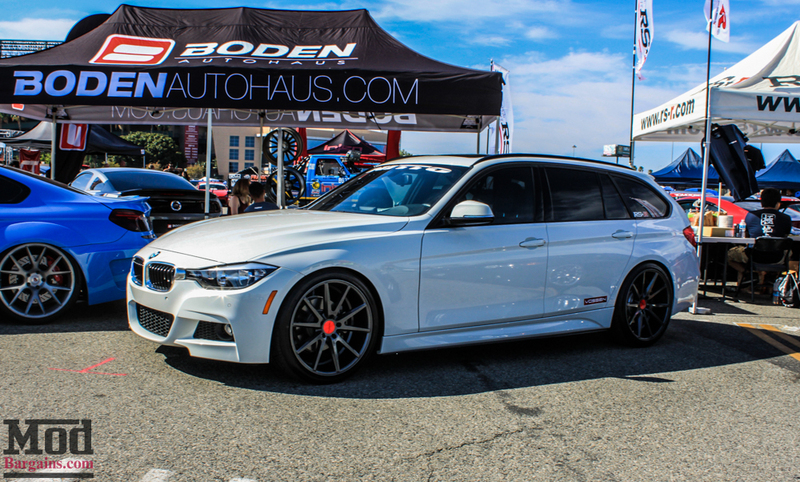 1013mm’s BMW 328i looks great as ever and hasn’t aged at all. 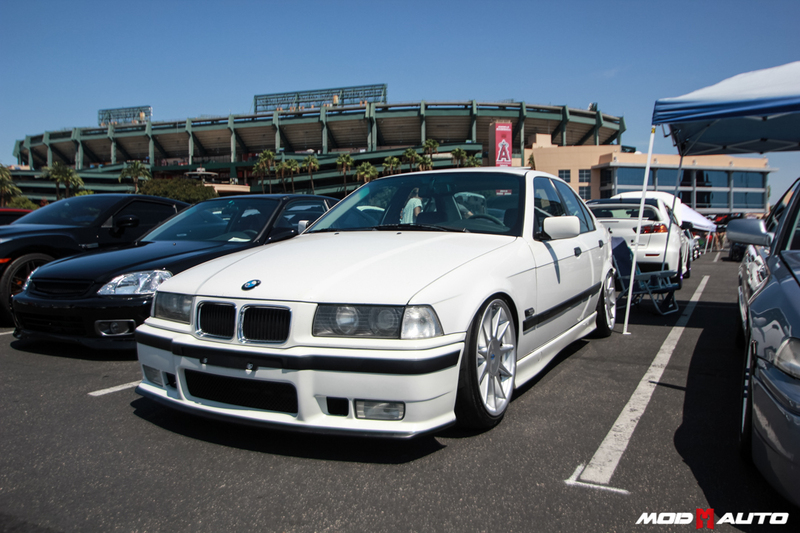 This E36 Sedan was incredibly clean. 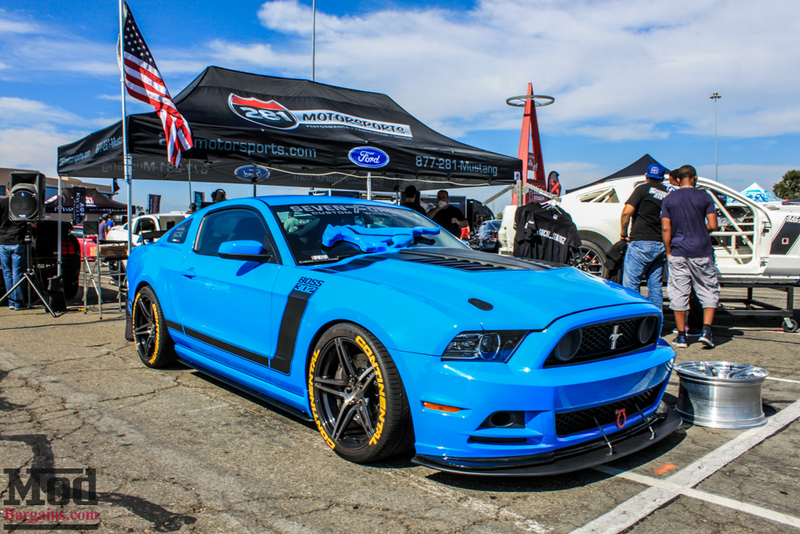 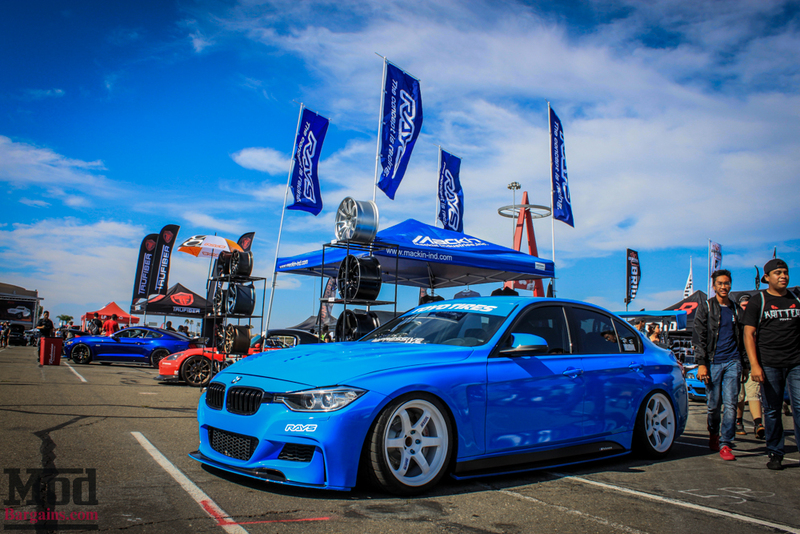 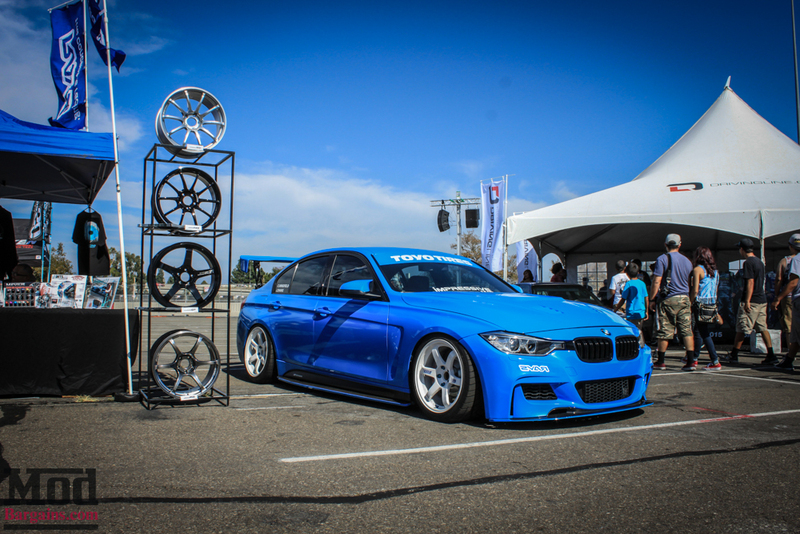 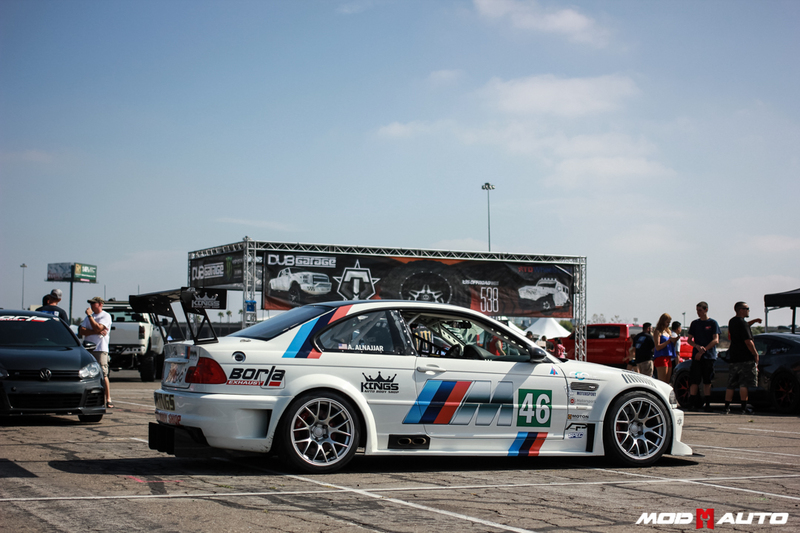 Laguna Seca Blue is a rare color, yet it seemed to be incredibly popular. 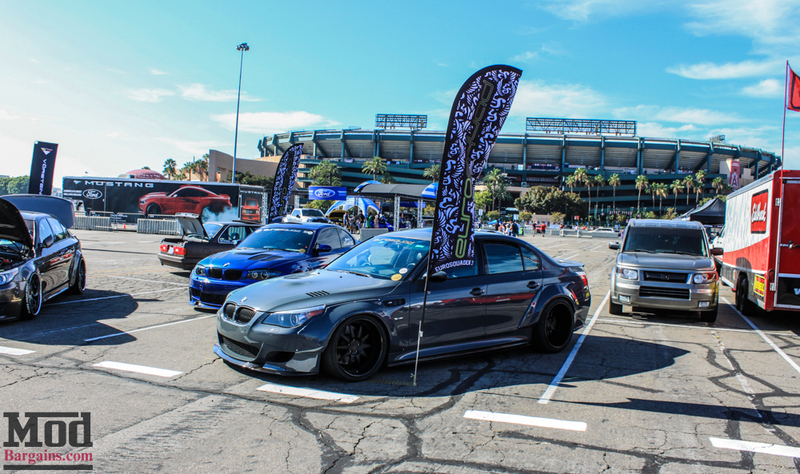 This was one of our favorite shots of the show, the giant A looks great behind this pair. 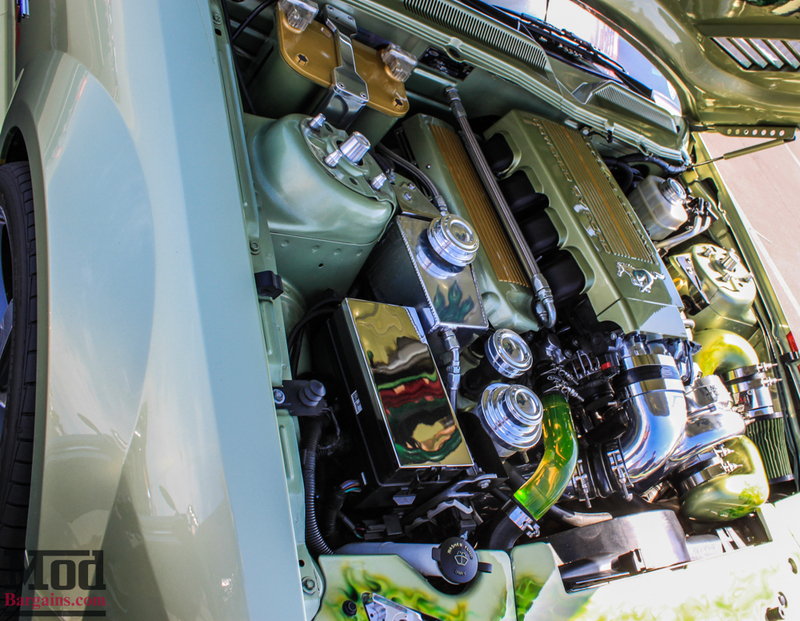 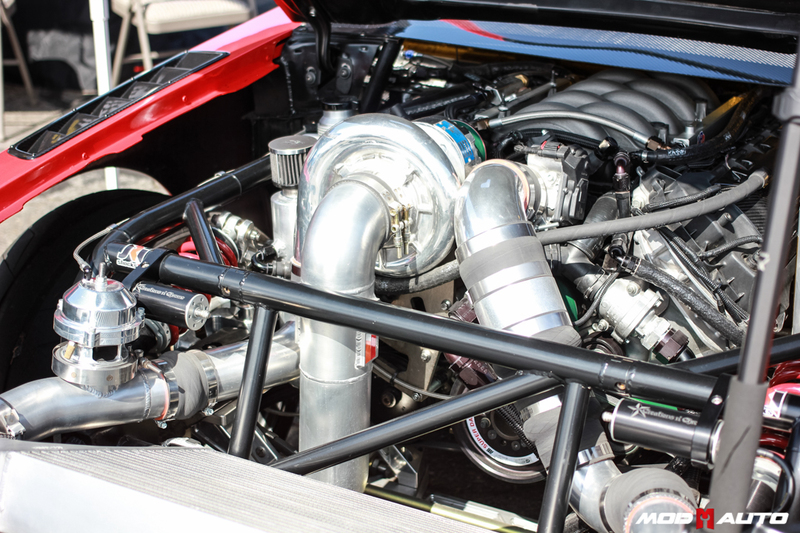 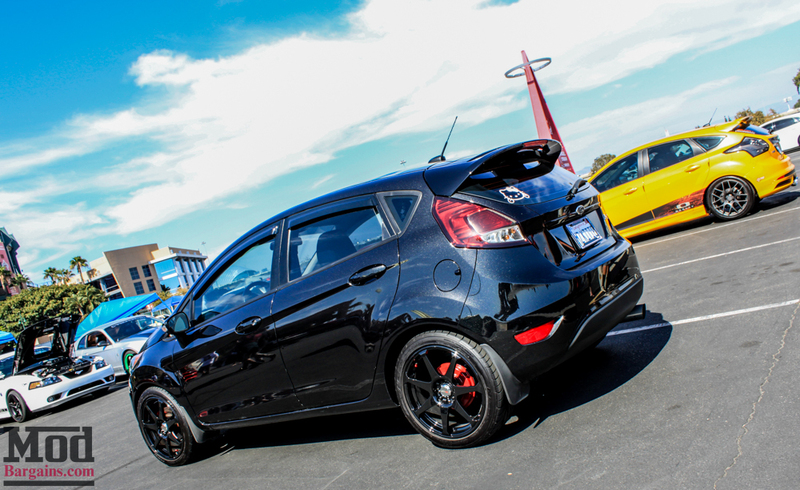 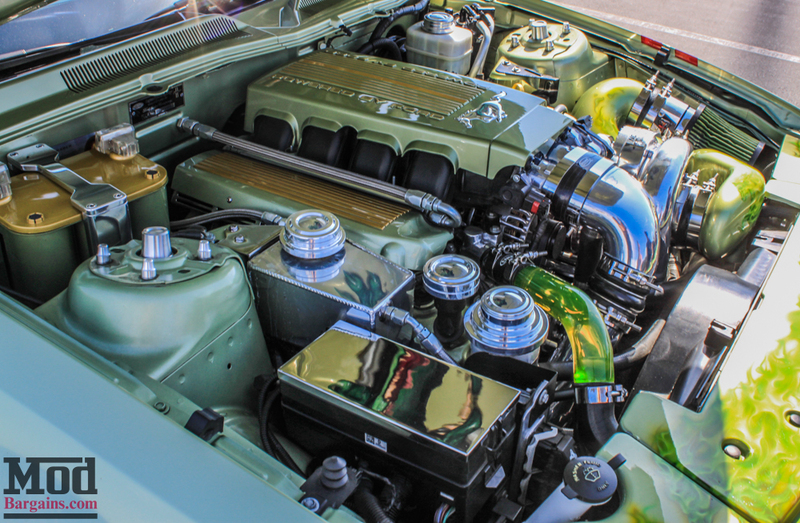 Each car sported a supercharged six underhood. 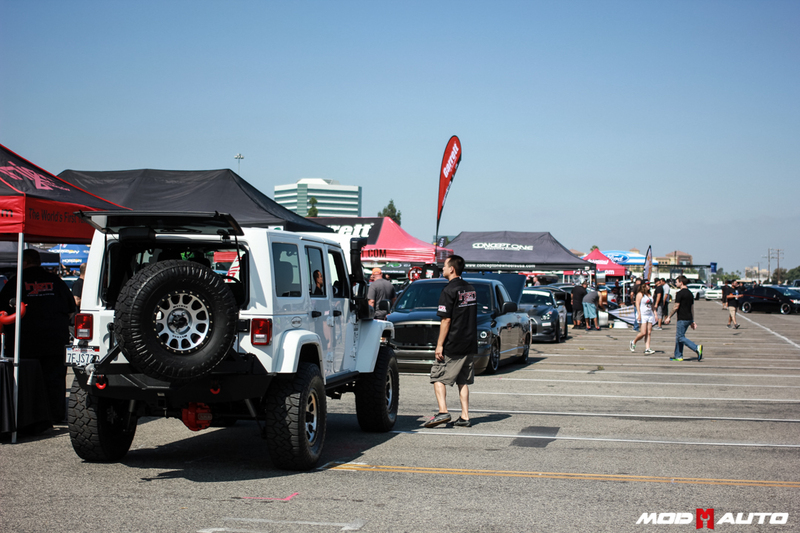 We pressed on. 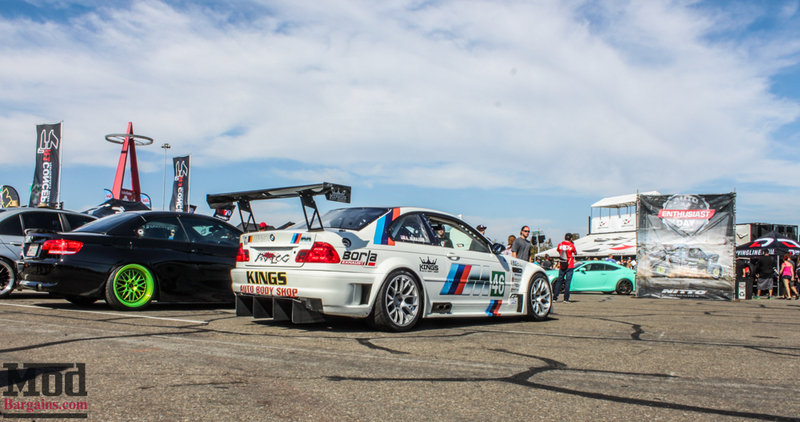 The side-exit exhaust on this BMW E46 M3 GT-R sounded incredible and shut down the show when the car fired up and belted out a few high-rev blasts from the quarter panel. 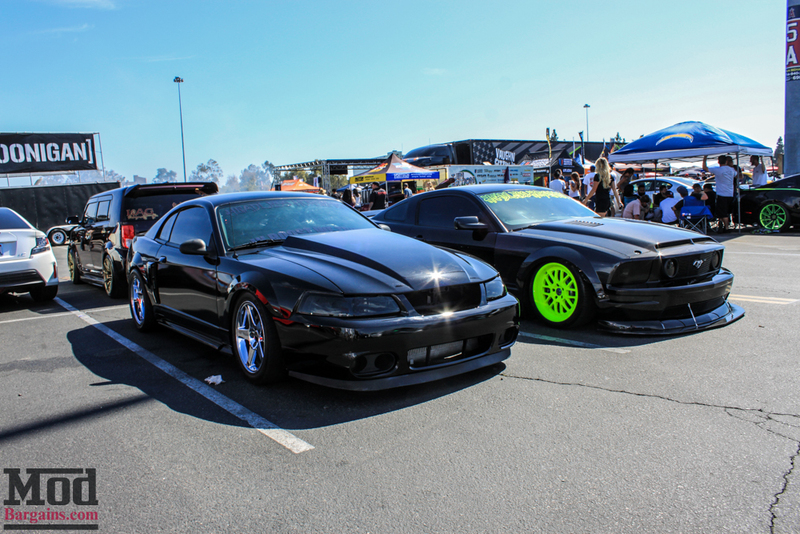 Here’s another angle of the trio. 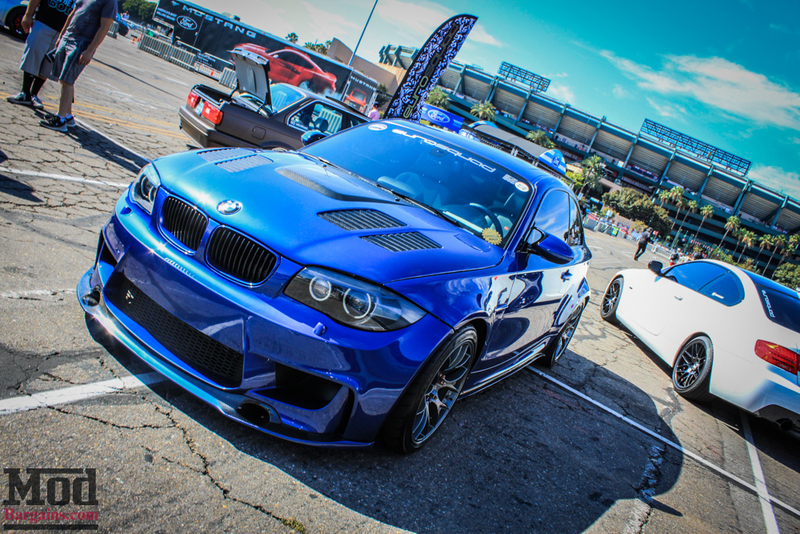 There were a few other BMWs that caught our eye, like this E92 BMW M3 rocking the V2 Front Bumper and a massive APR Performance front splitter and a set of HRE Performance Wheels FF15 Wheels in IPA Finish. 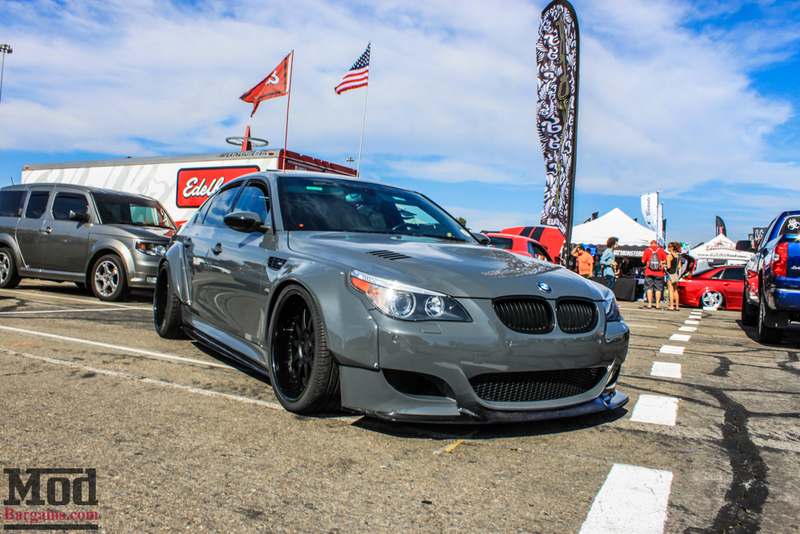 This brown BMW E60 M5 rocks the brown look like no other on a set of stunning HRE Performance Wheels. 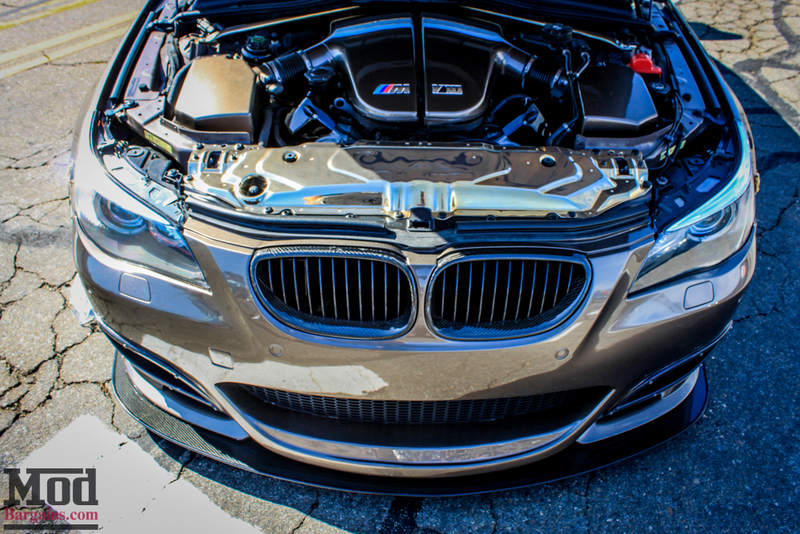 The brown keeps going even under the hood – check out the Carbon Fiber Kidney Grilles and front splitter. 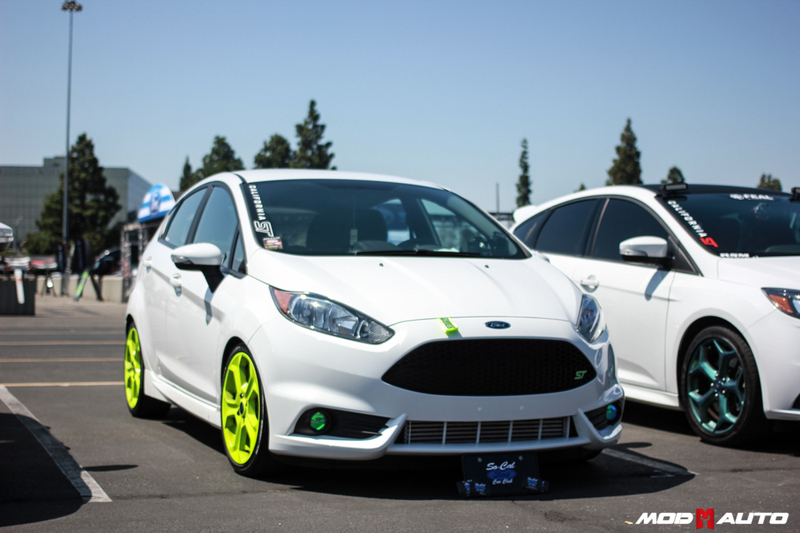 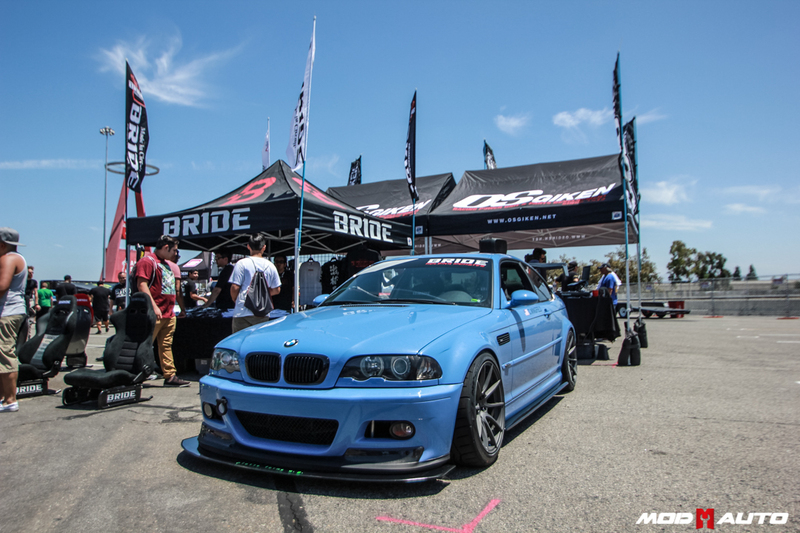 This Performance Blue 1M (we think it’s a 1/499 1M at least, because of the fenders) – with custom projector headlamps and a vented GTR-style hood, this is one E8X 1-series that’ll break necks at any show… but just like our Project Fiesta ST, we can’t figure out if it’s blue or purple. 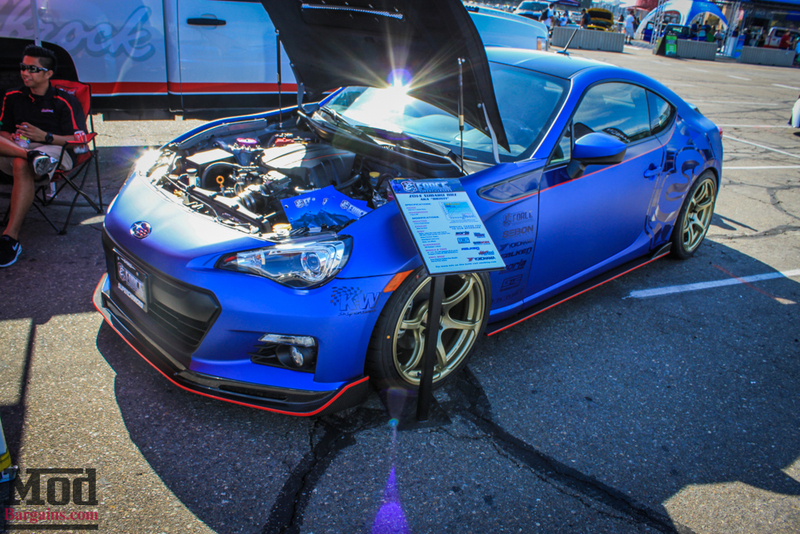 It’s blurple. 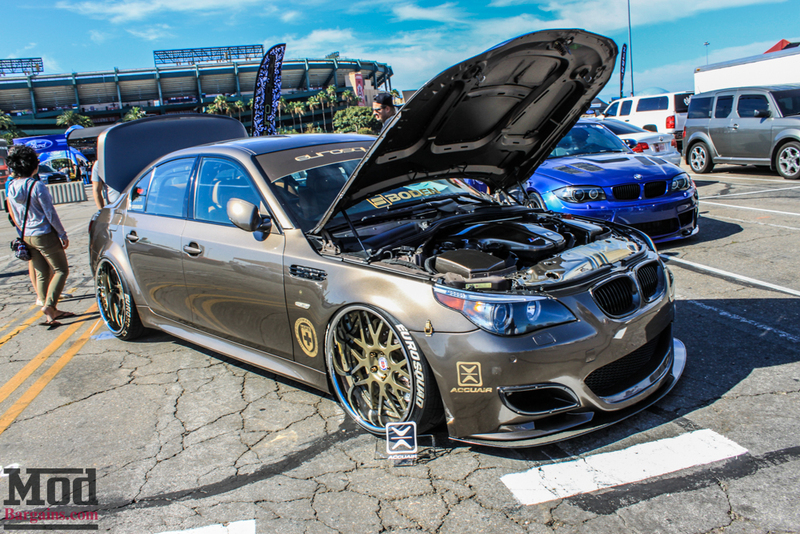 This was a whole different take on the E60 BMW M5, with a Liberty-Walk style widebody kit bolted onto the front end, giving the car a wildly unique look. 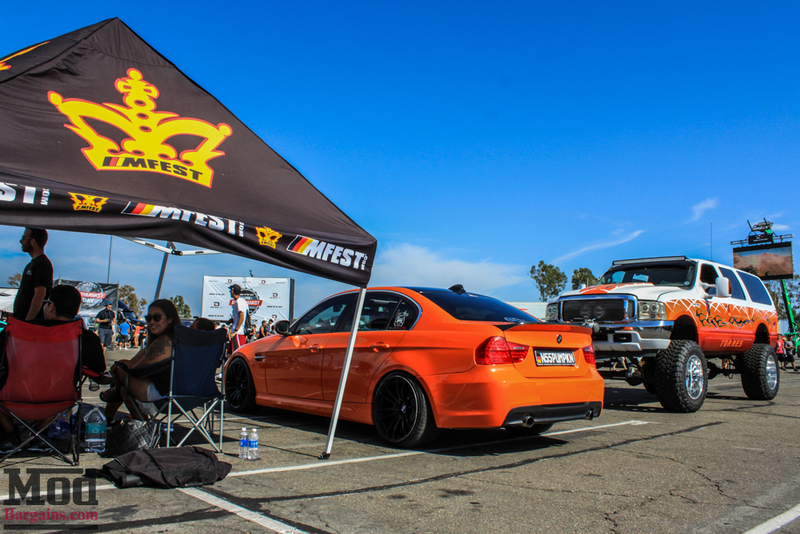 The plate on the M-Fest E90 BMW 335i with M3 fenders calls out the Competition Orange ///M as Pumpkin Orange, and we chuckled at the plate. 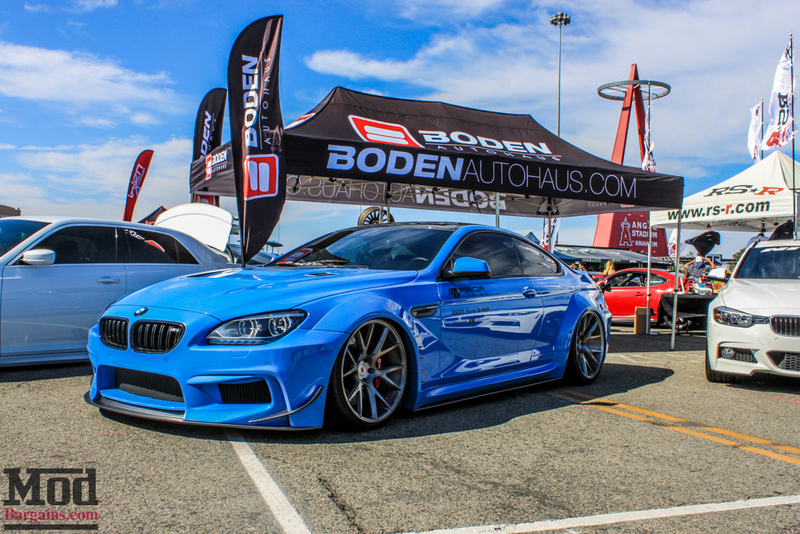 The BMW M6 over at Targa Trophy looked great too. 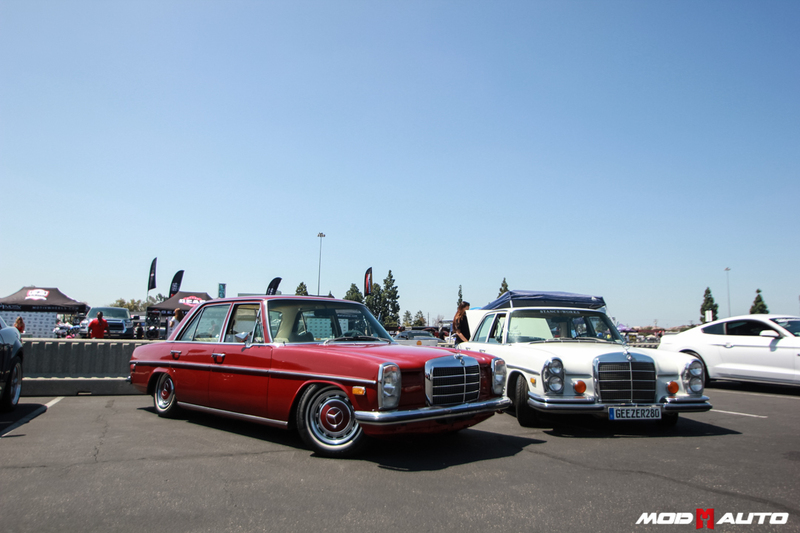 Some classic Mercedes Benzes were also out on display. 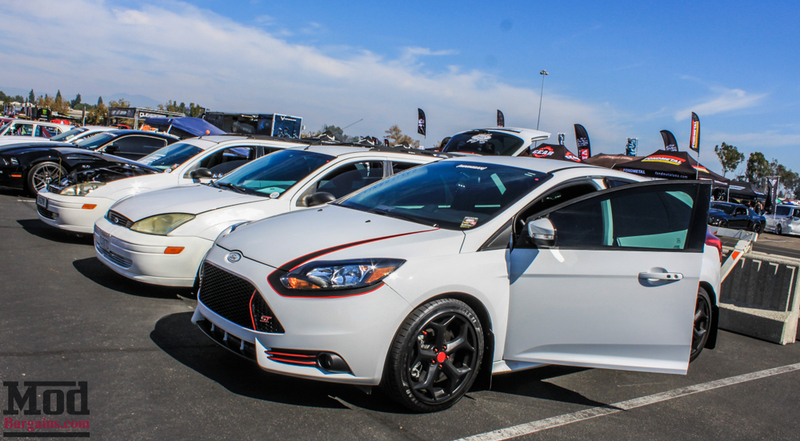 Then there were the ST’s. 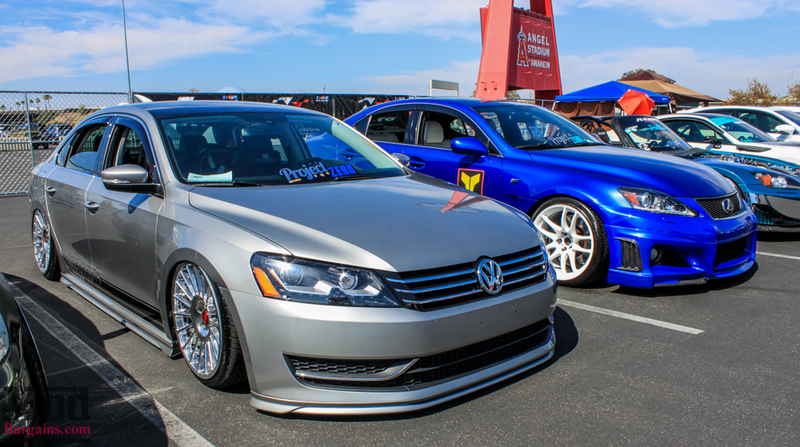 Not to be outdone by the Ford guys, the VW guys were out in number as well. 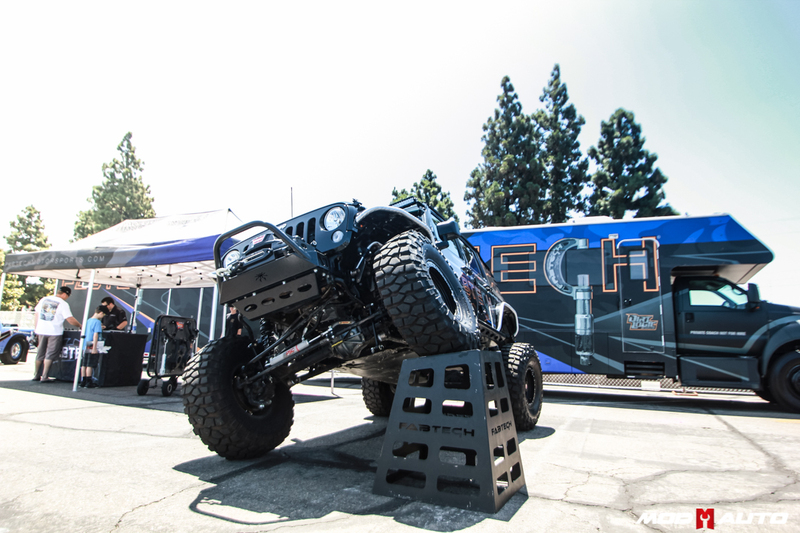 This is one of our favorite shots of the show. 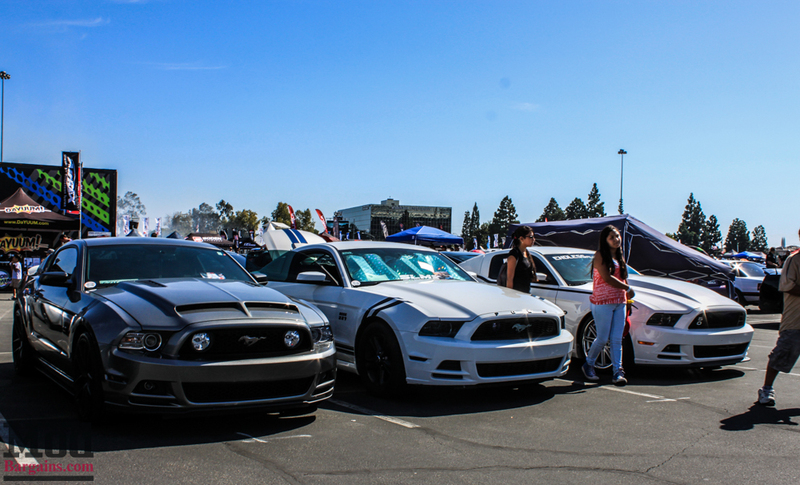 The real stars of the show however, were the Mustangs. 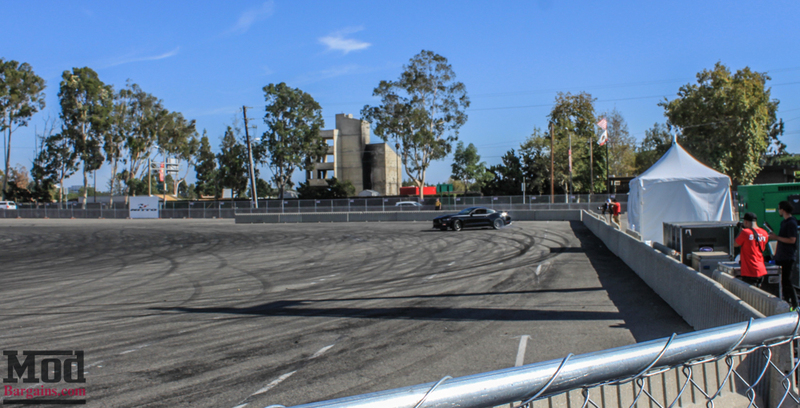 Professional Drifter Vaughn Gittin kept the afternoon entertaining, providing ridealongs and drift demonstrations throughout the afternoon. 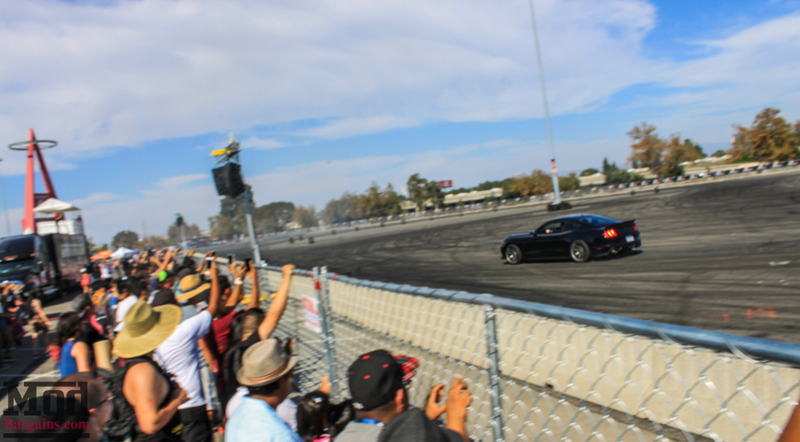 The crowd loved Gittin’s performance. 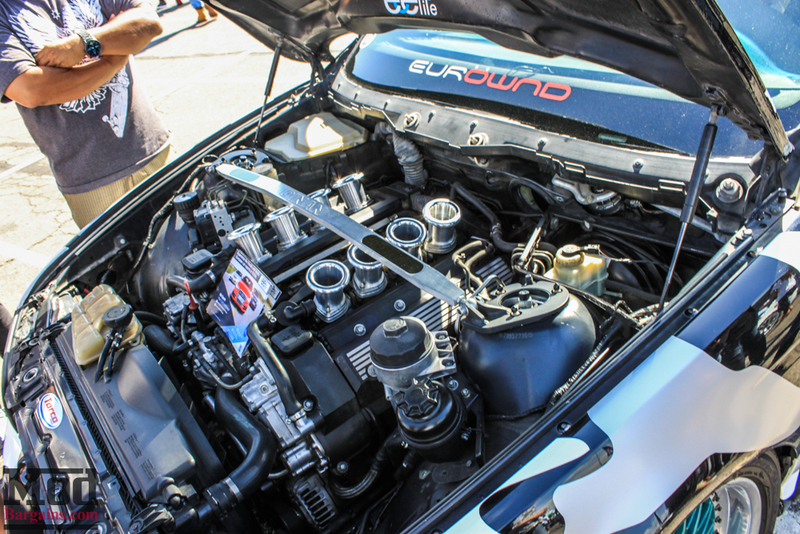 We even managed to get a few rare photos of famously camera-shy Jurrian as he talked to people about his build and showed off the latest work done to the pony. 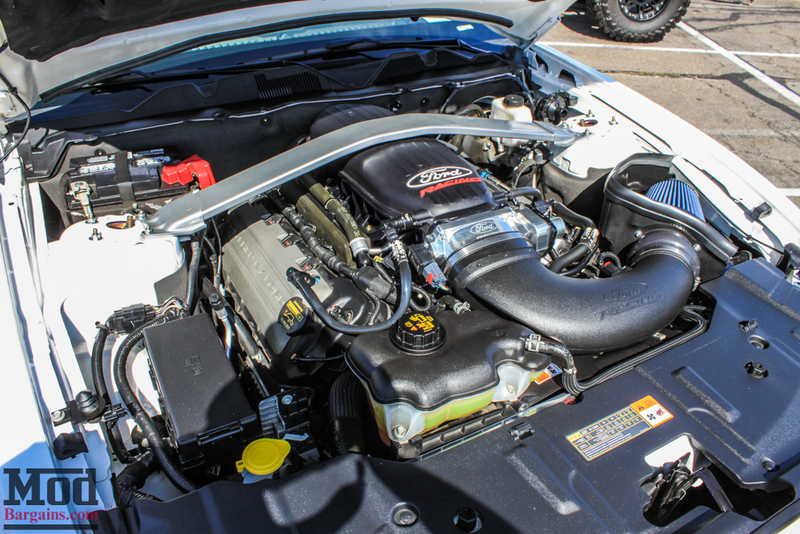 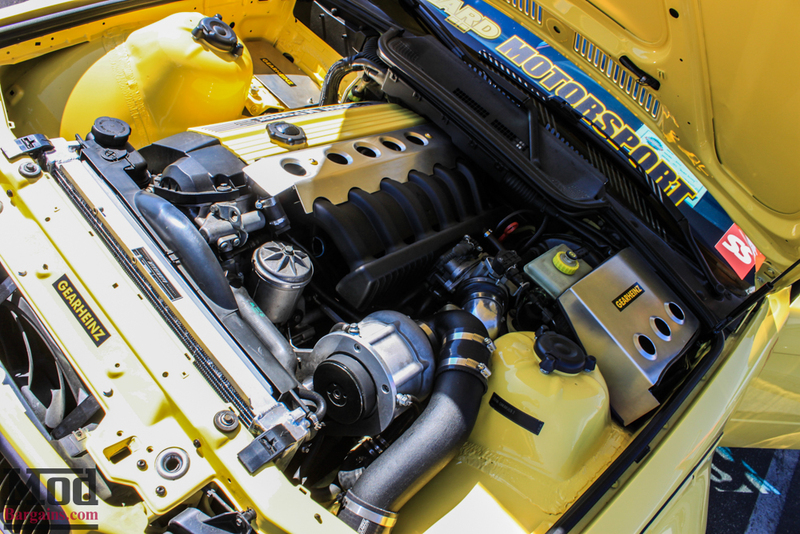 Under the hood lives a Vortech Supercharged V8 good for around 600whp, not too shabby for a street driven car. 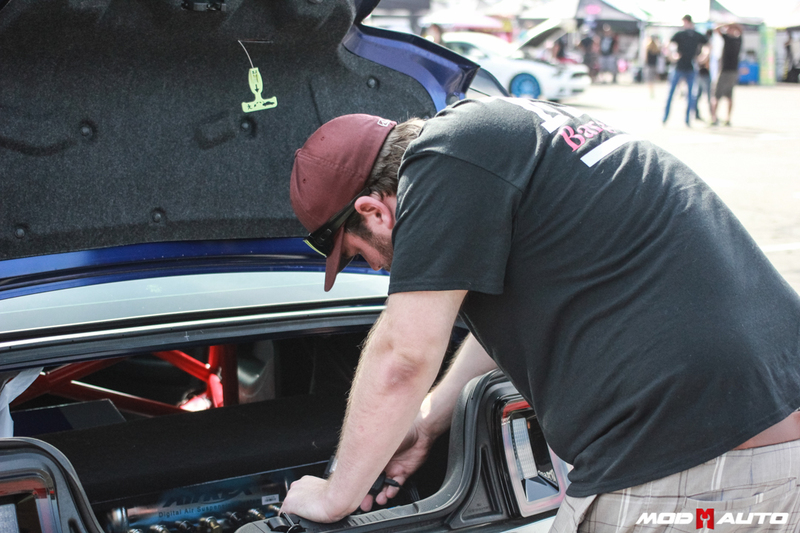 As Jurrian adjusts the Airrex Air Ride system, you can just barely glimpse the brand-new bright red roll cage on the other side of the trunk. 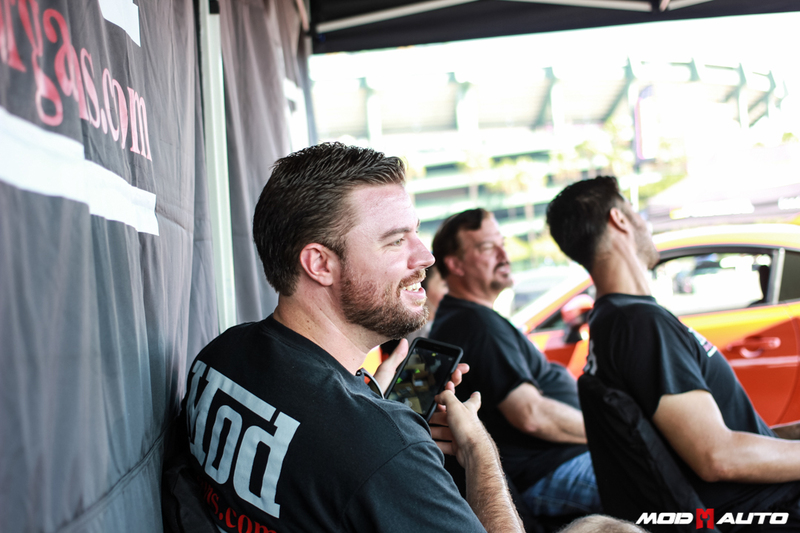 Co-founder Mike was busy SnapChatting, Instagramming and facebooking the show as we walked the floor. 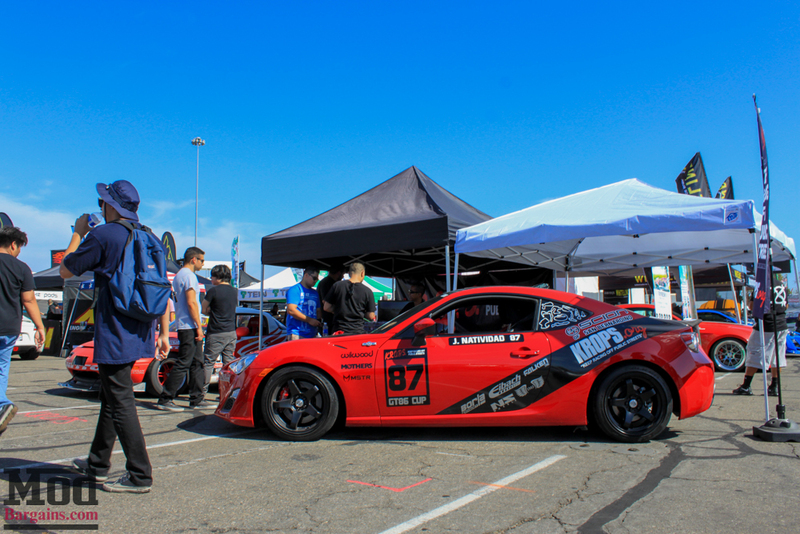 It was nice to let someone else be the “guy with the phone in his hand” for once! 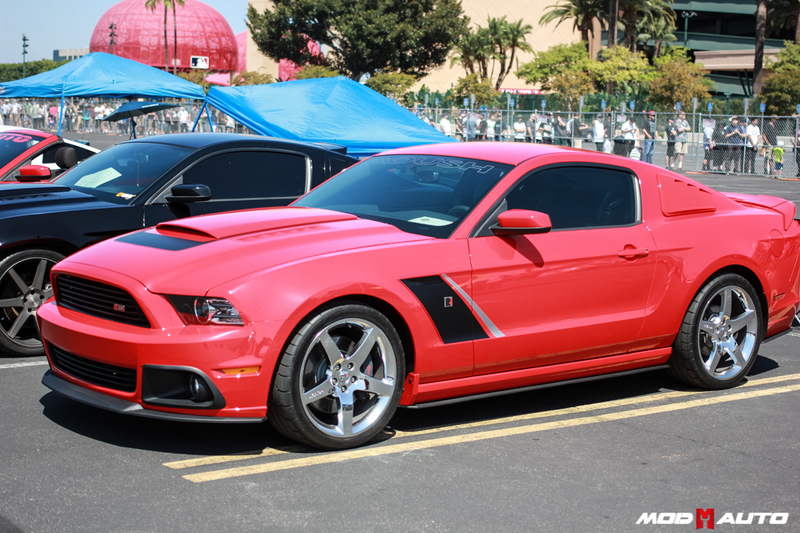 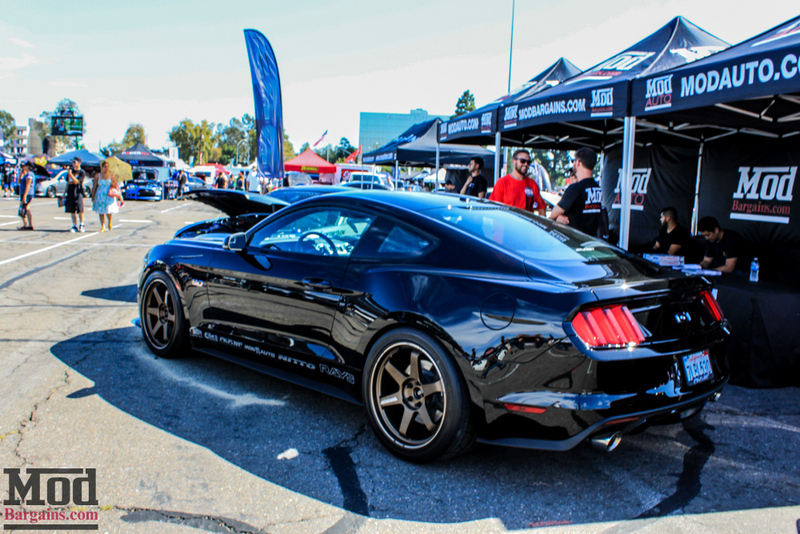 We also had this lovely 2015 Mustang GT in our booth rolling on Eibach Springs with Genuine RAYS Engineering TE-37s wrapped in sticky Nitto tires. 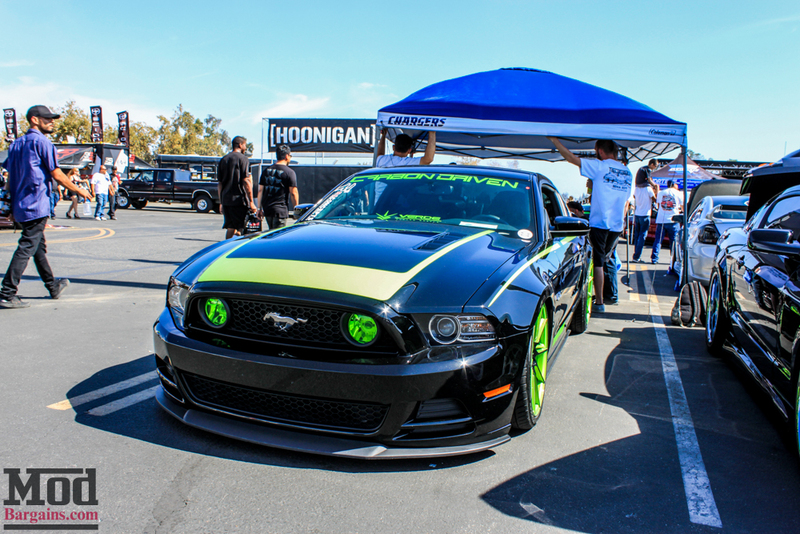 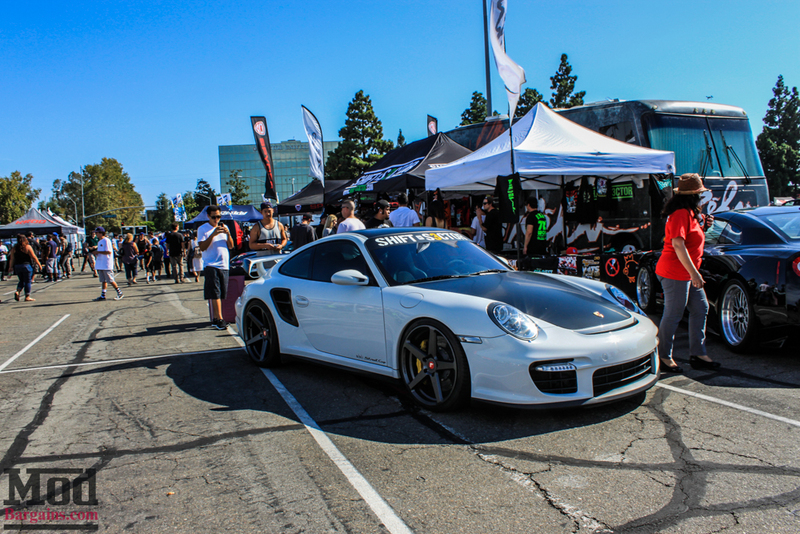 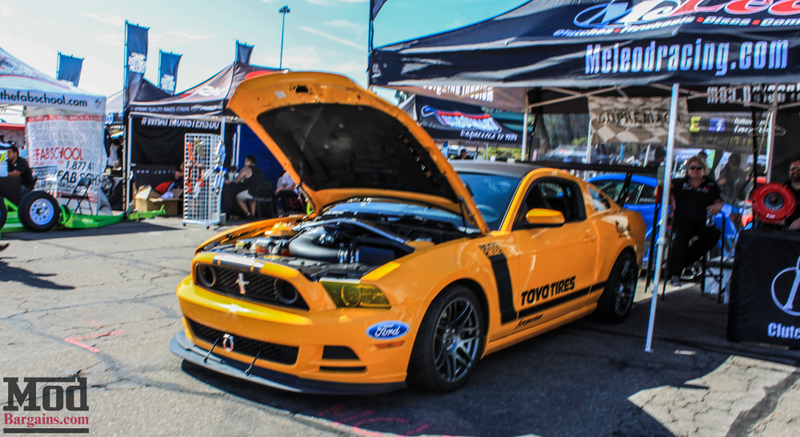 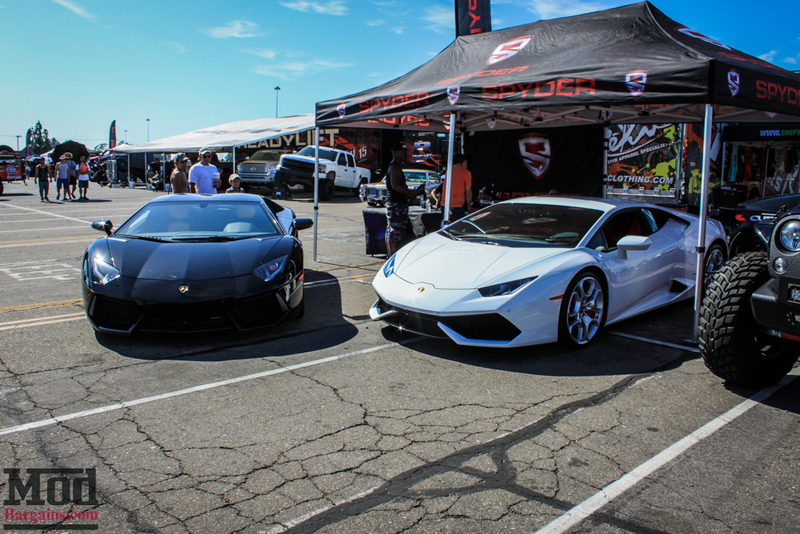 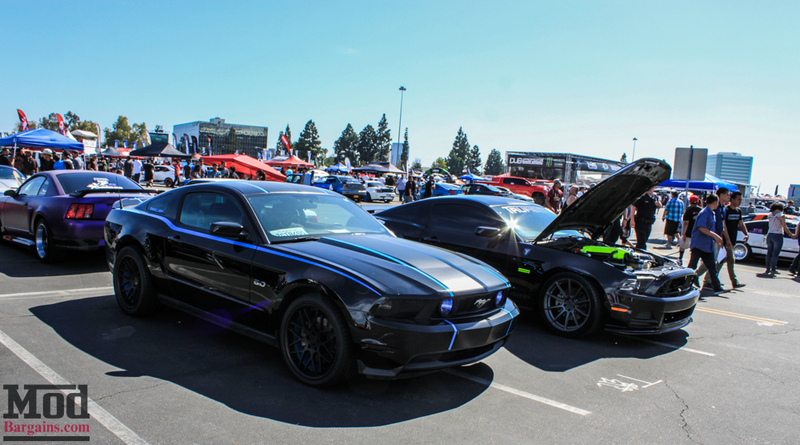 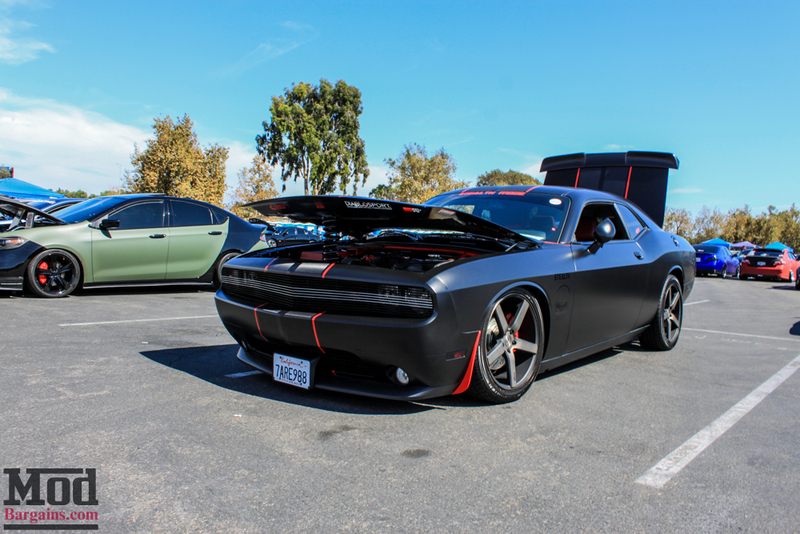 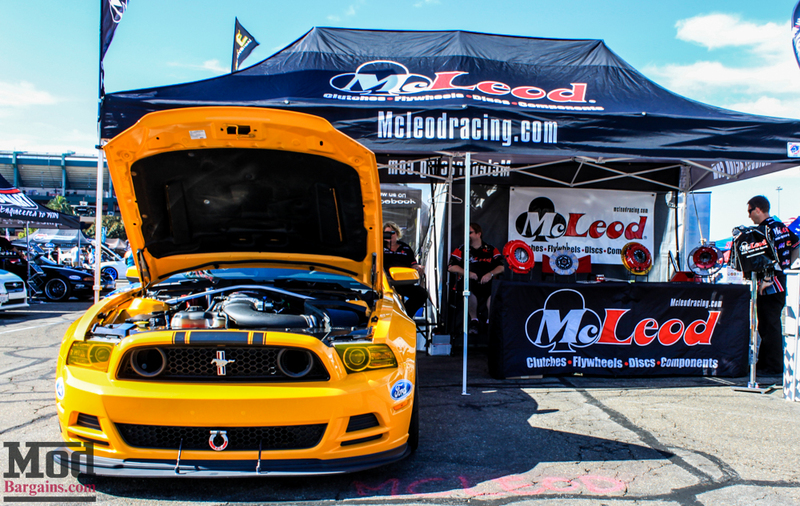 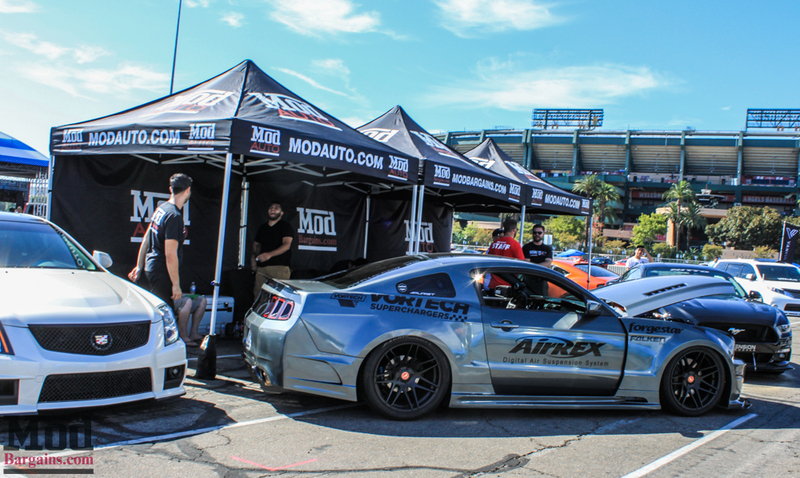 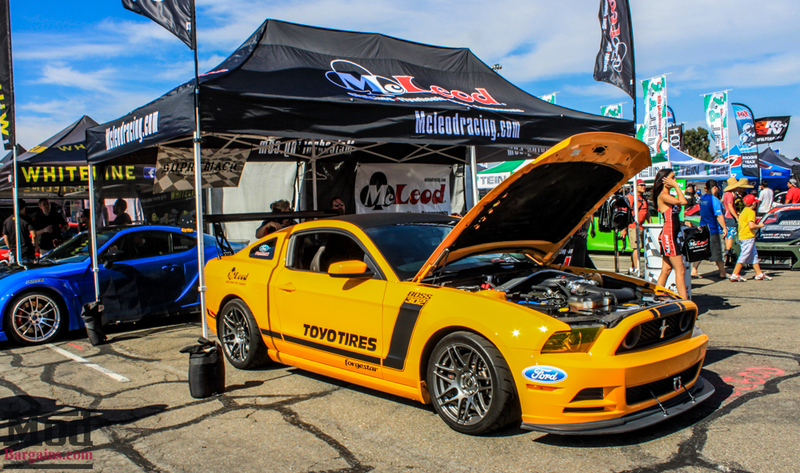 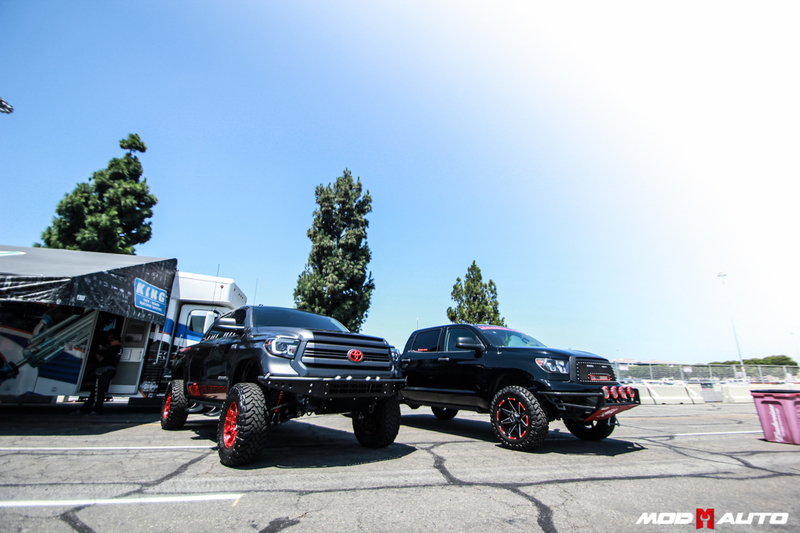 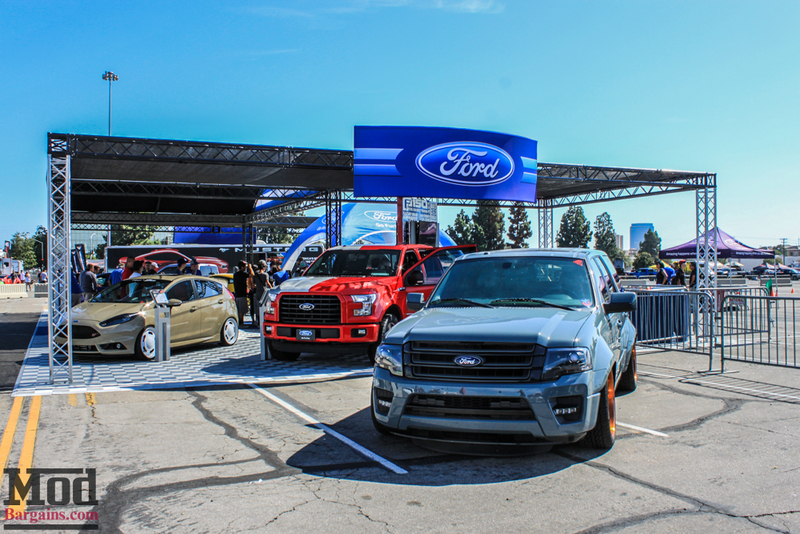 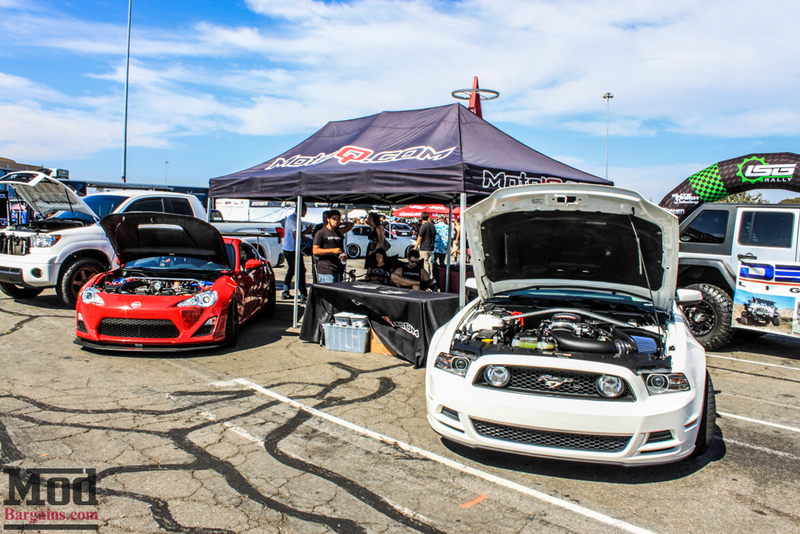 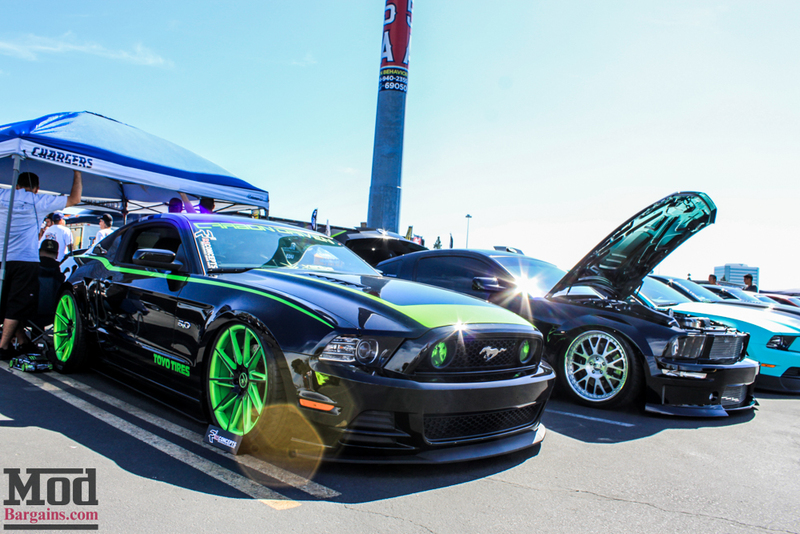 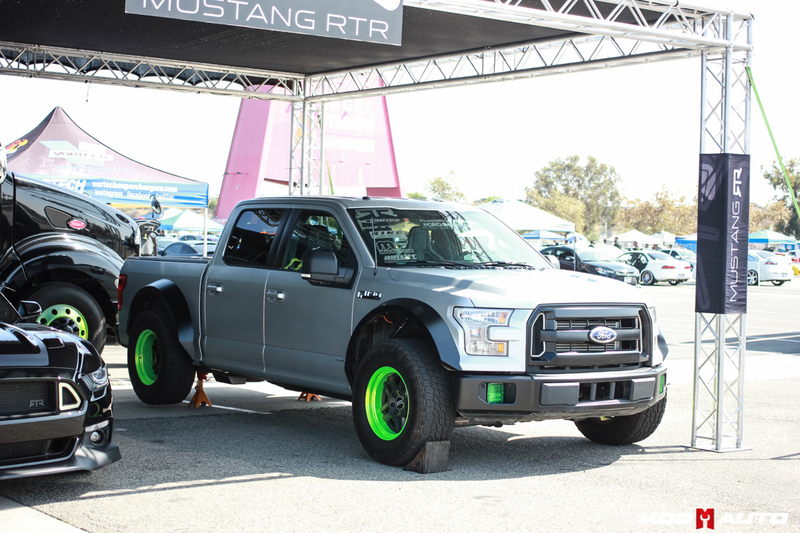 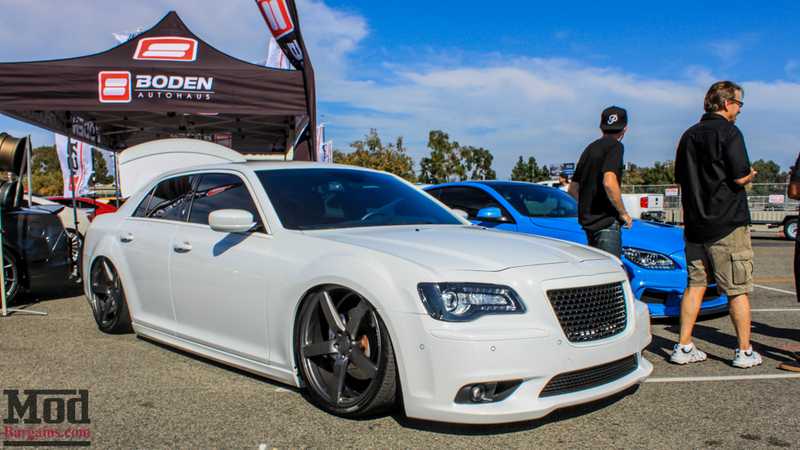 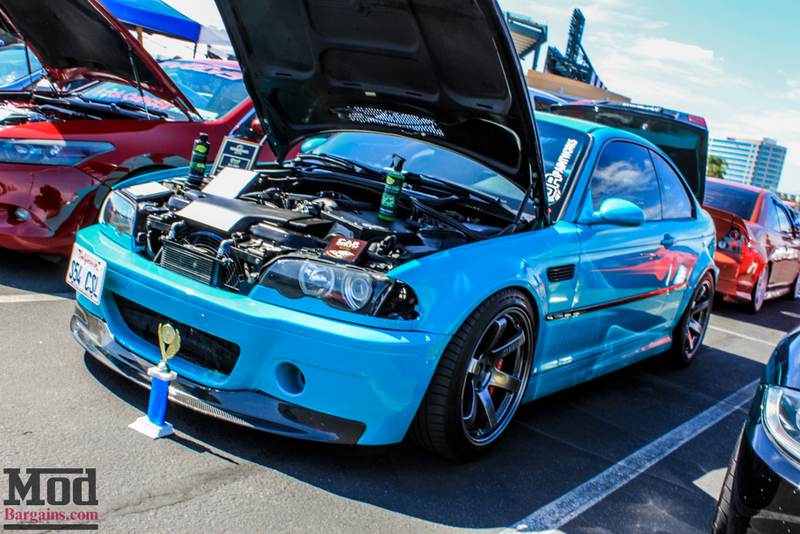 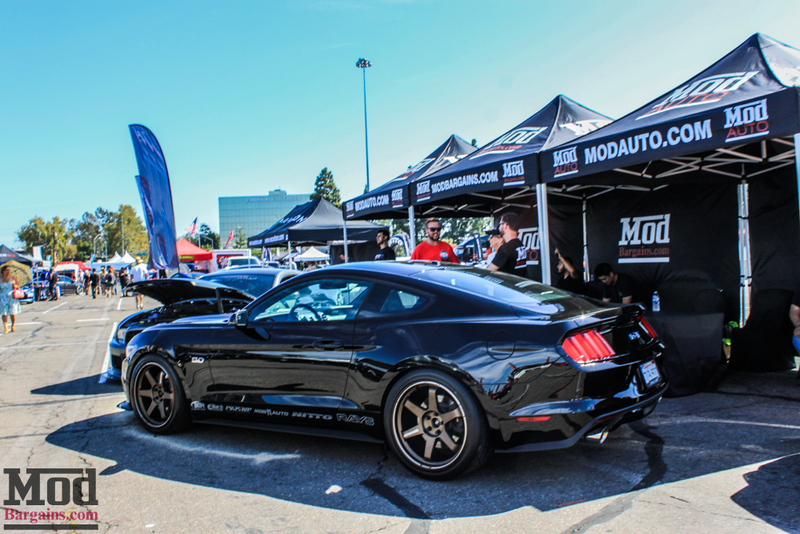 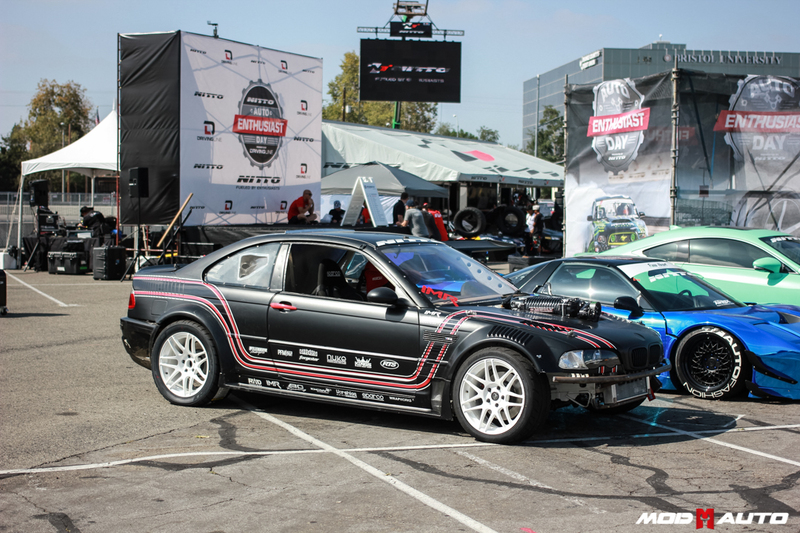 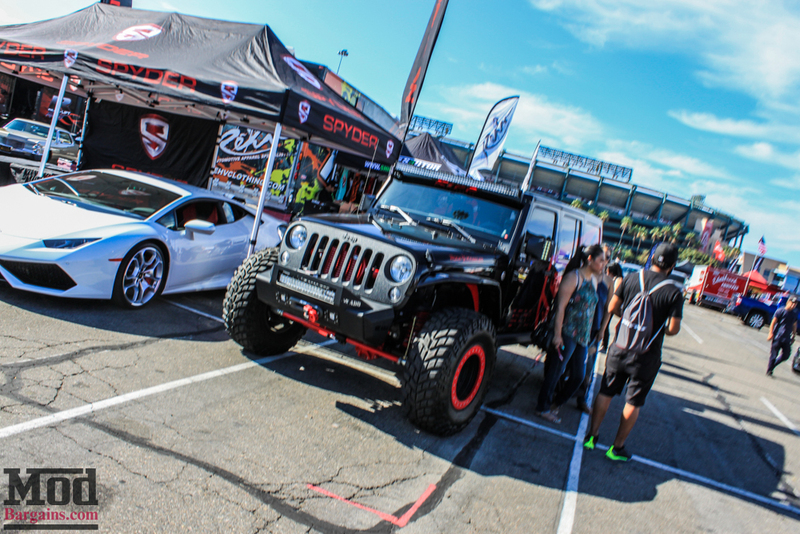 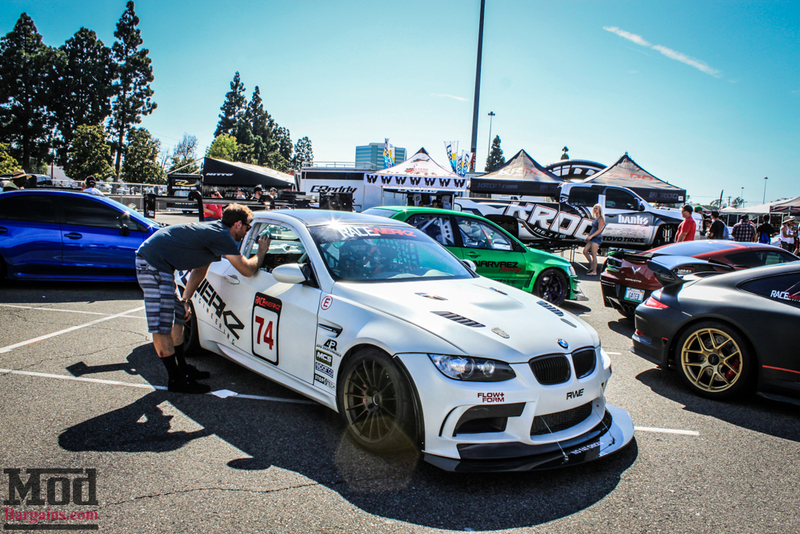 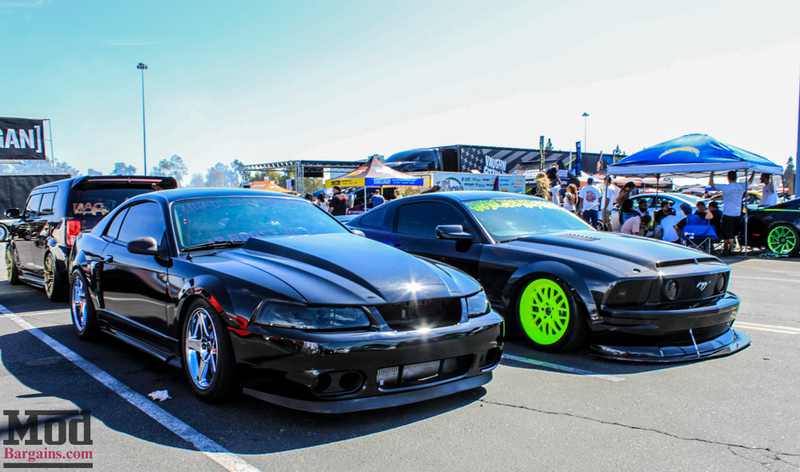 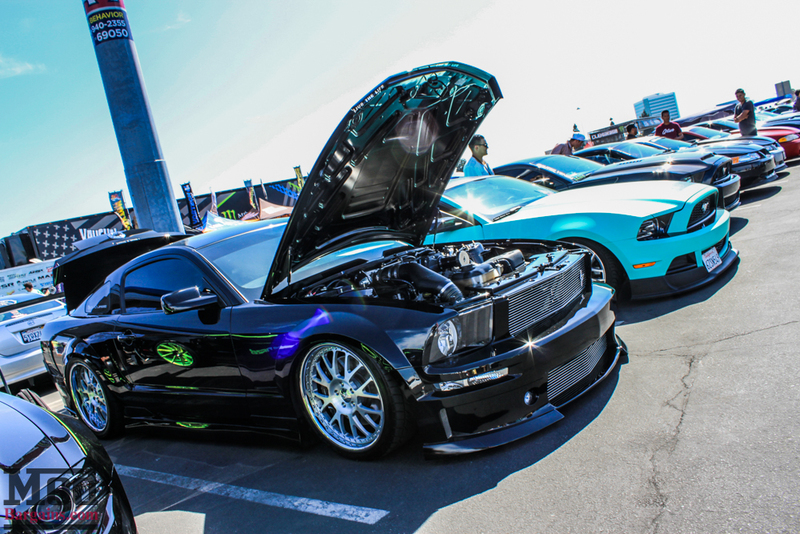 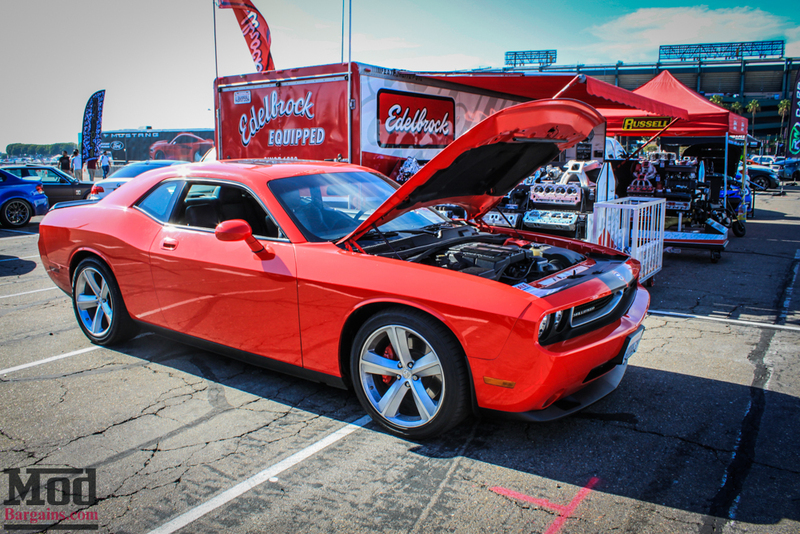 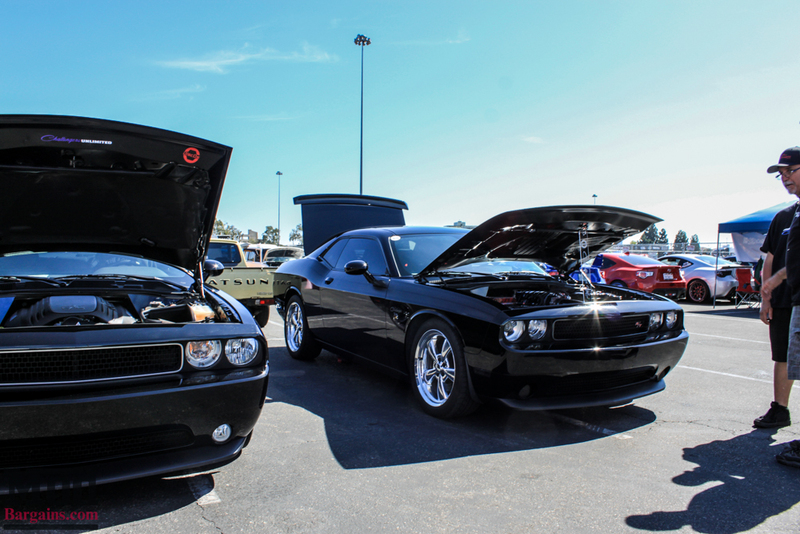 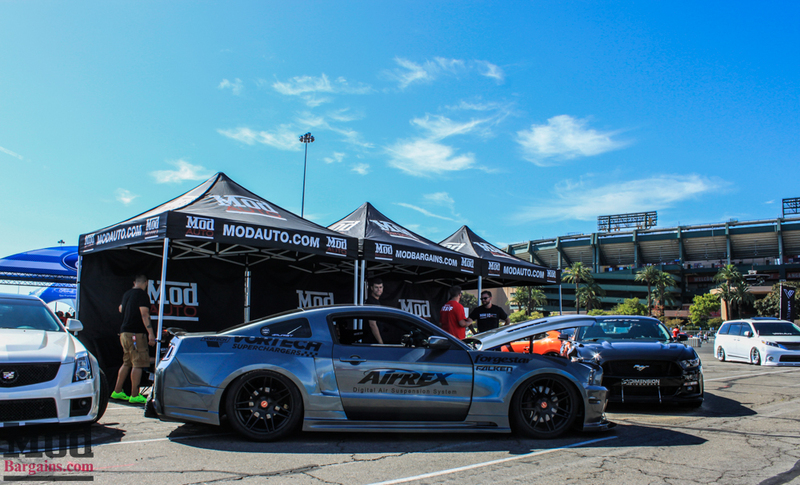 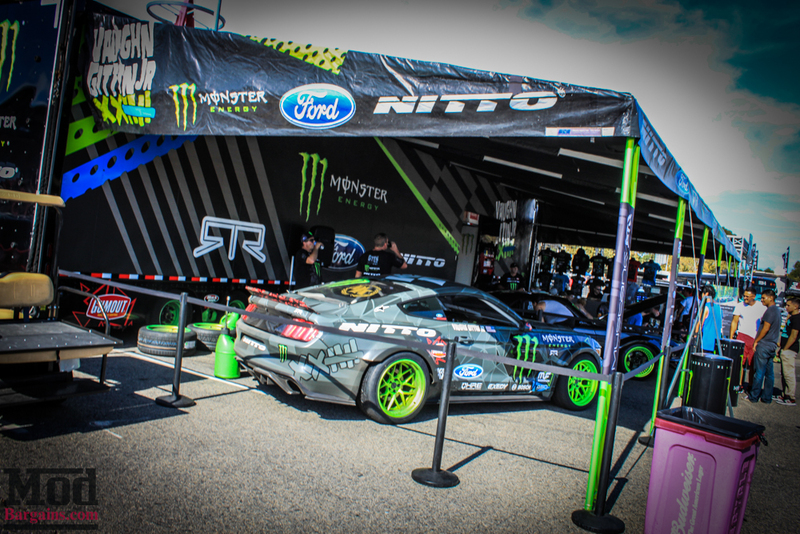 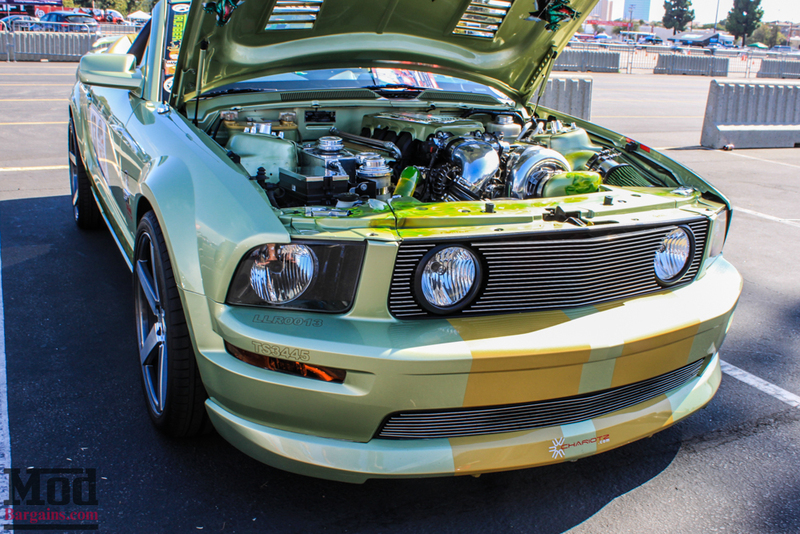 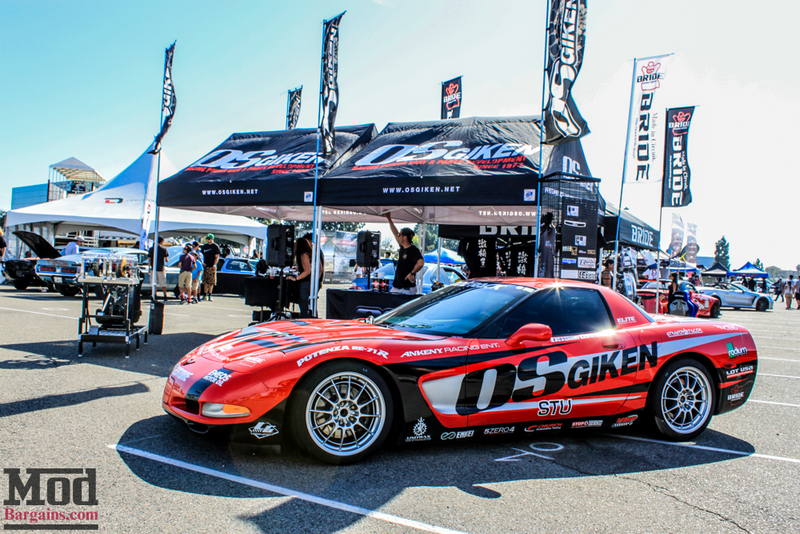 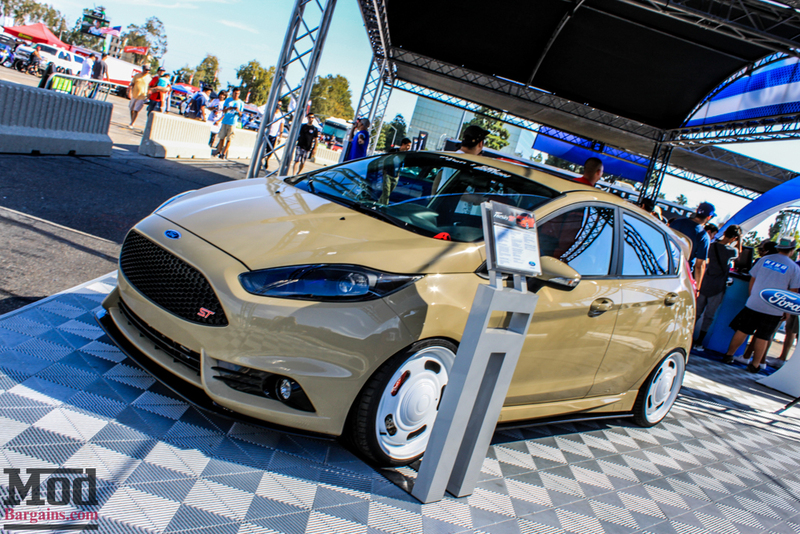 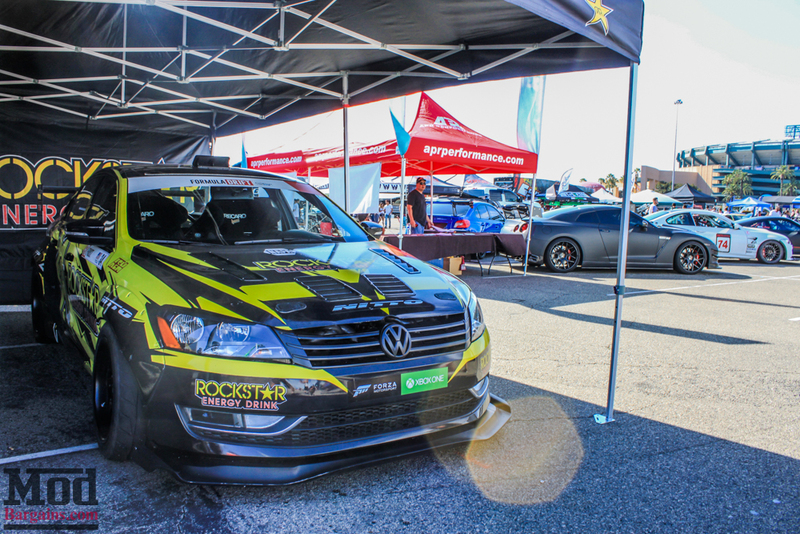 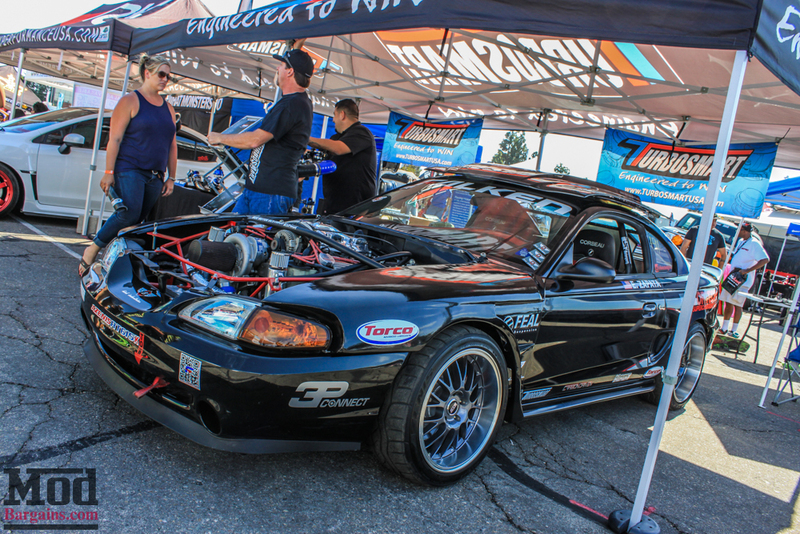 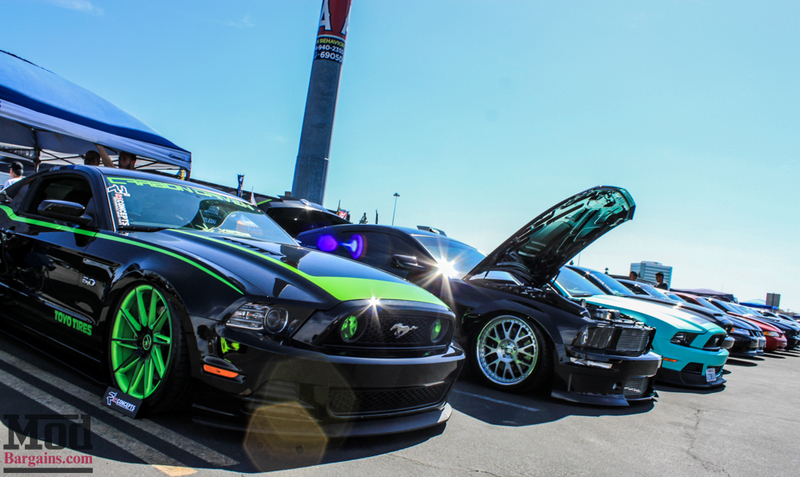 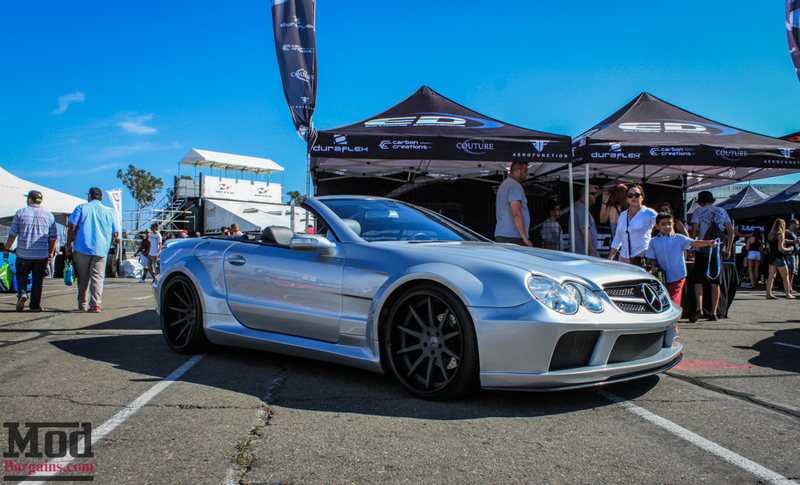 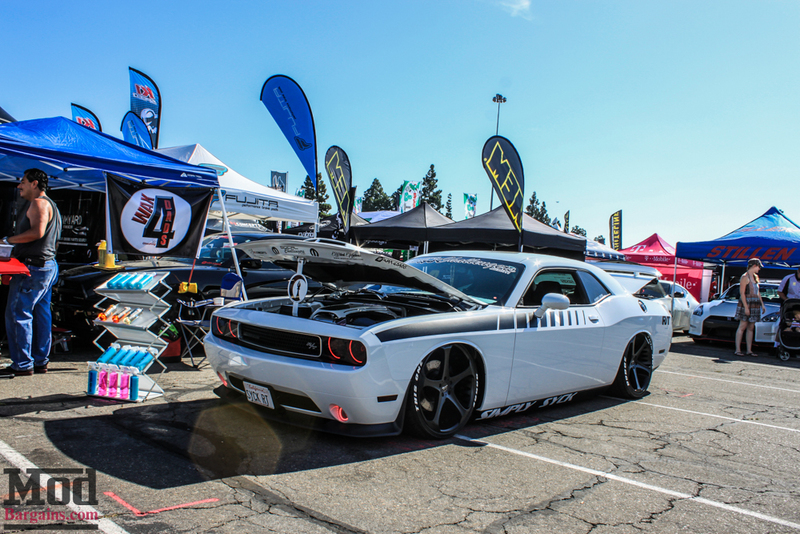 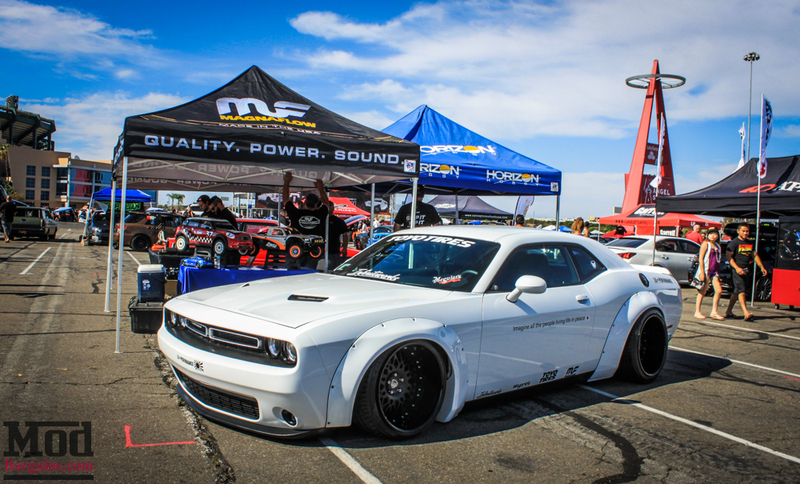 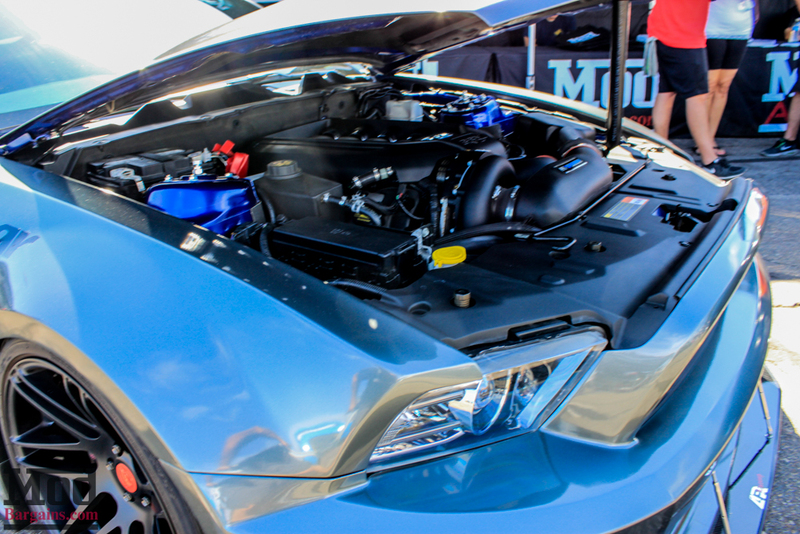 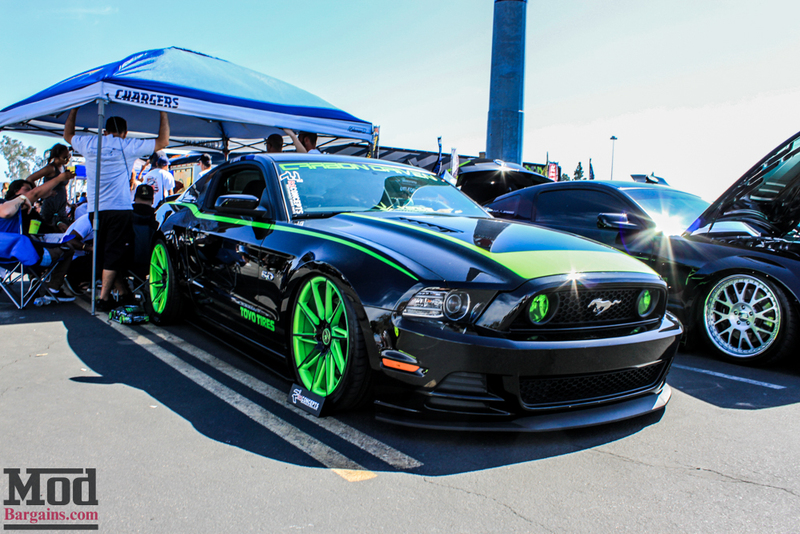 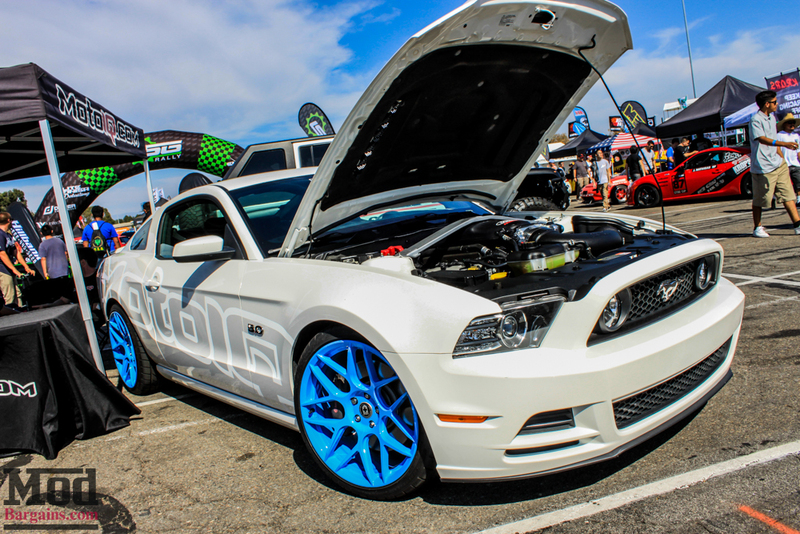 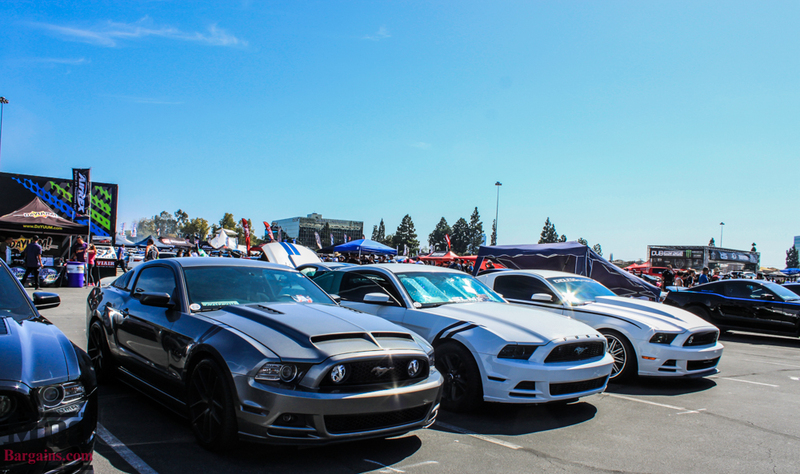 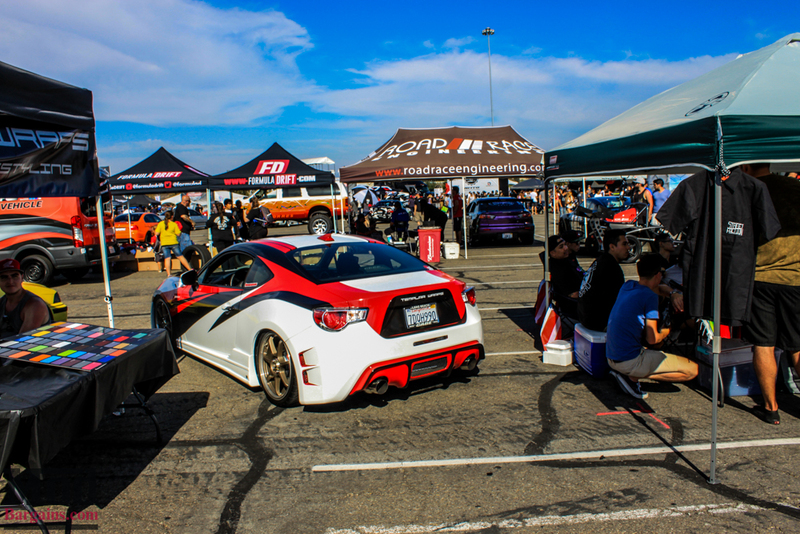 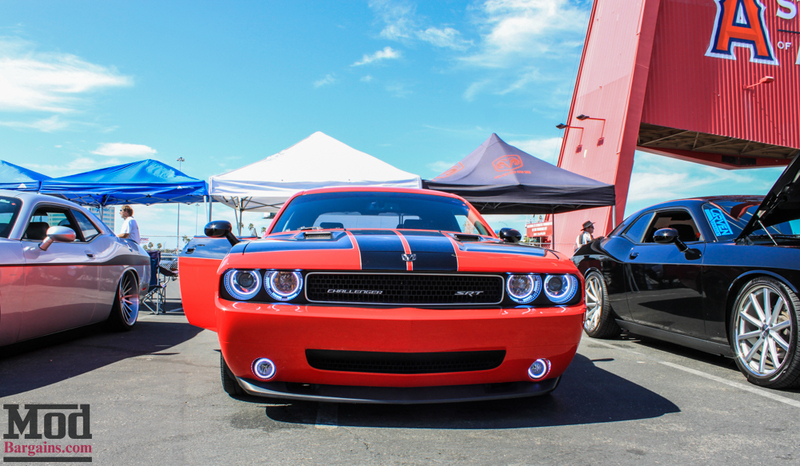 All in all we had an amazing time at Nitto Auto Enthusiast day 2015 and we had an absolute blast meeting so many fans out there, seeing all the sick builds side by side with tiresmoke and race fuel exhaust all at the same venue was really spectacular. 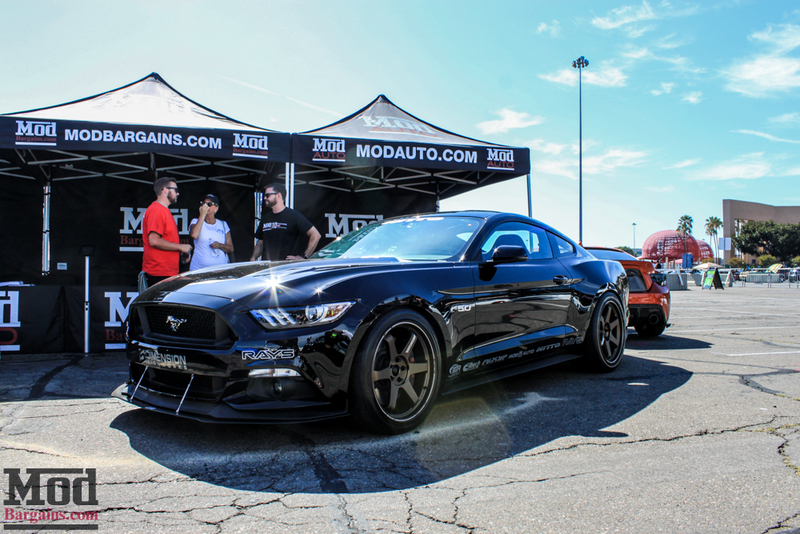 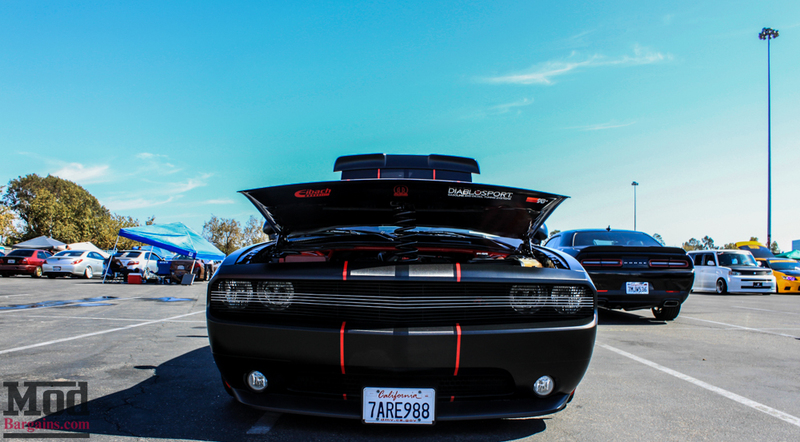 We hope you enjoyed the photos- when it’s time to Mod your own car next, give our Mod Experts a call (714) 582-3330 – most of the cars we displayed this time were our own builds done by our own employees – because here, modding cars isn’t just something we do for customers. 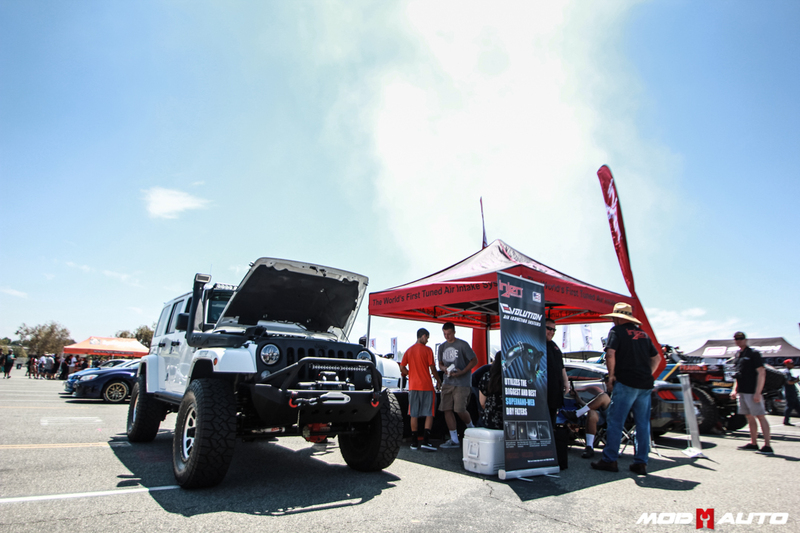 It’s our hobby and our passion, and we really enjoyed getting a chance to get out there and celebrate that. 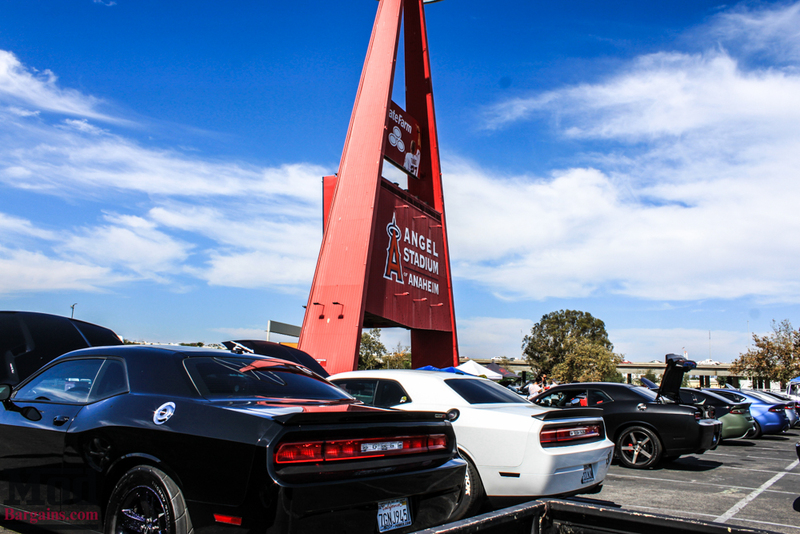 Thanks for joining us, and we’ll see you next time.